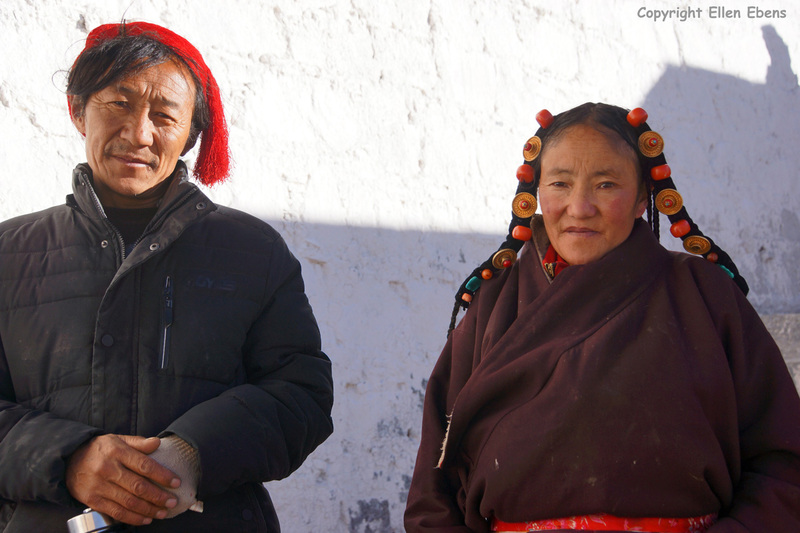 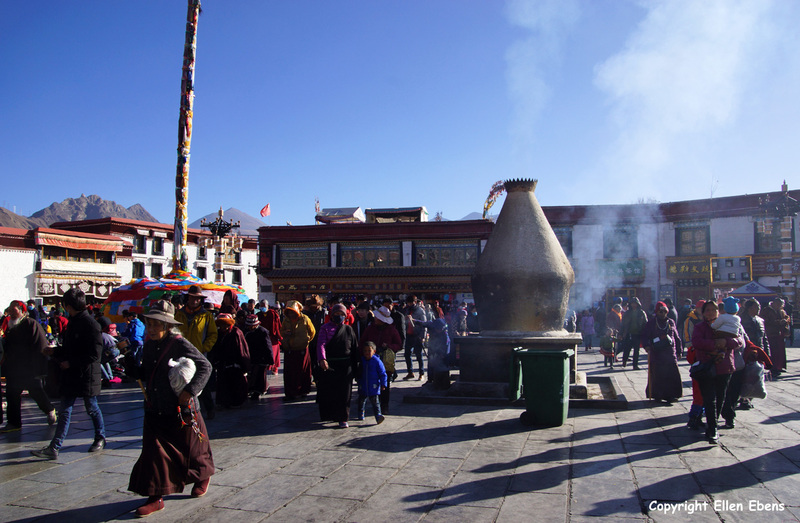 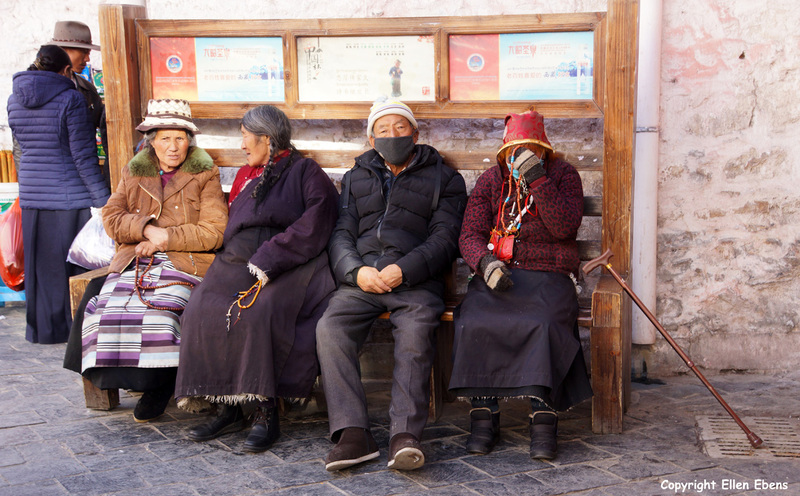 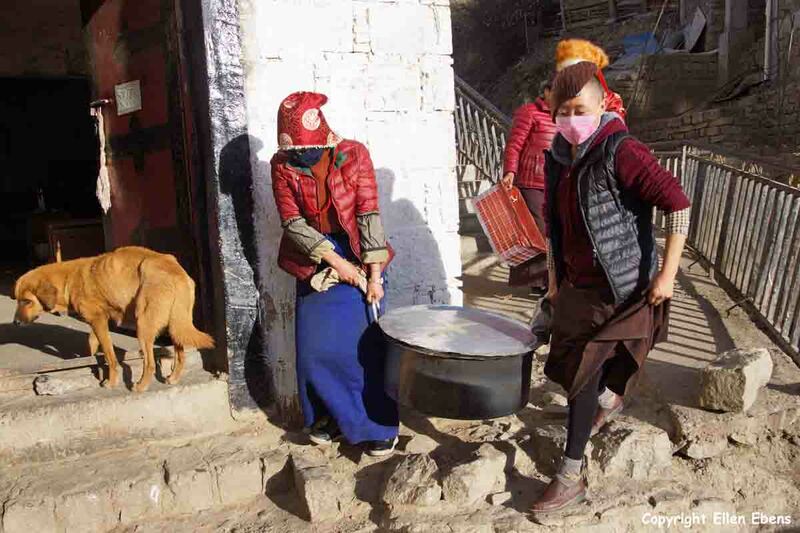 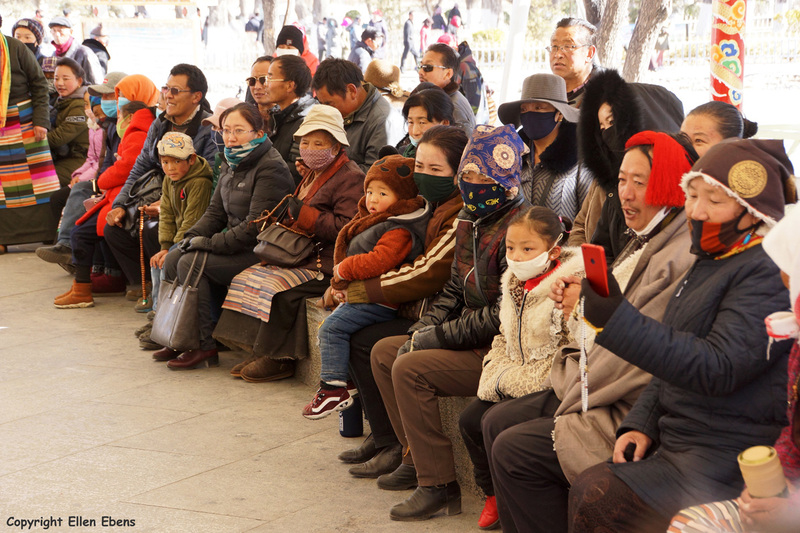 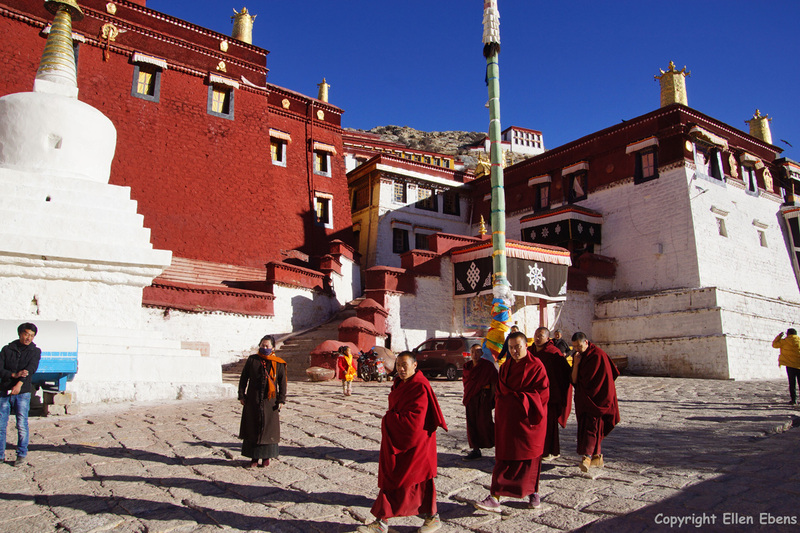 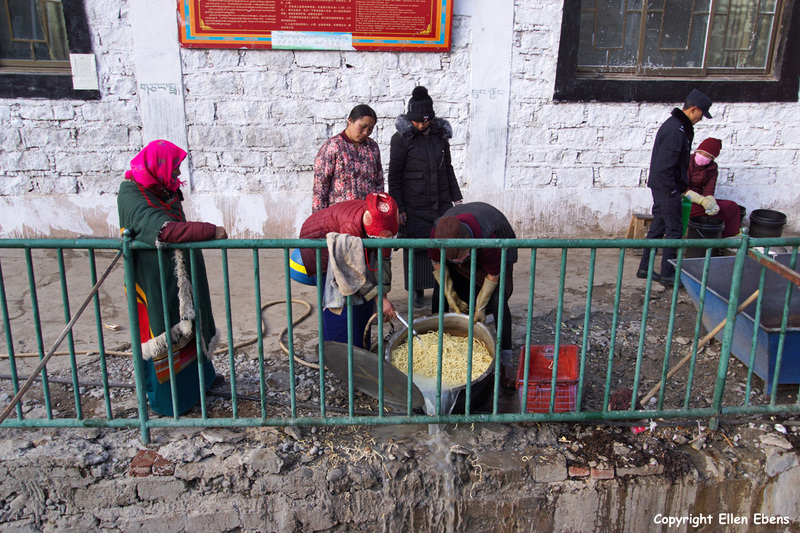 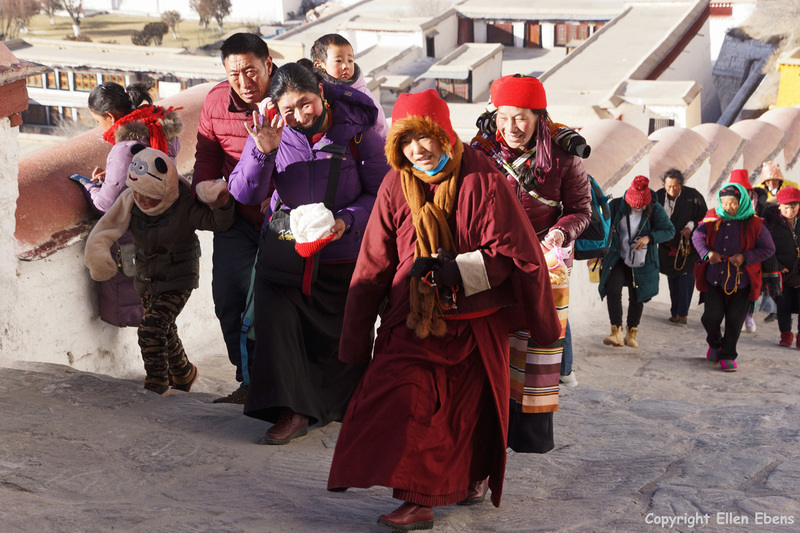 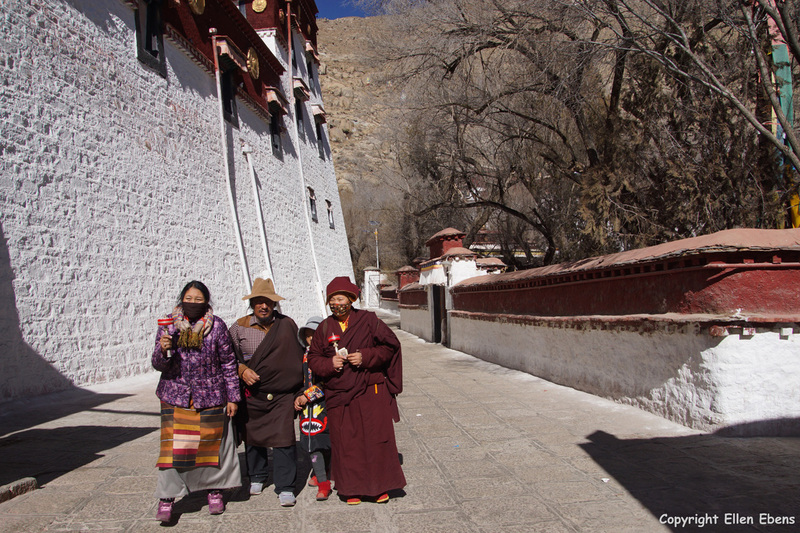 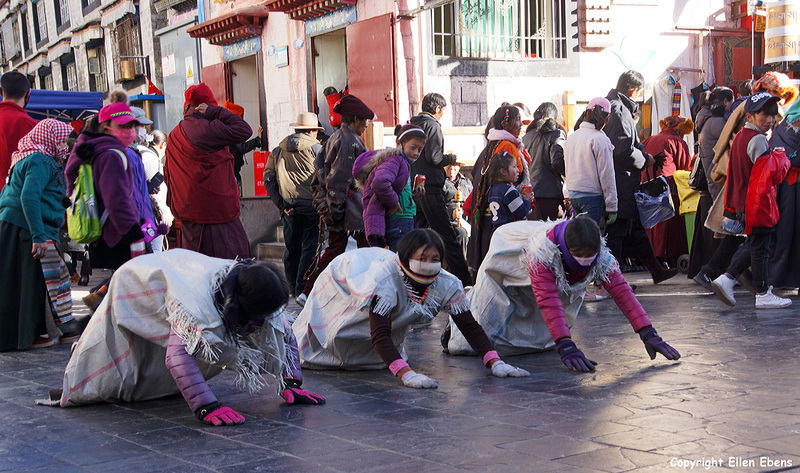 Lhasa, pilgrims in front of the Jokhang Temple. 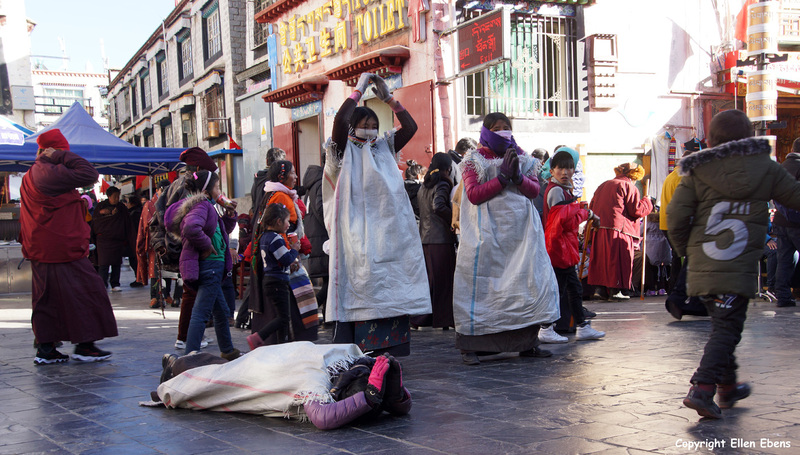 Lhasa, Barkhor street. 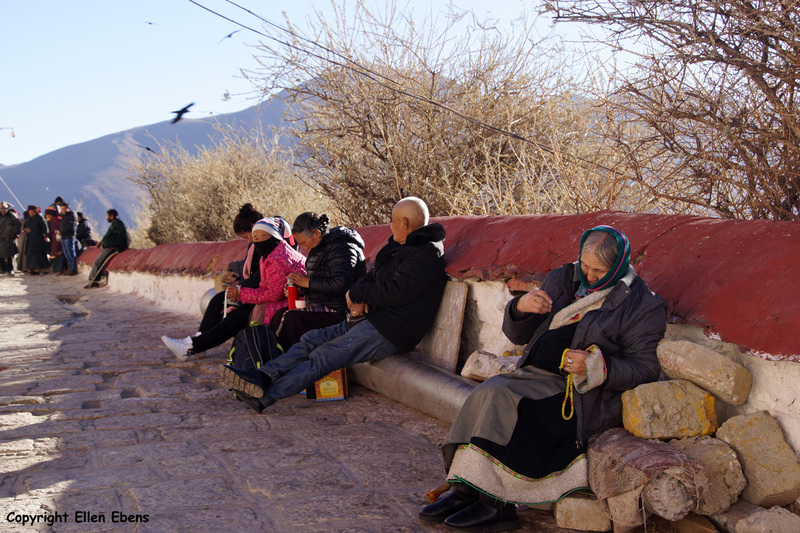 Elderly pilgrims taking a rest. 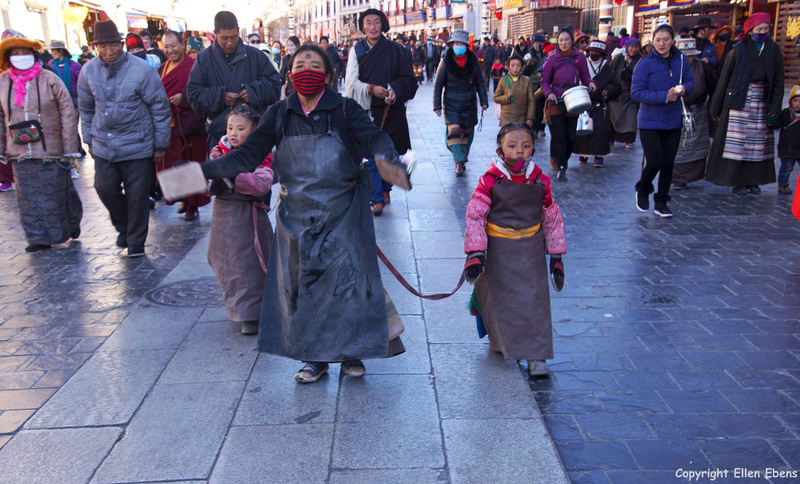 Lhasa, Barkhor Street. 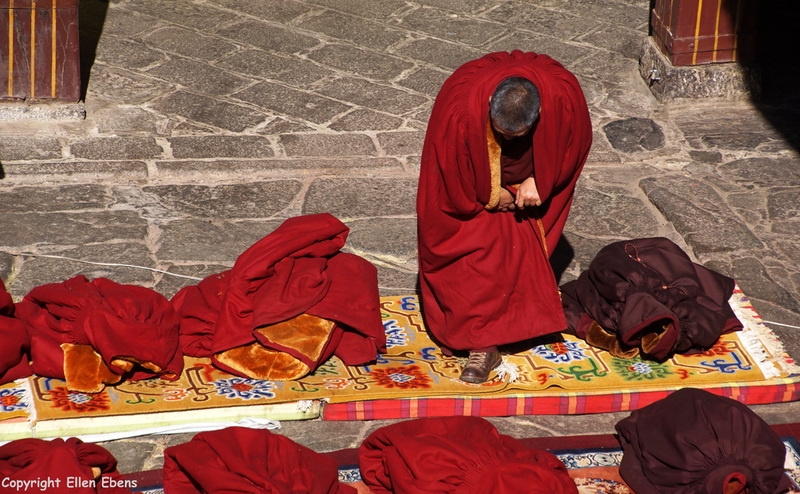 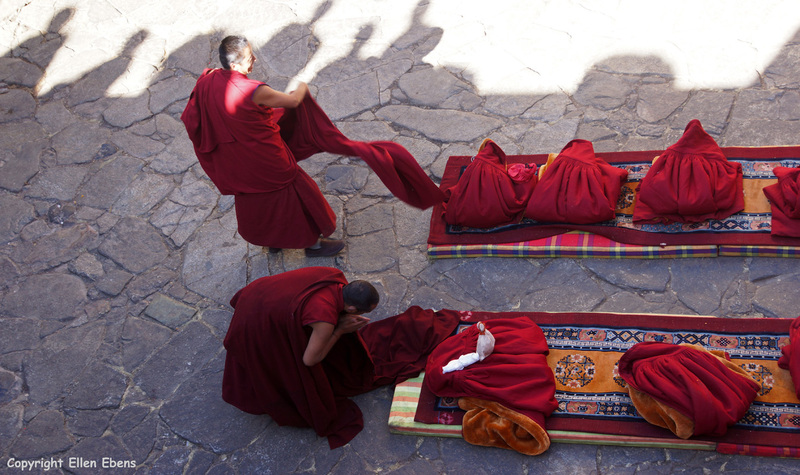 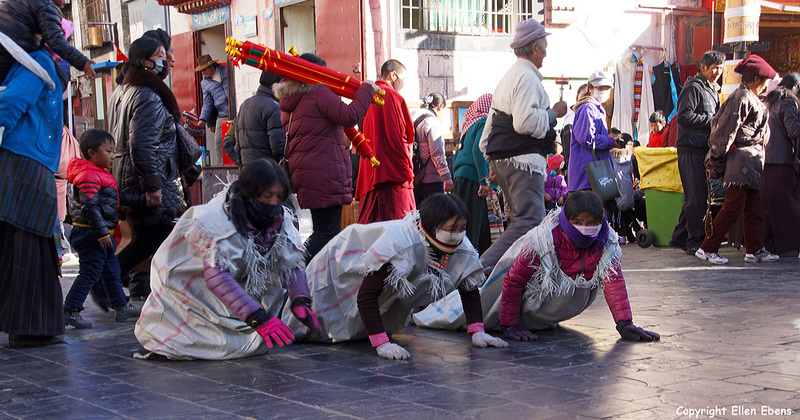 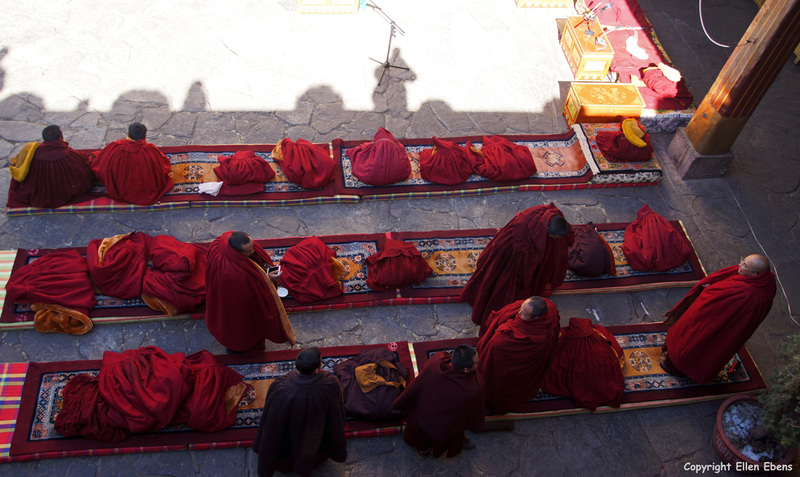 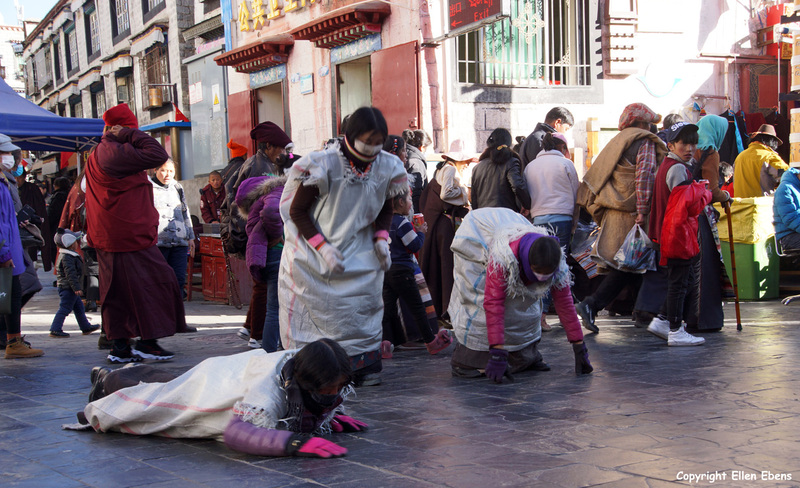 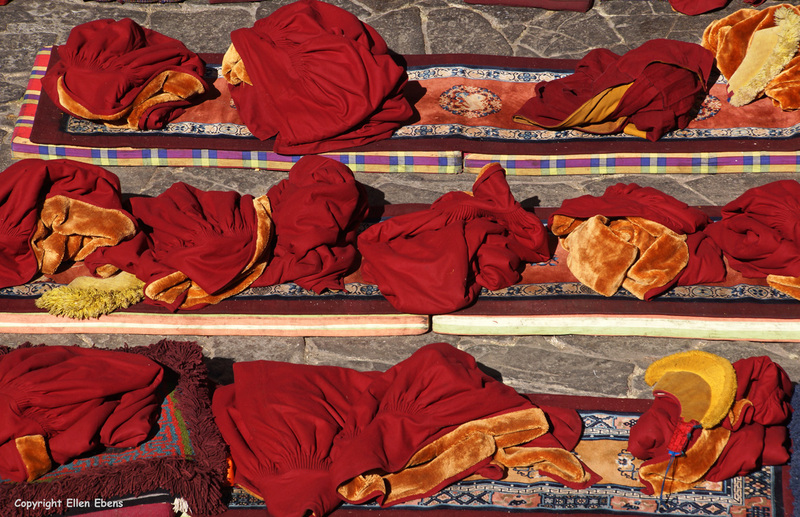 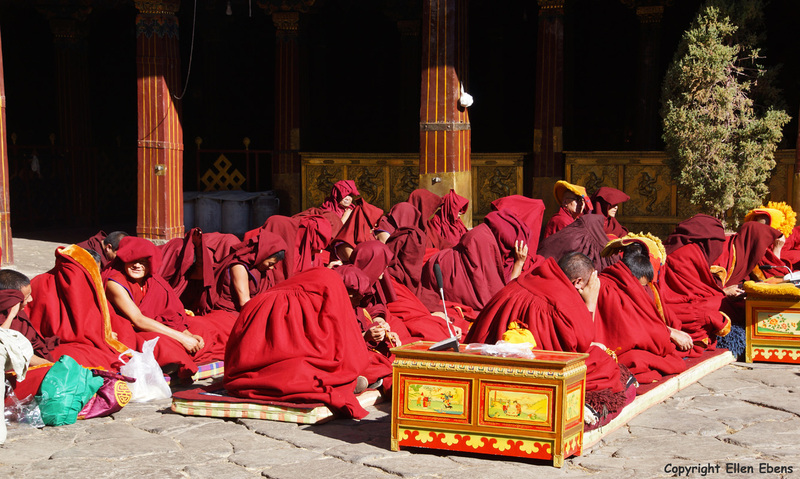 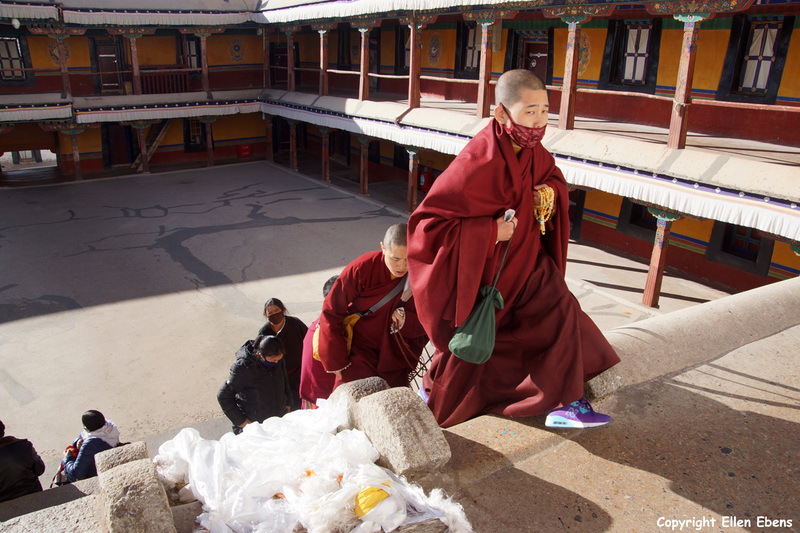 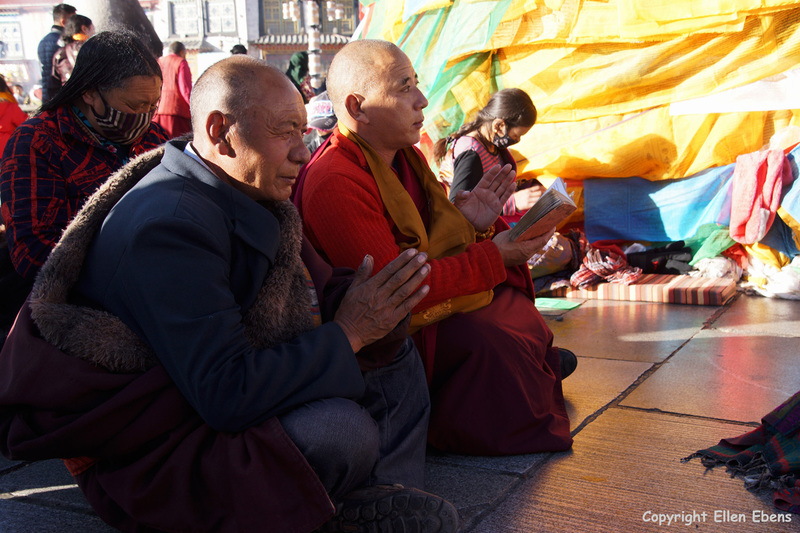 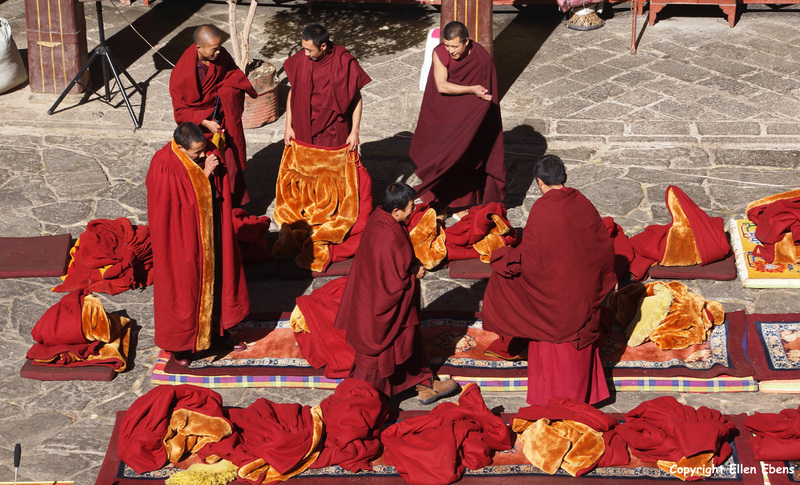 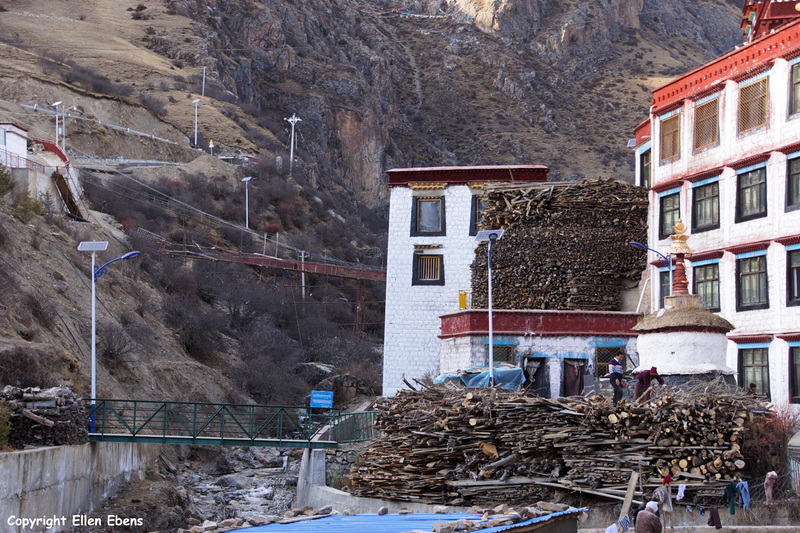 Pilgrims prostrating around the holy Jokhang Temple. 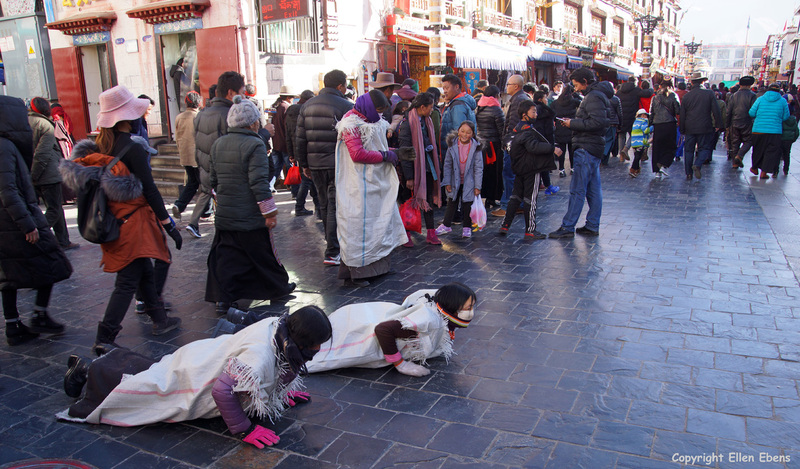 Lhasa, Barkhor Street. 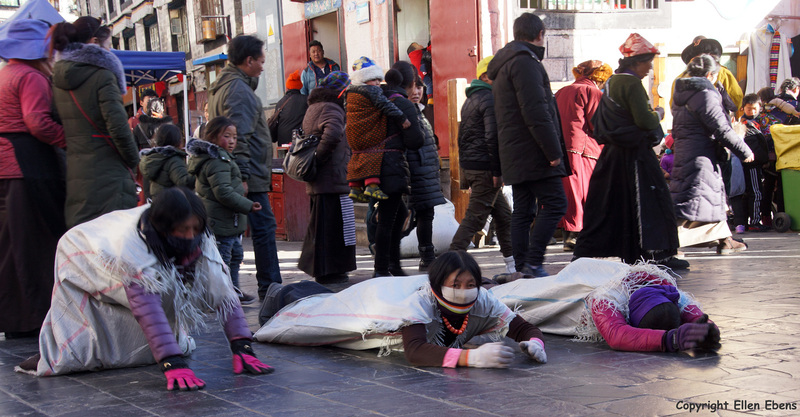 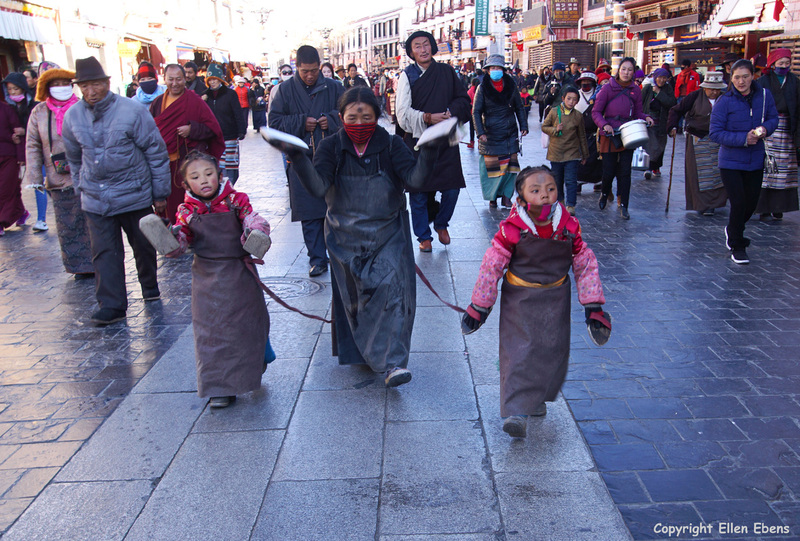 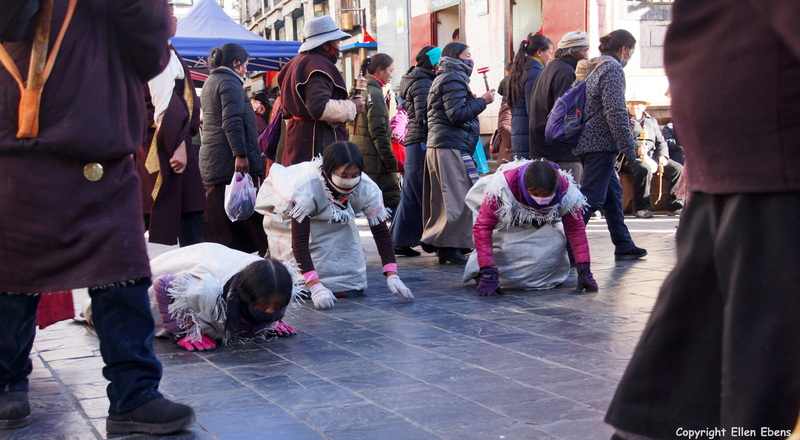 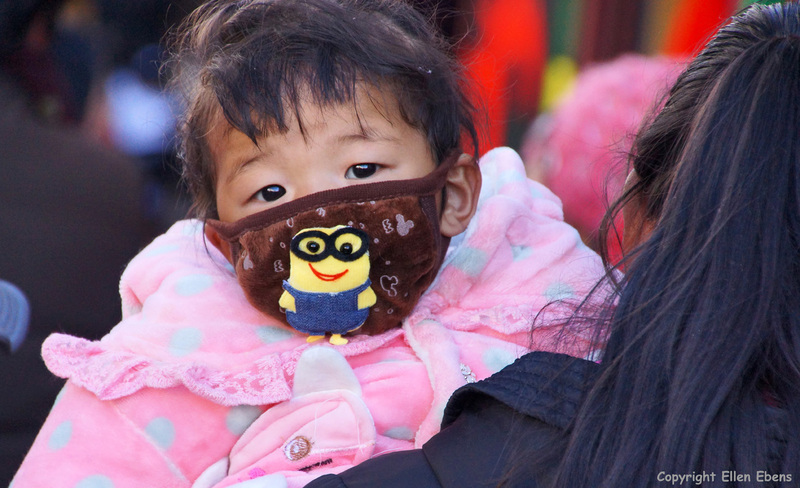 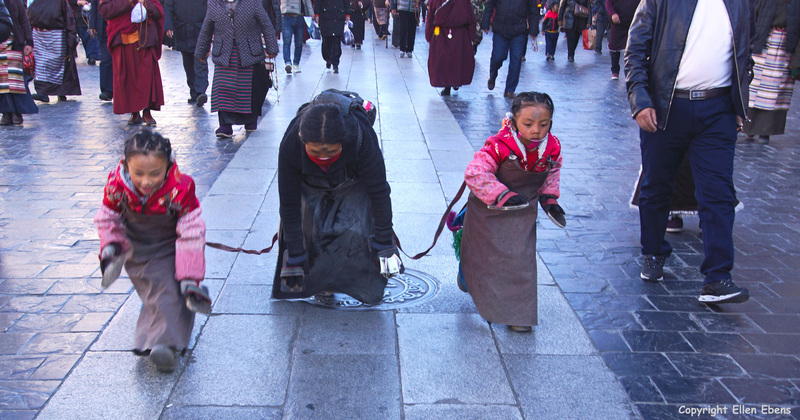 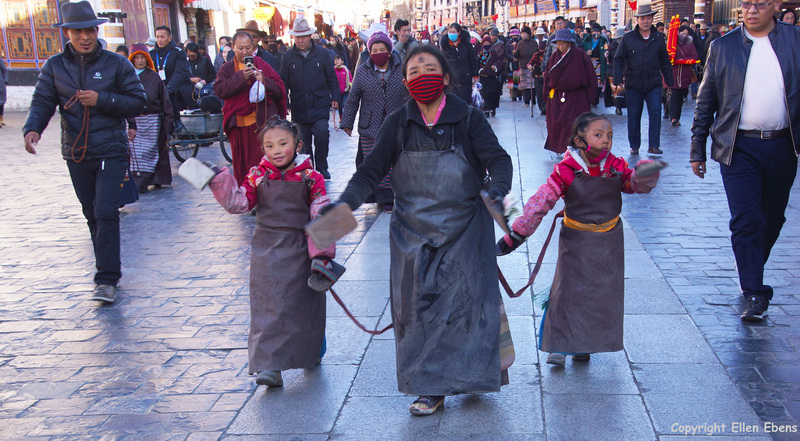 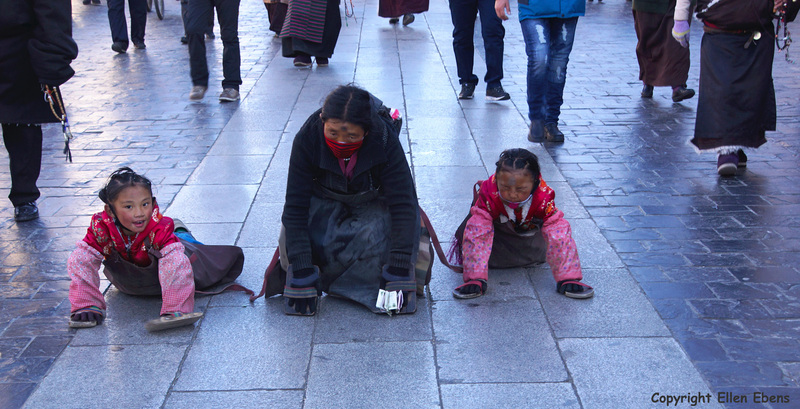 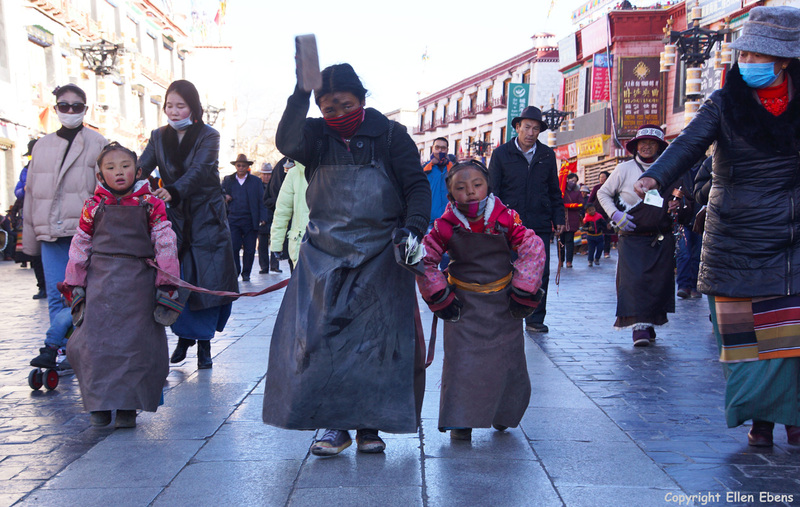 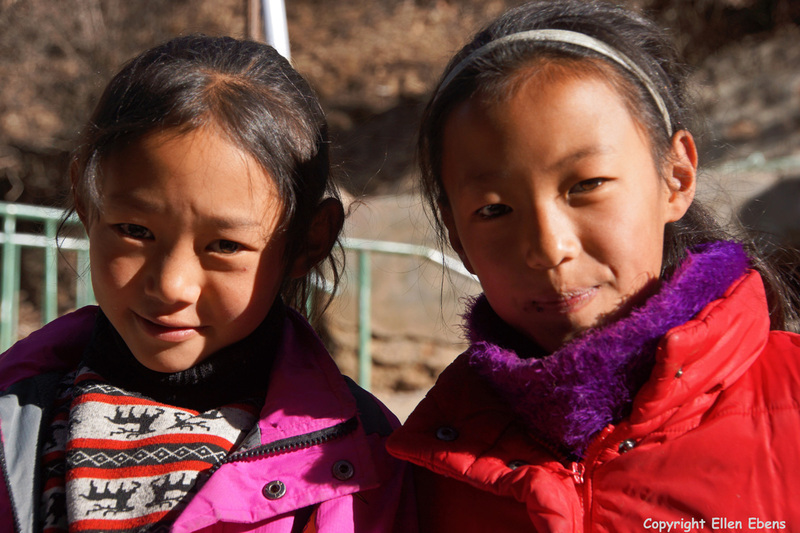 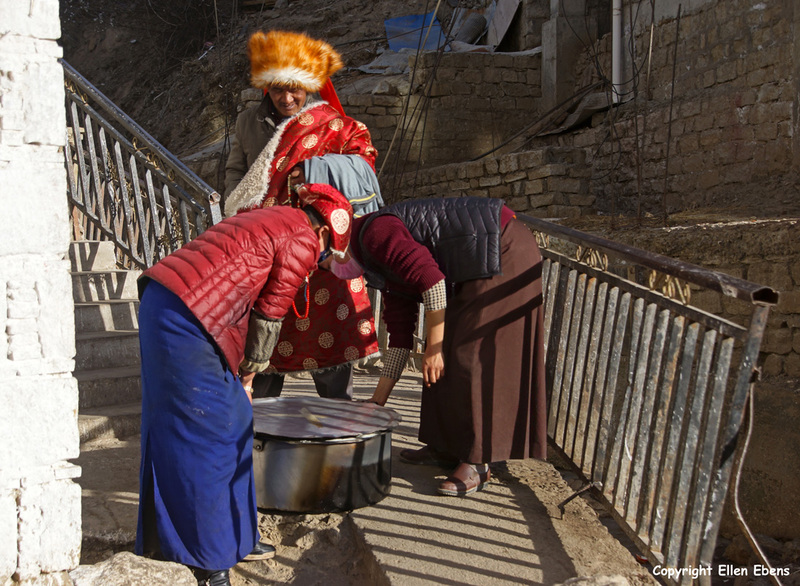 A mother and her two young daughters prostrating around the holy Jokhang Temple. 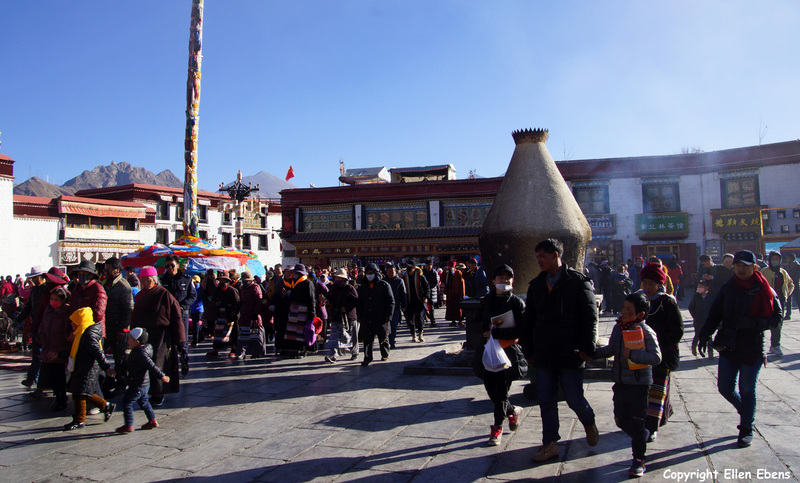 Lhasa, Barkhor Street. 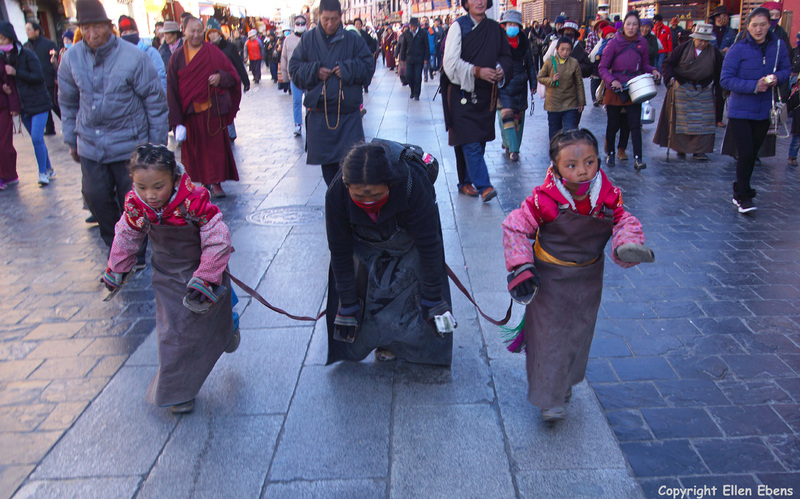 A baby girl carried by her mother. 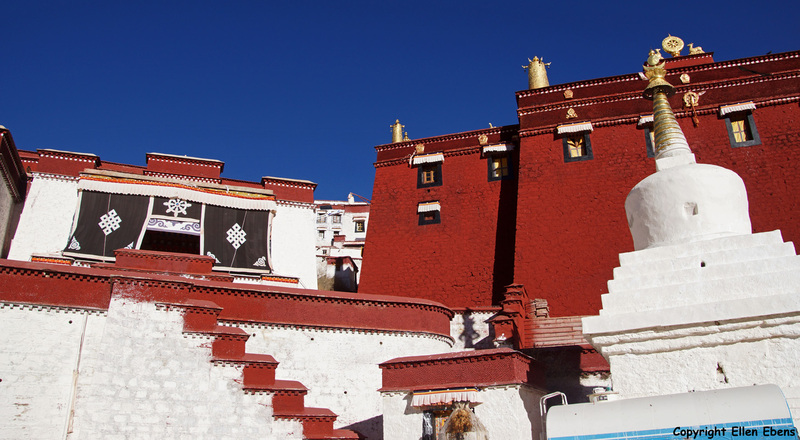 Lhasa, the Potala Palace. 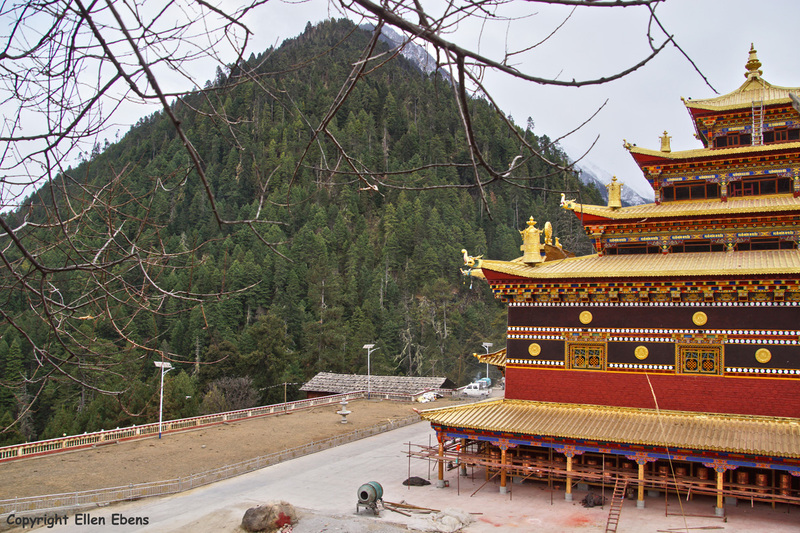 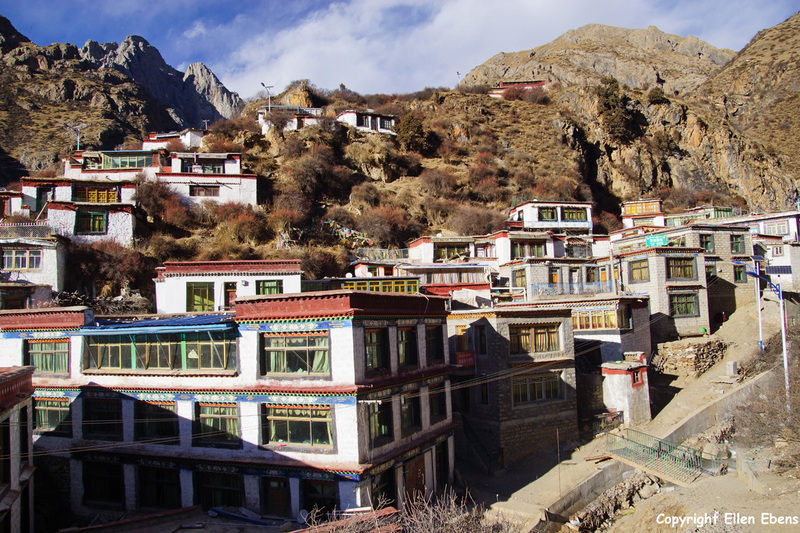 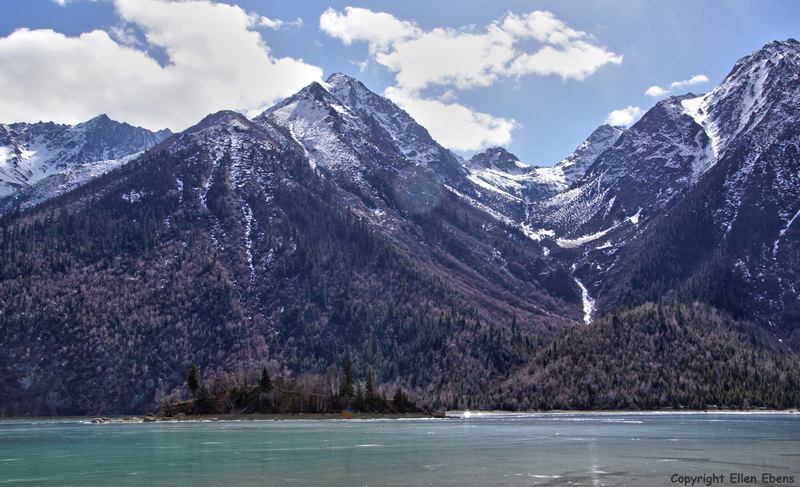 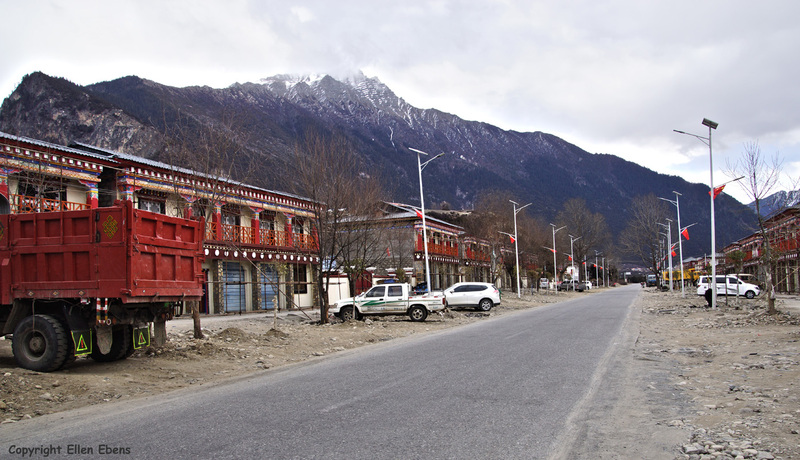 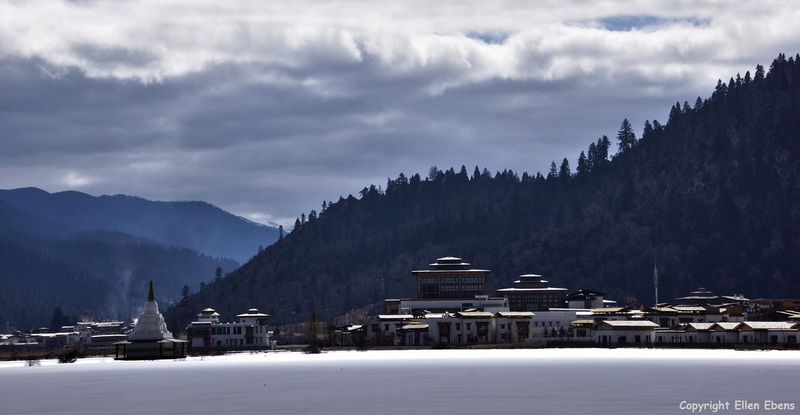 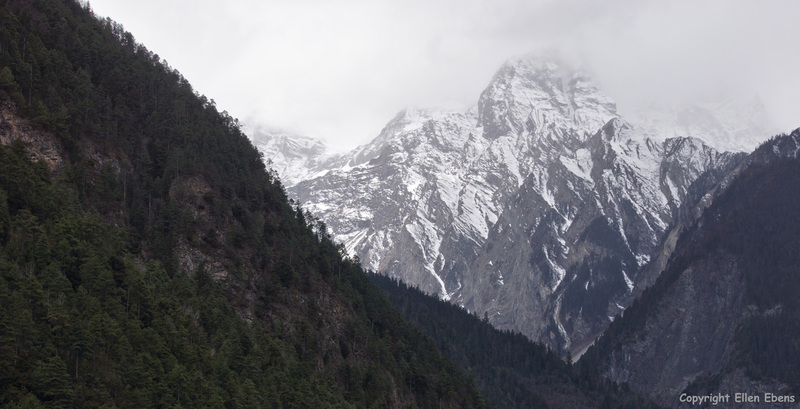 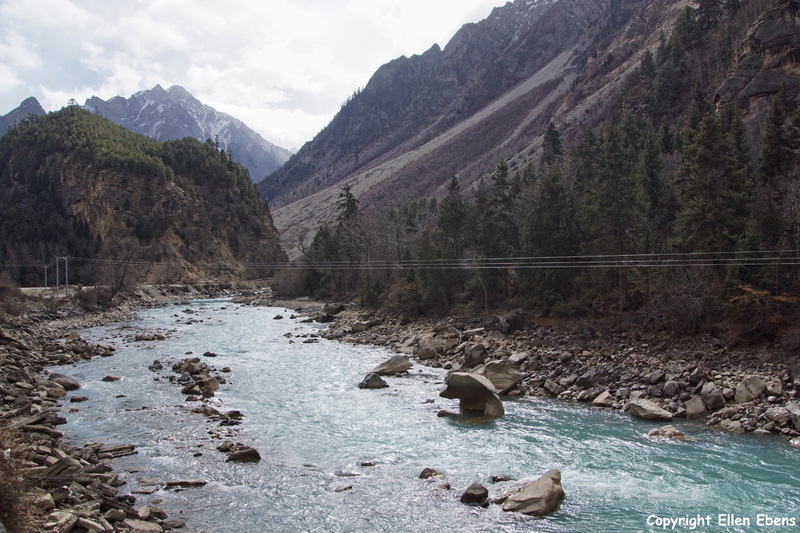 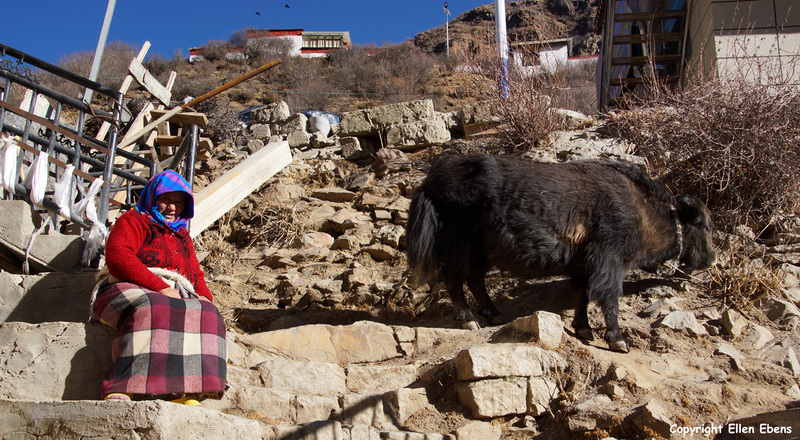 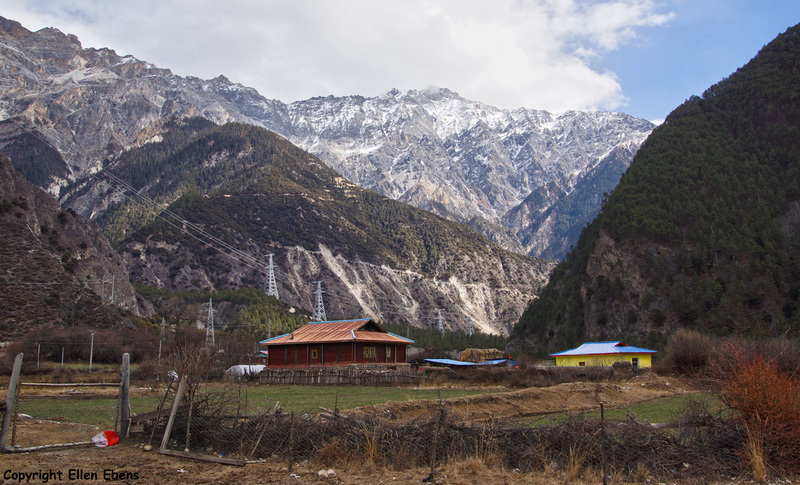 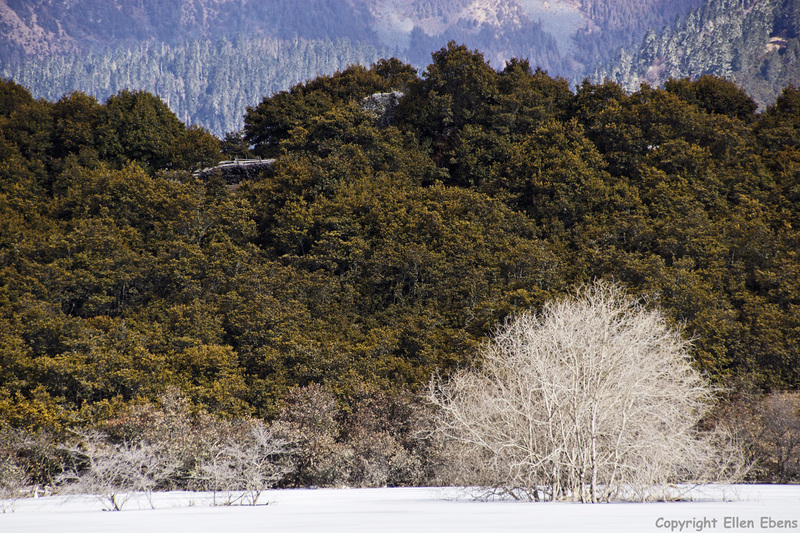 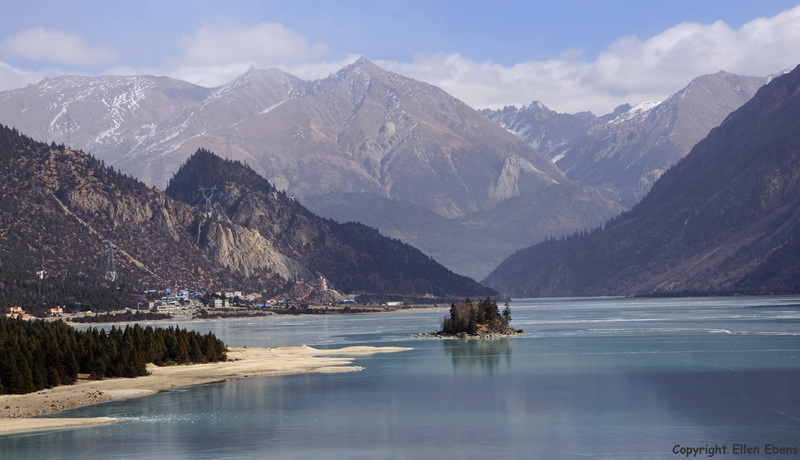 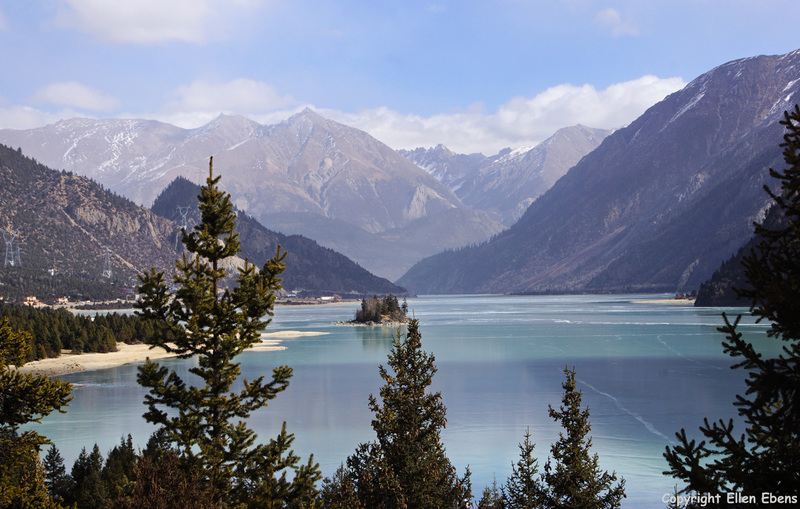 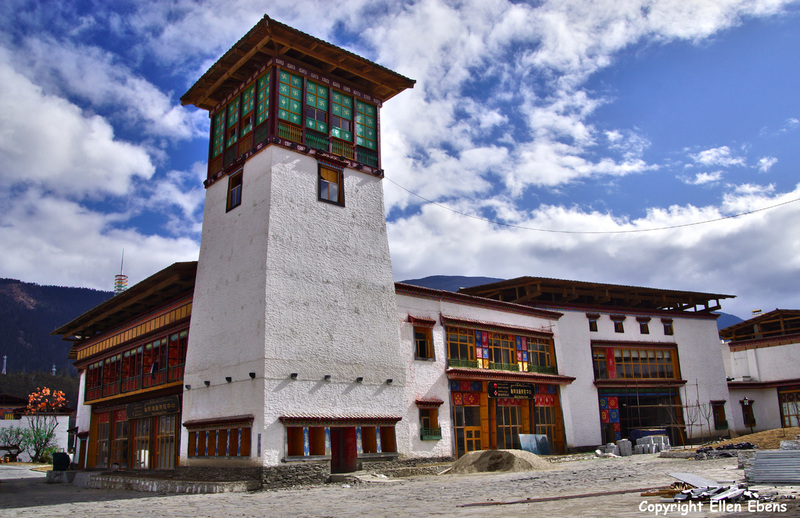 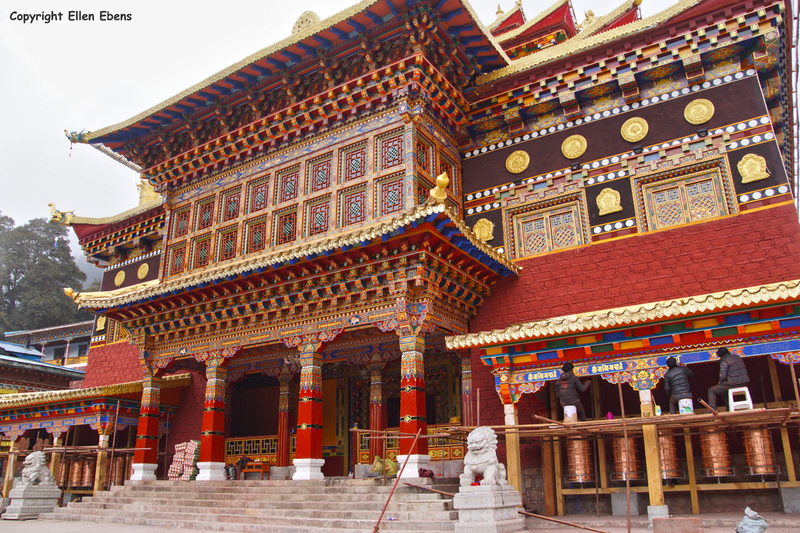 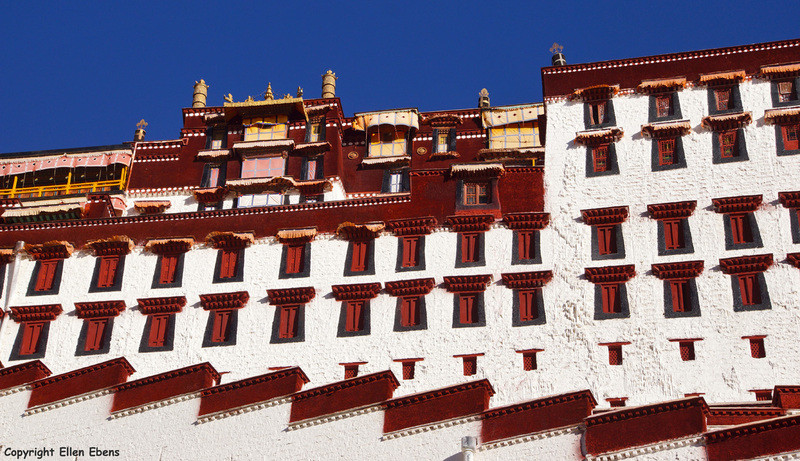 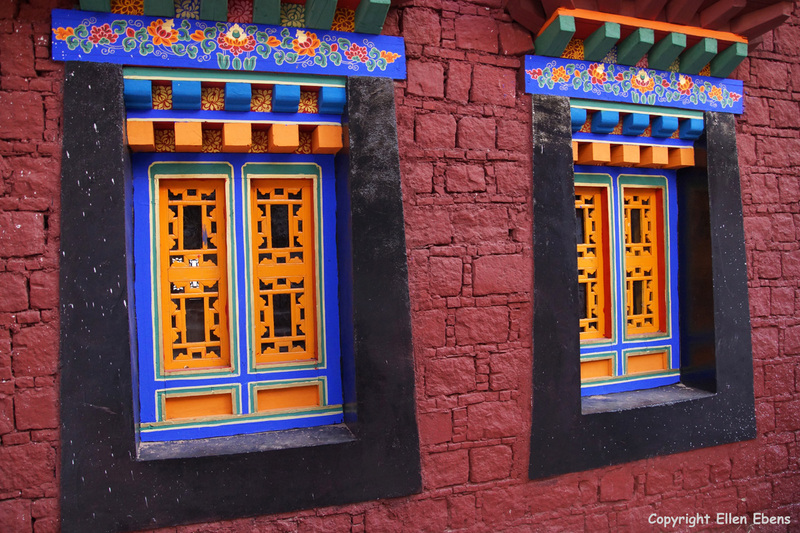 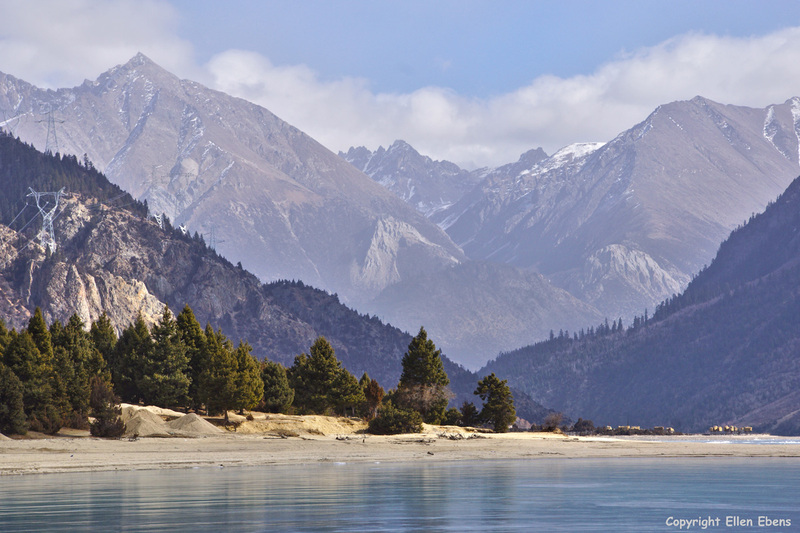 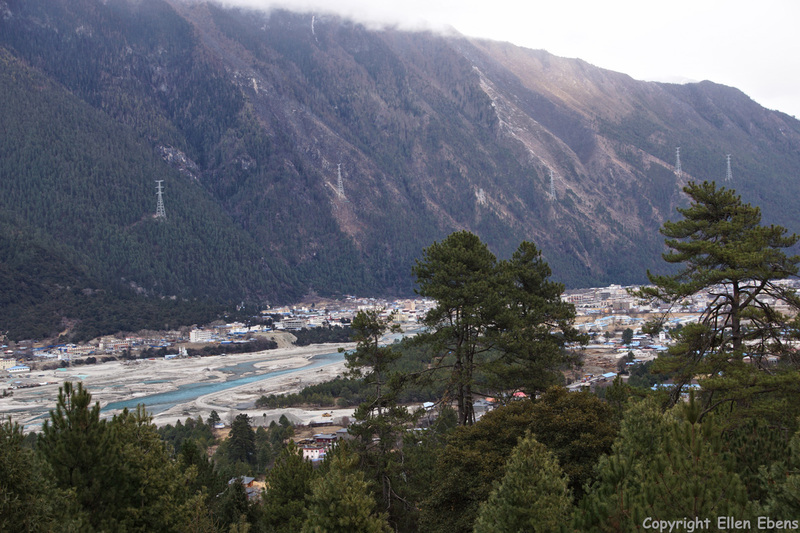 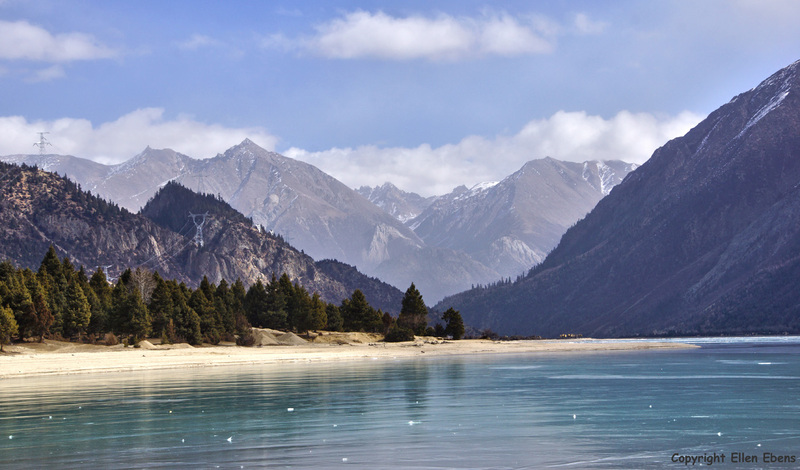 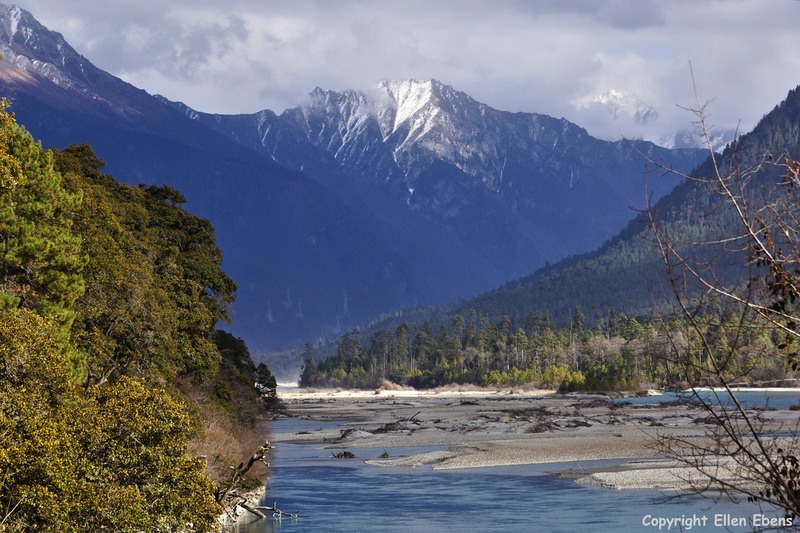 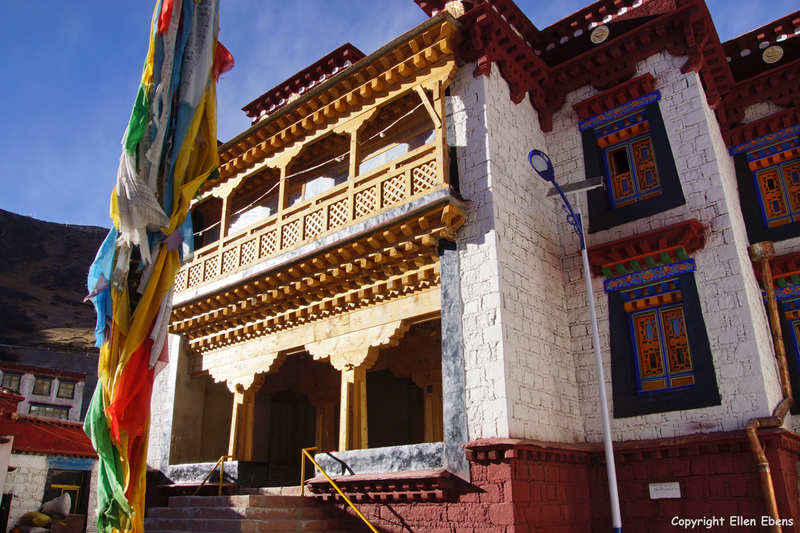 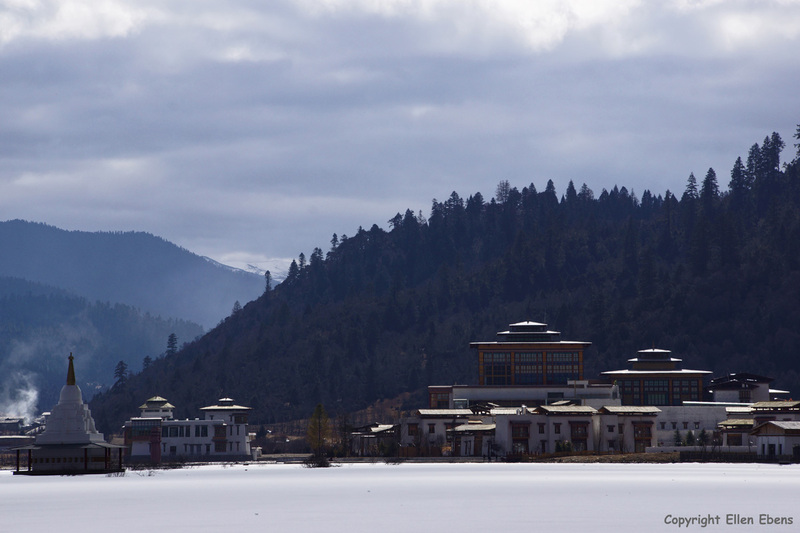 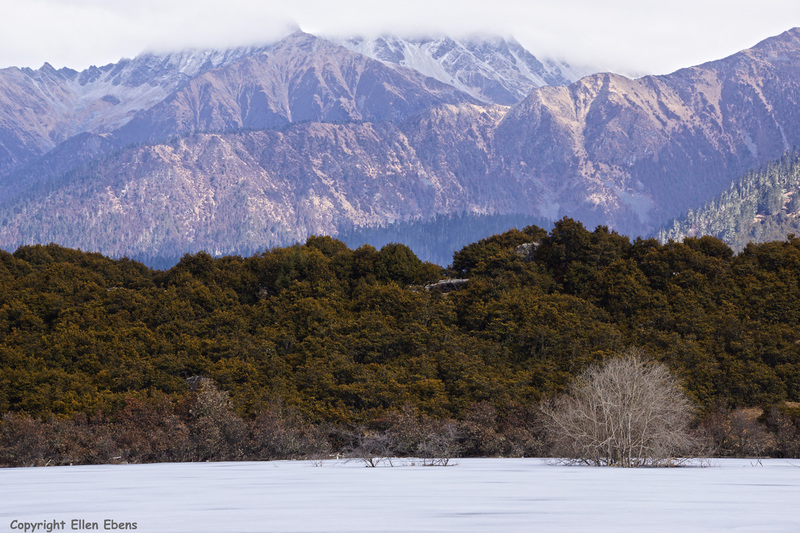 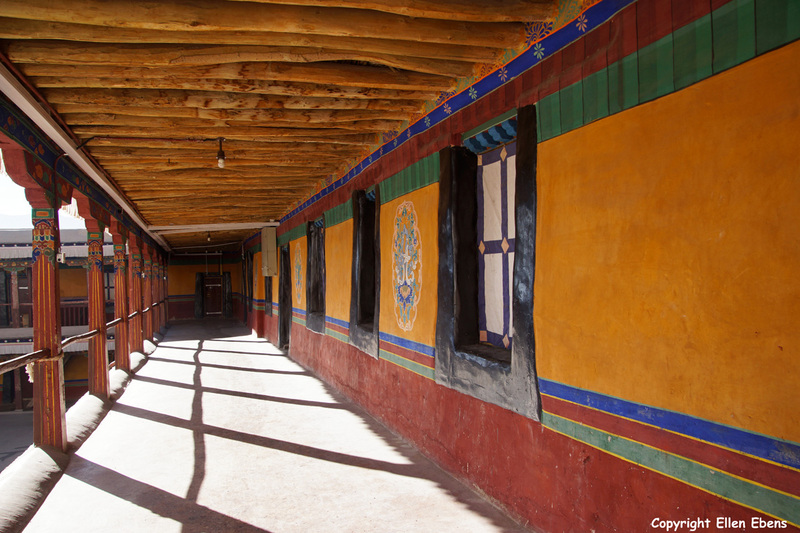 It was the winter residence of the Dalai Lamas. 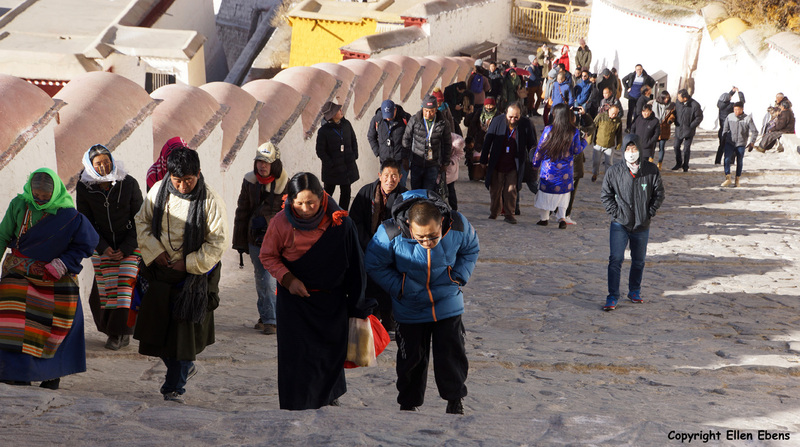 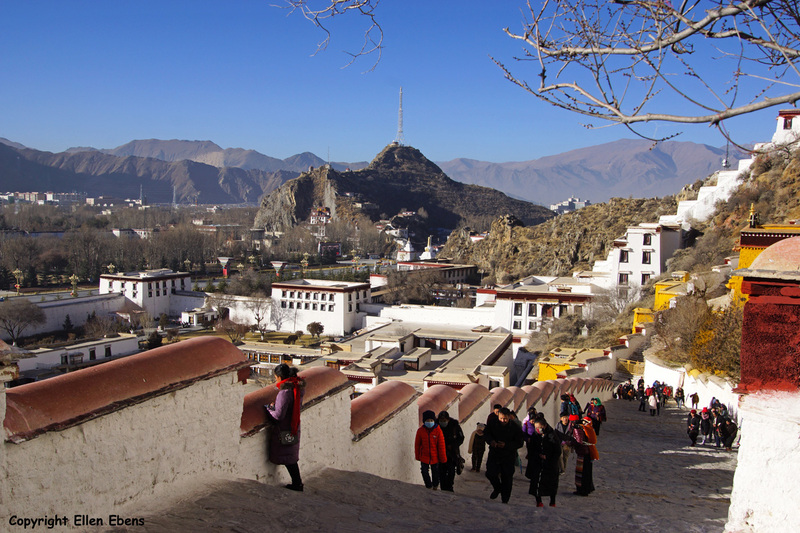 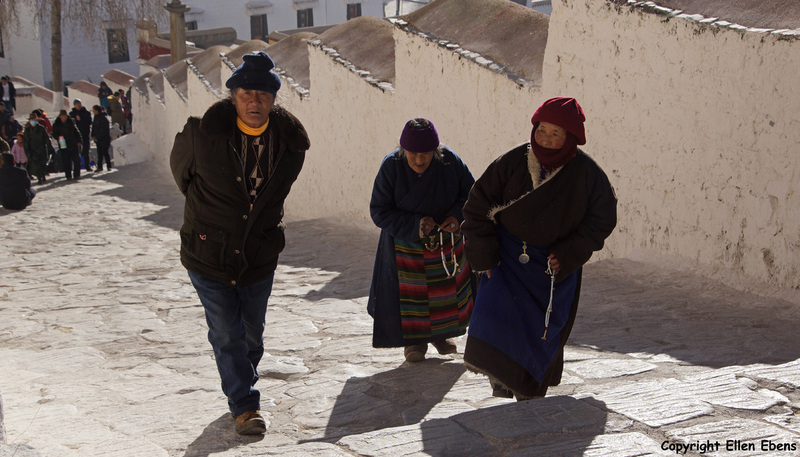 Lhasa, pilgrims climbing up the stairs to the Potala Palace. 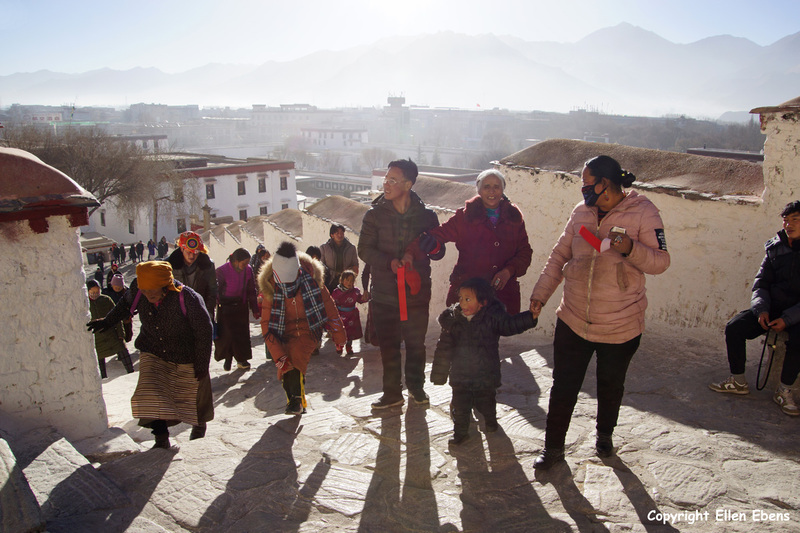 Lhasa, portrait of a couple climbing up the stairs to the Potala Palace. 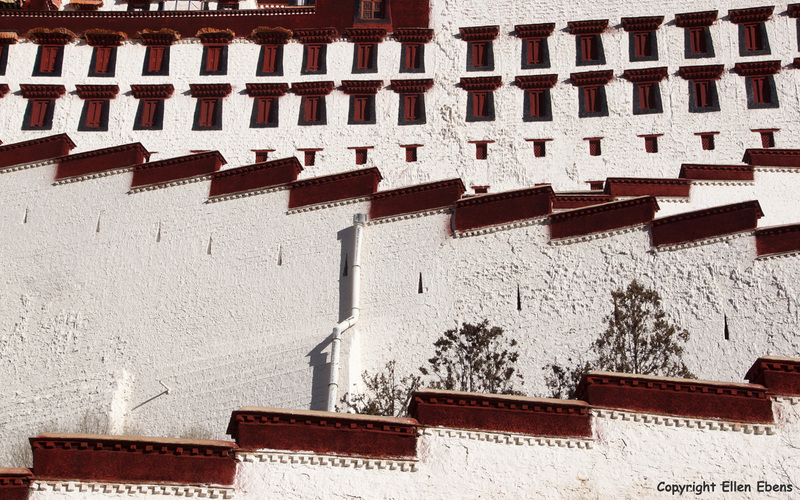 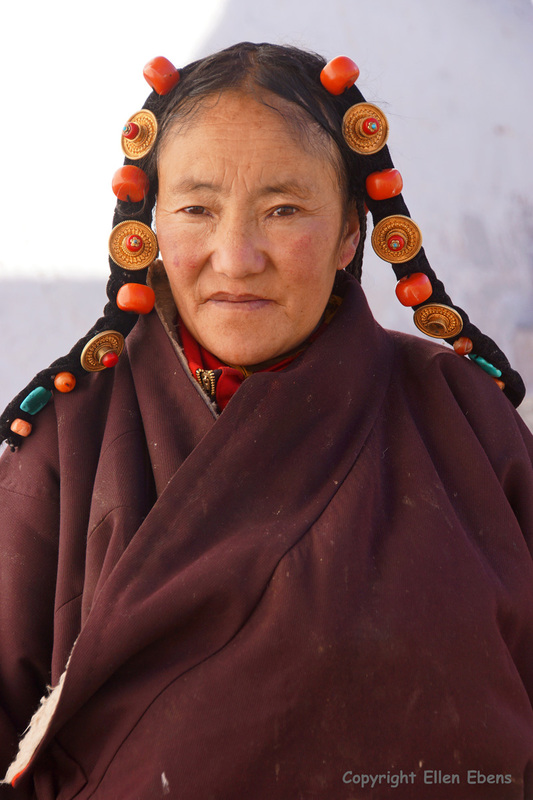 Lhasa, portrait of a woman climbing up the stairs to the Potala Palace. 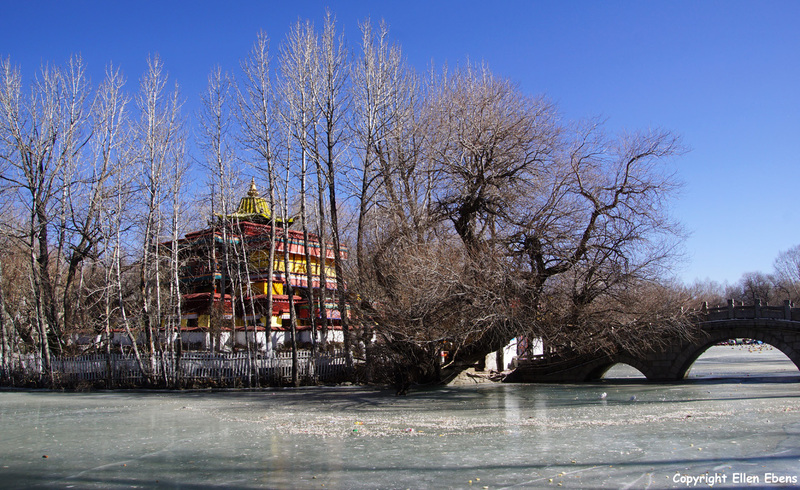 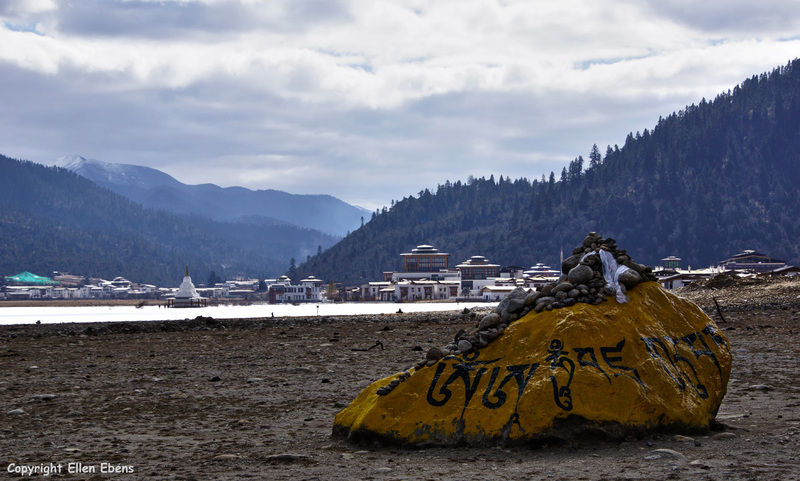 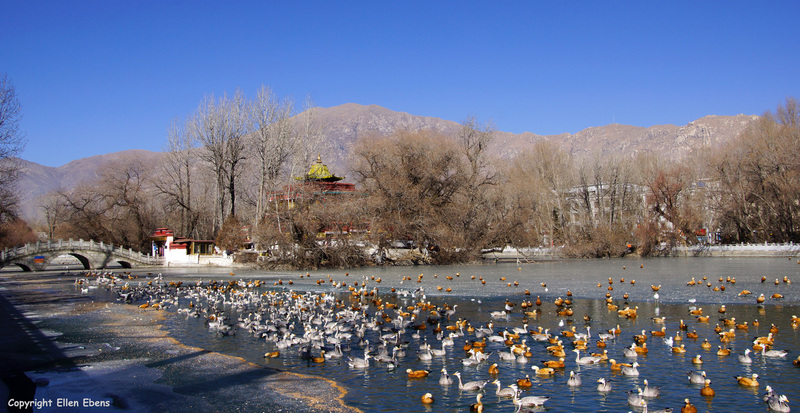 Lhasa, The Lukhang (Naga temple) in the lake behind the Potala Palace. 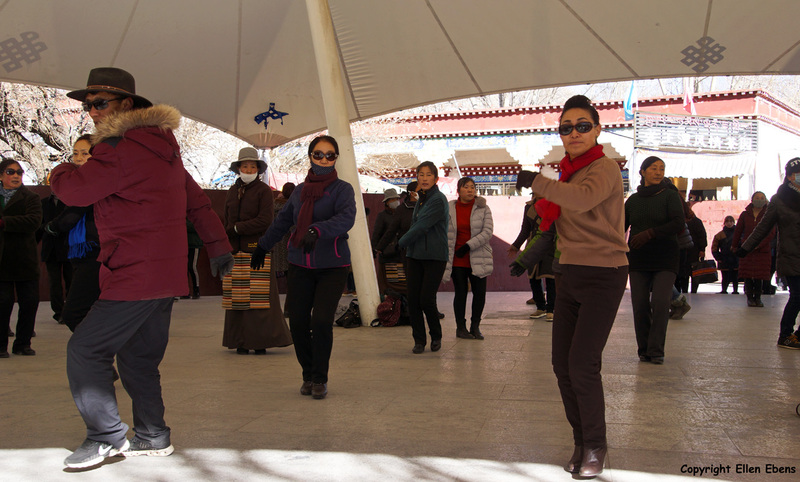 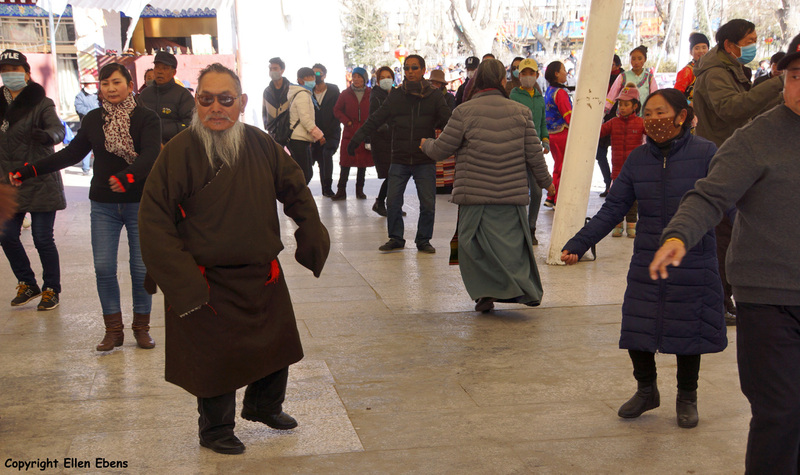 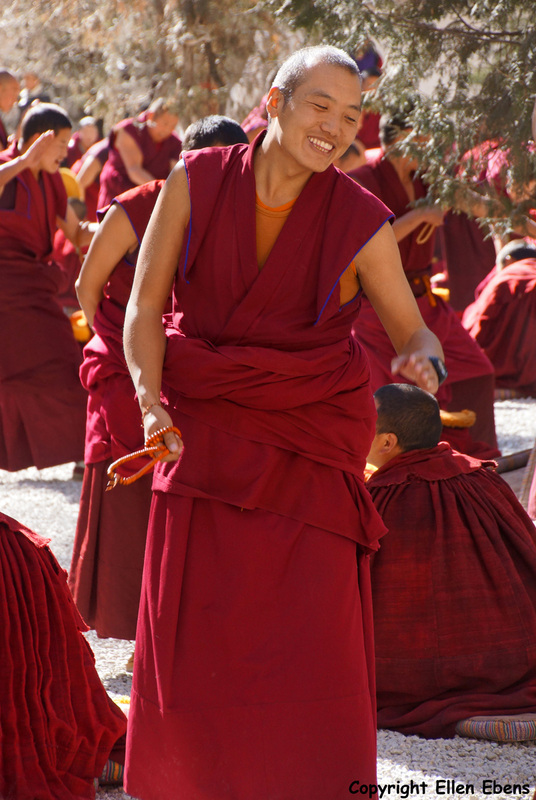 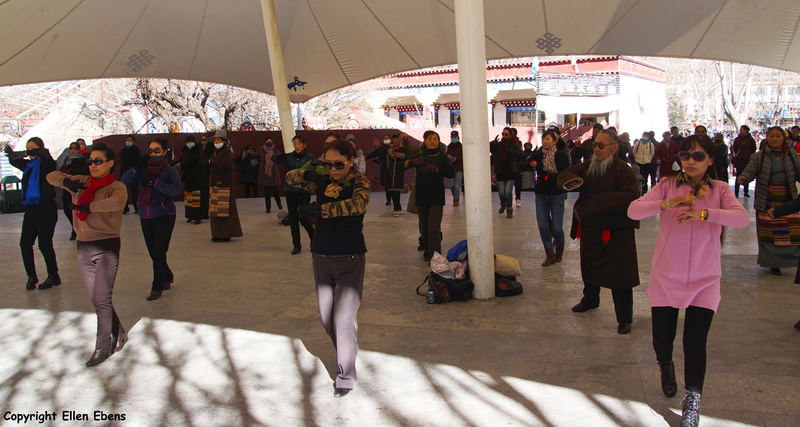 Lhasa, people dancing in the park behind the Potala Palace. 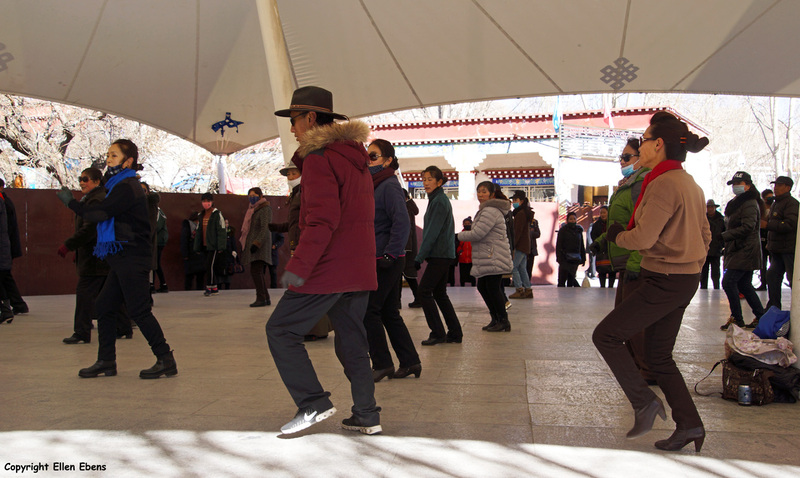 Lhasa, people looking at the dancing in the park behind the Potala Palace. 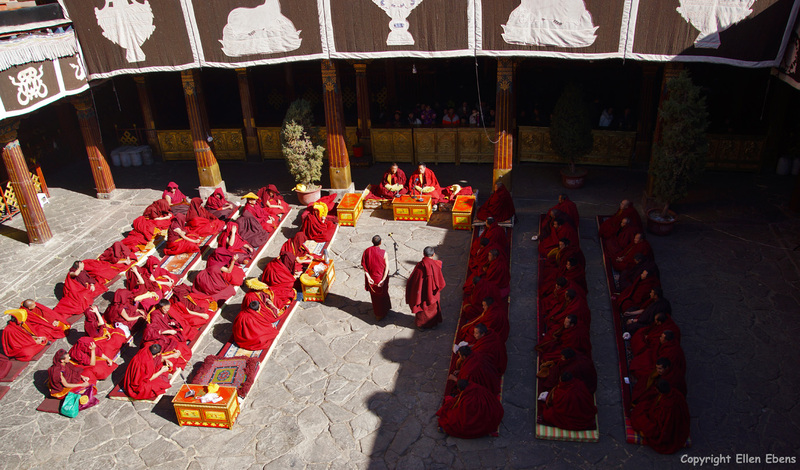 Lhasa, monks debating at the court yard of the Jokhang Temple. 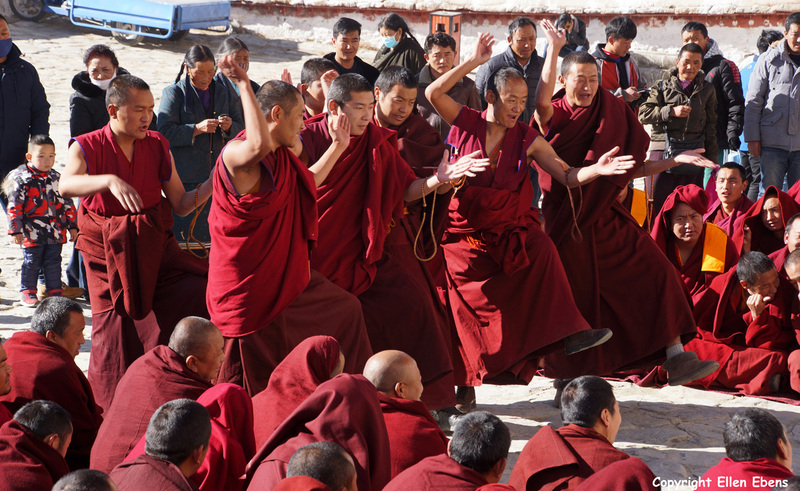 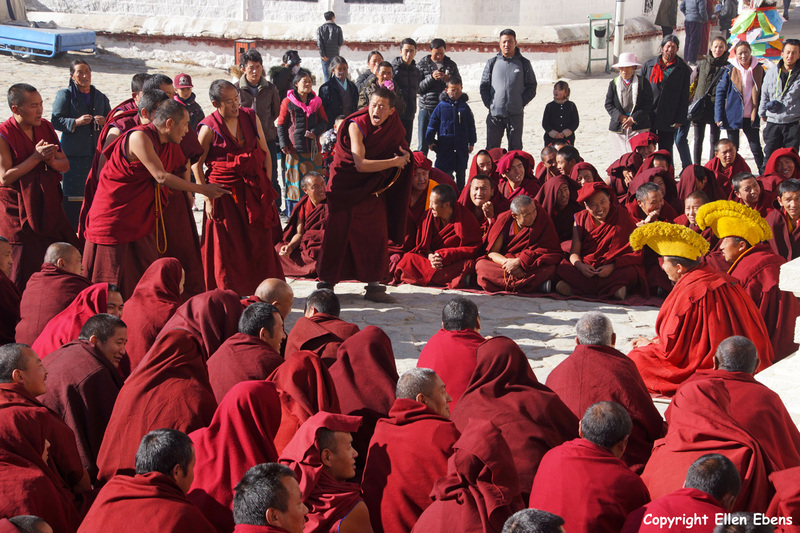 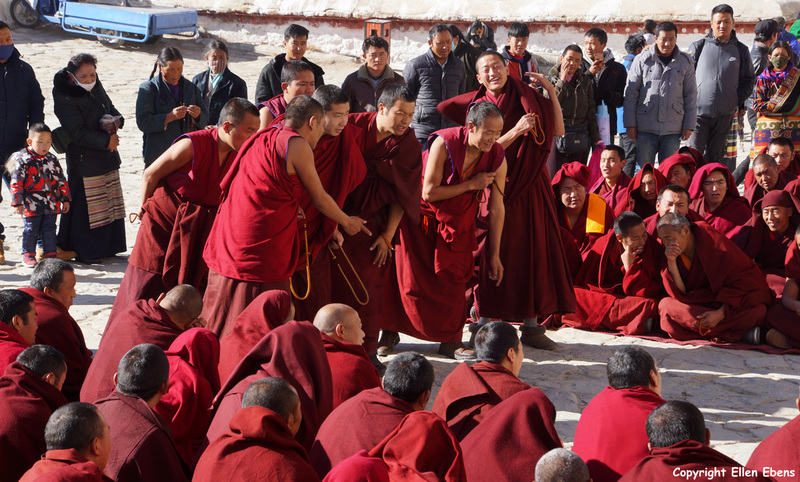 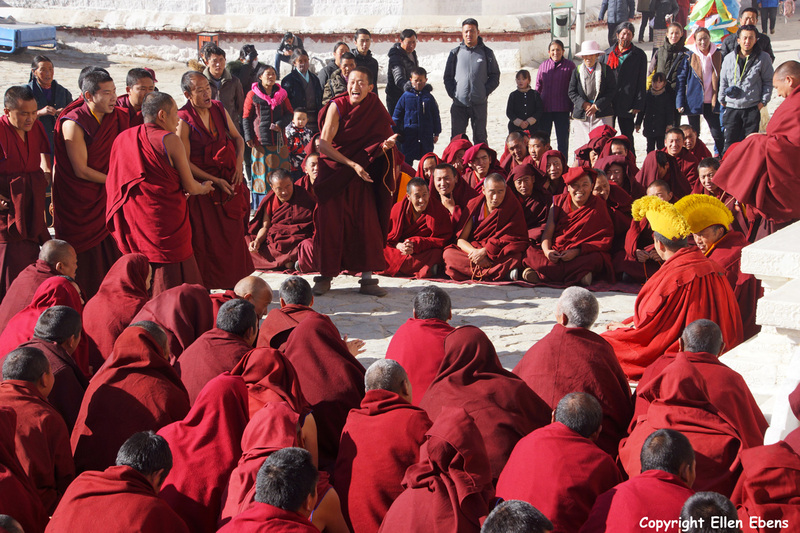 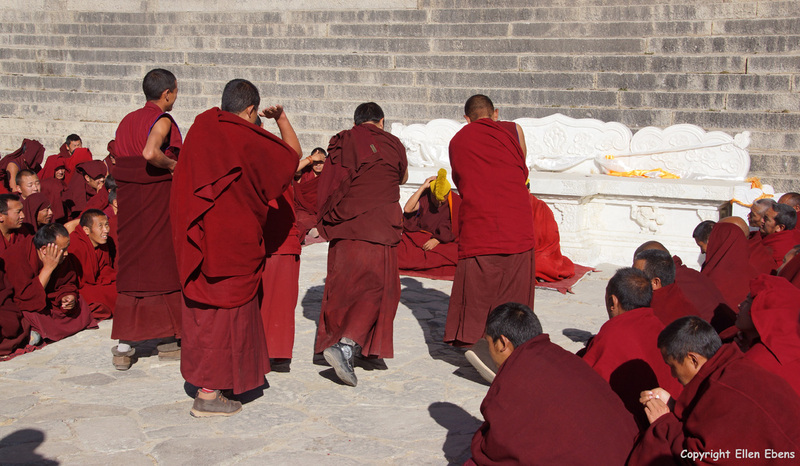 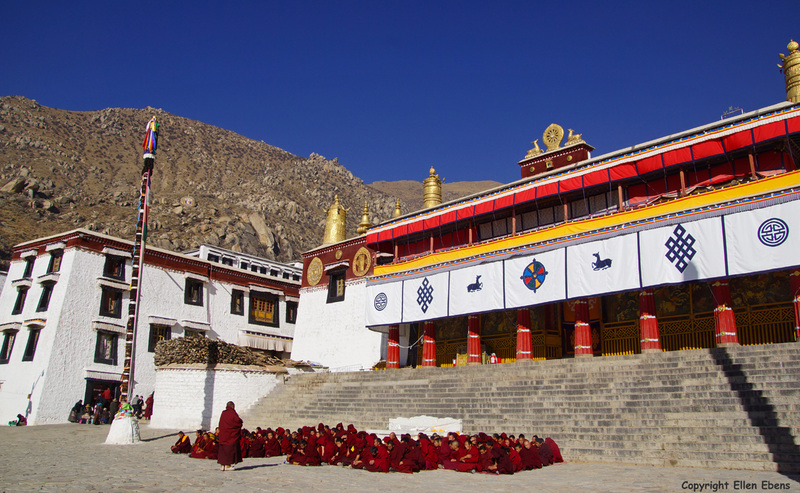 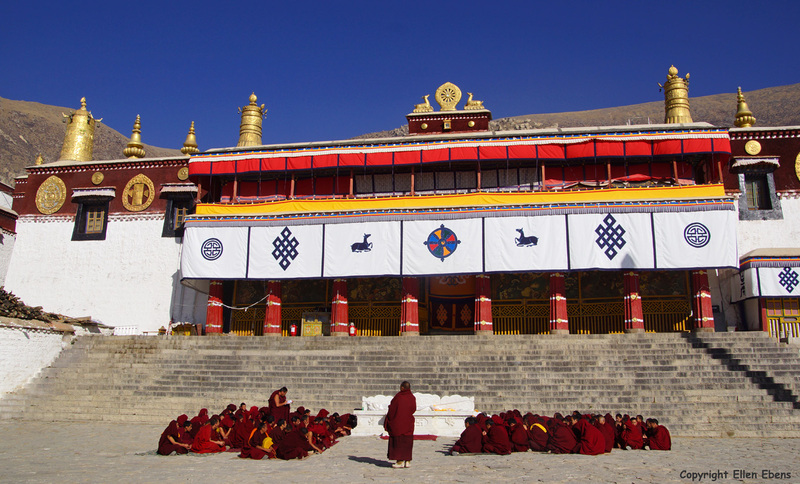 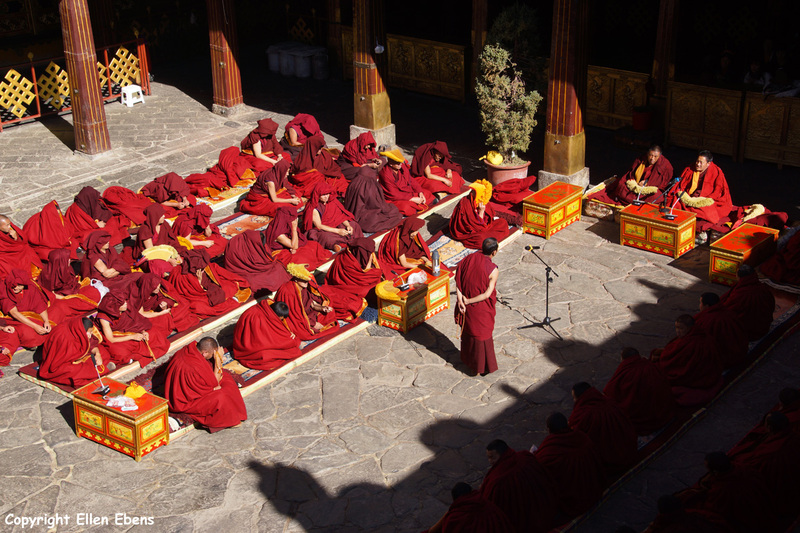 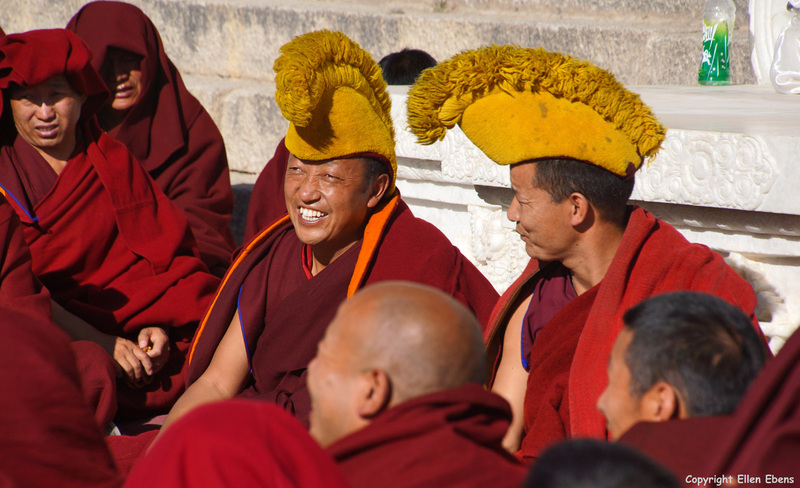 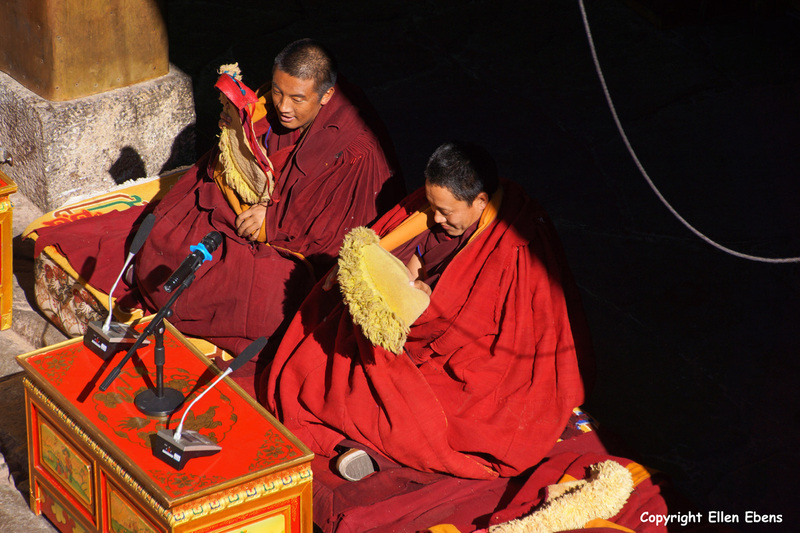 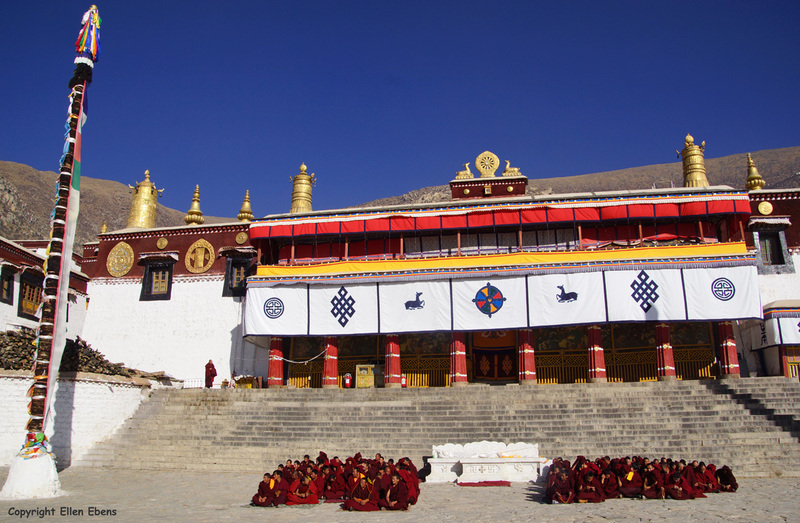 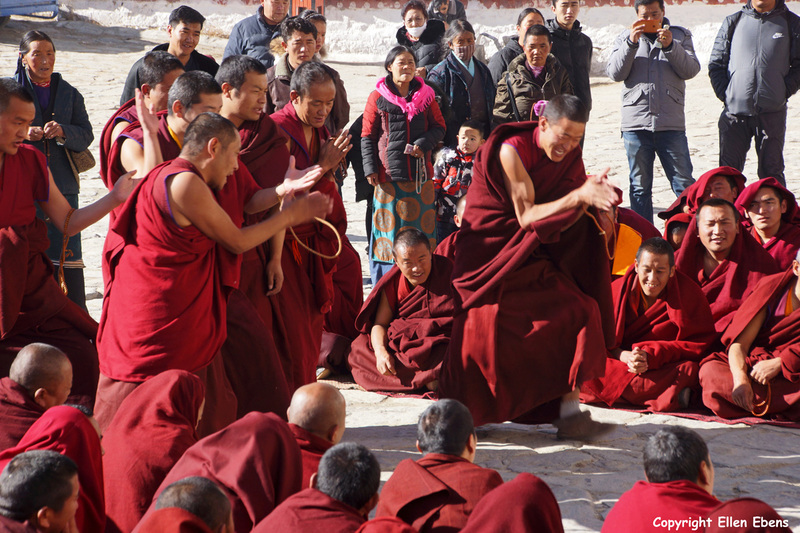 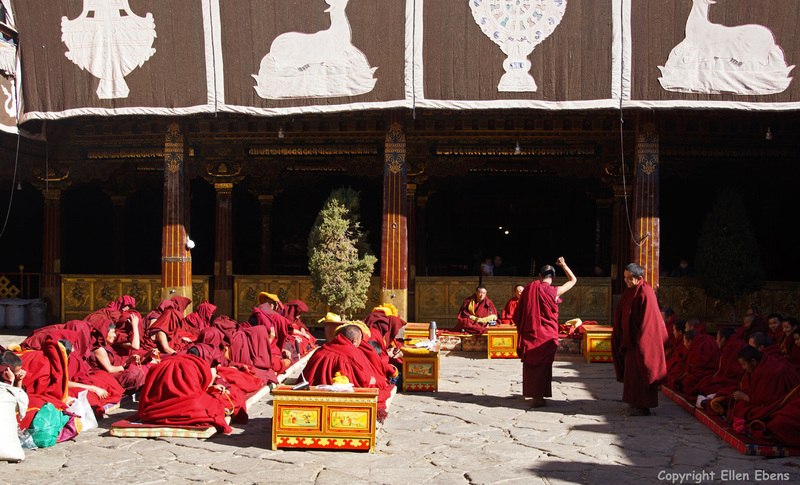 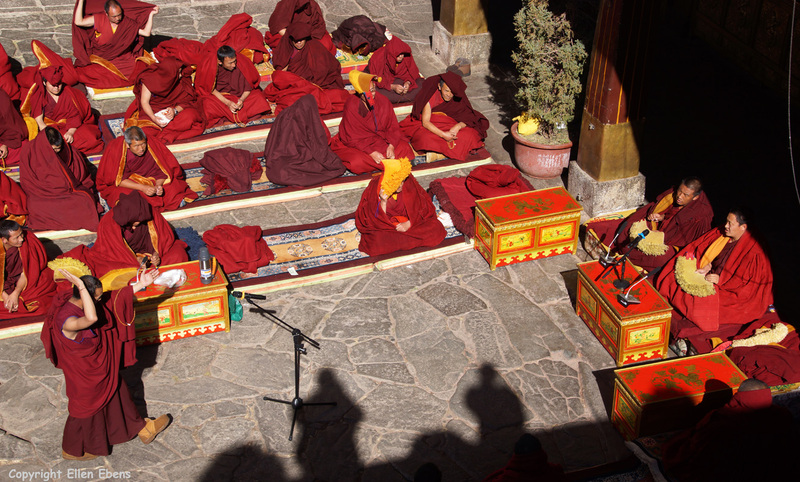 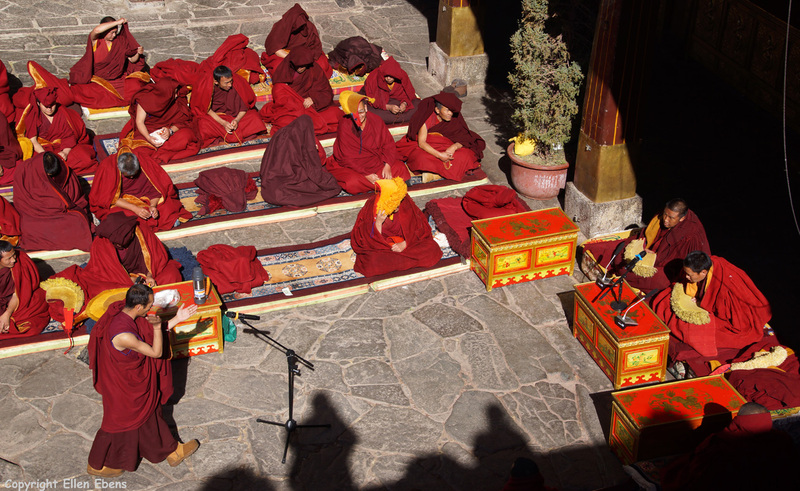 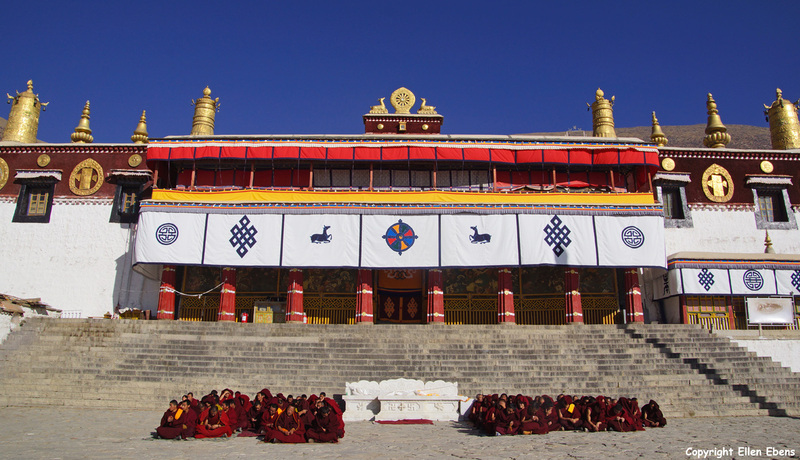 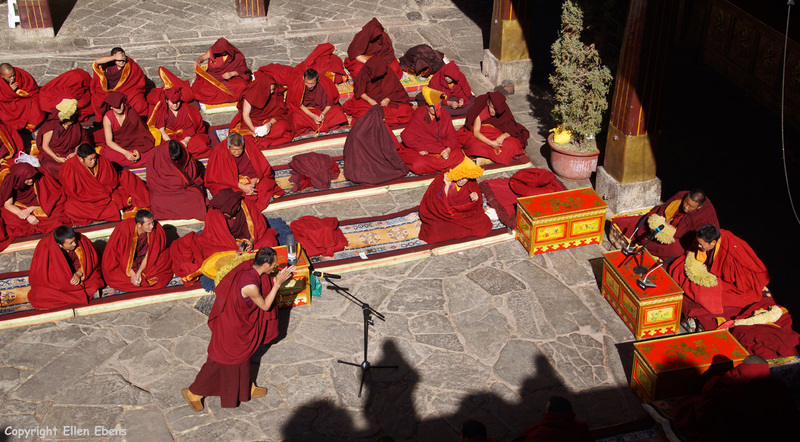 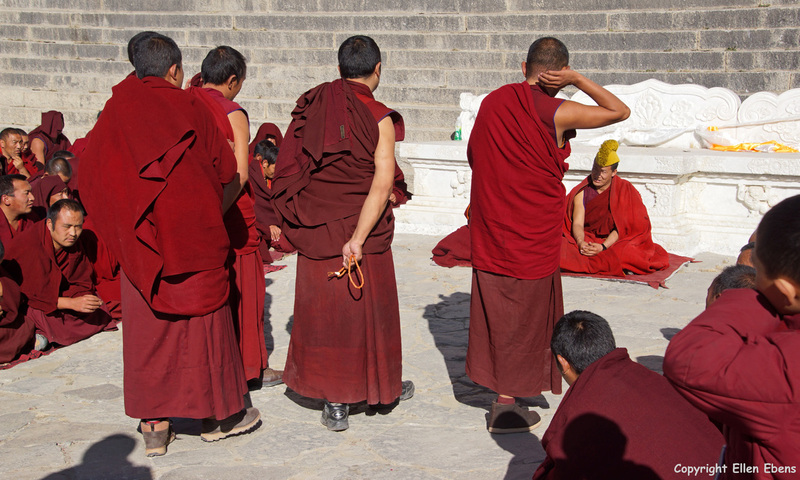 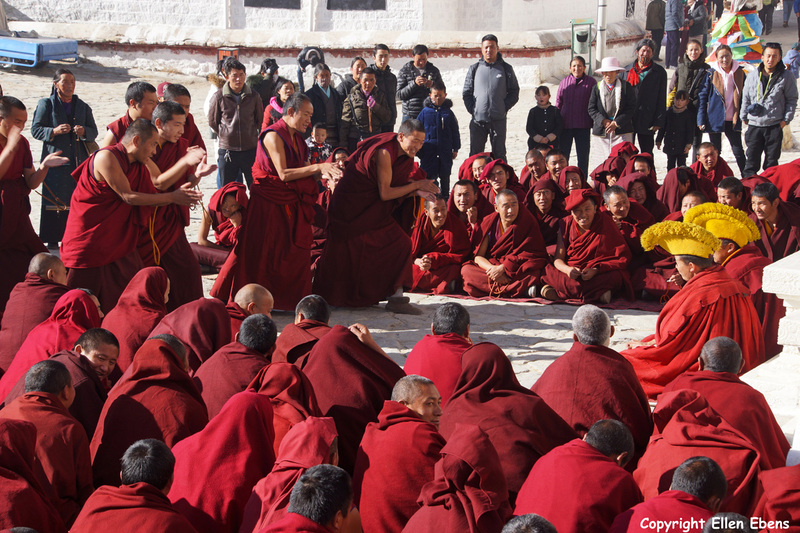 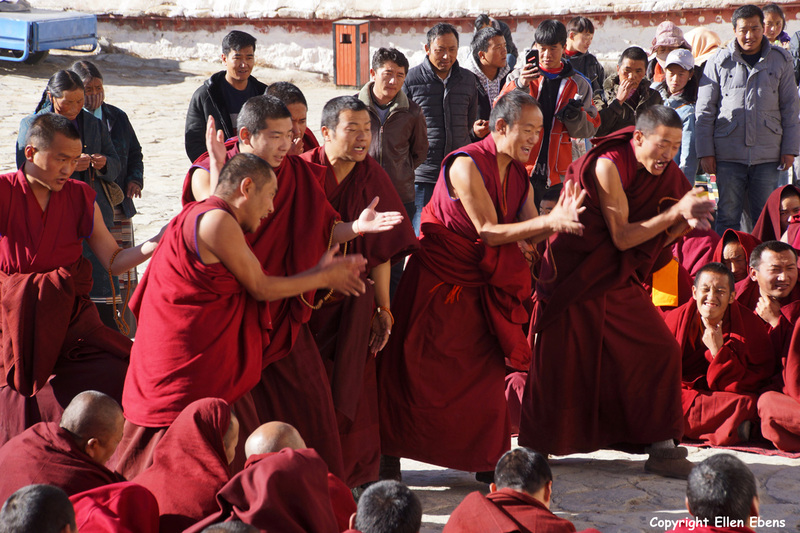 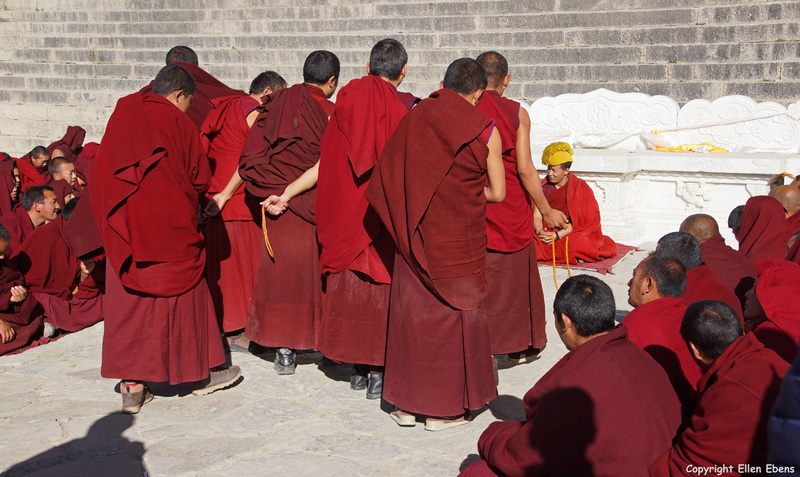 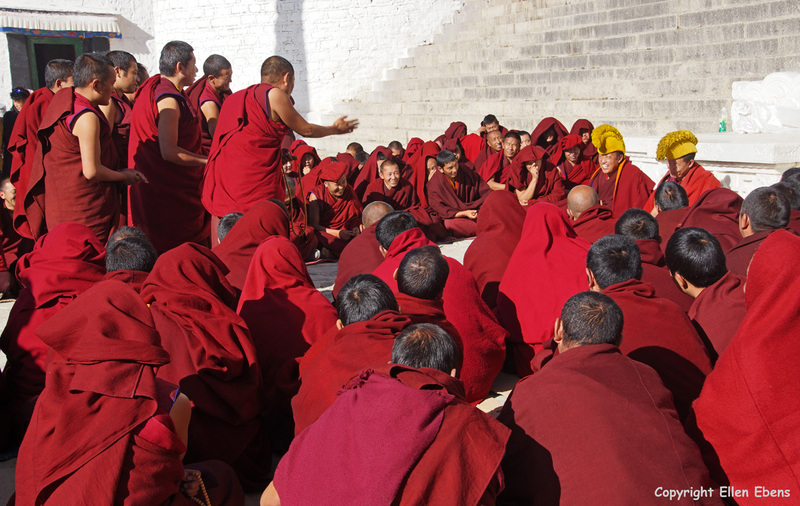 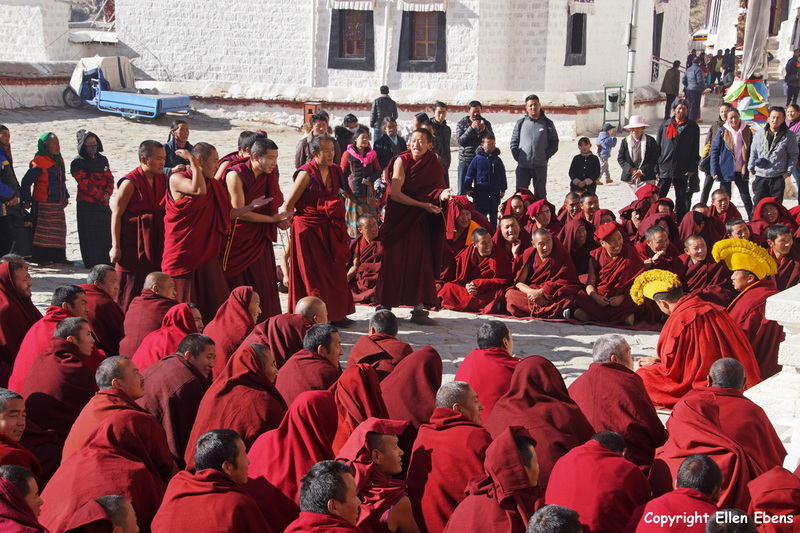 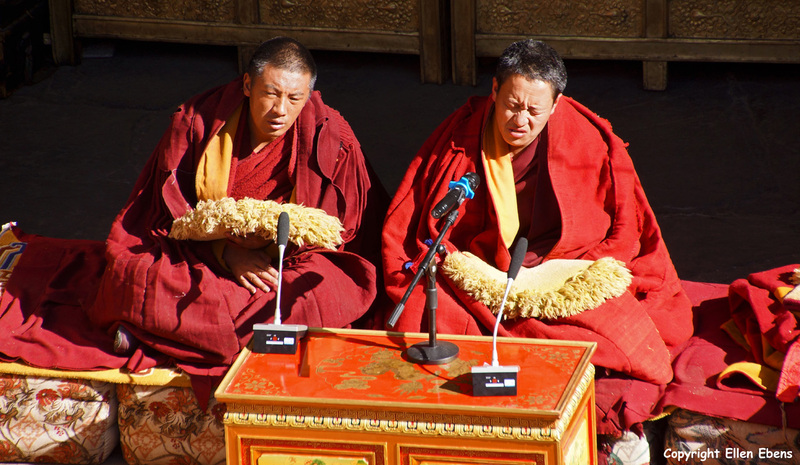 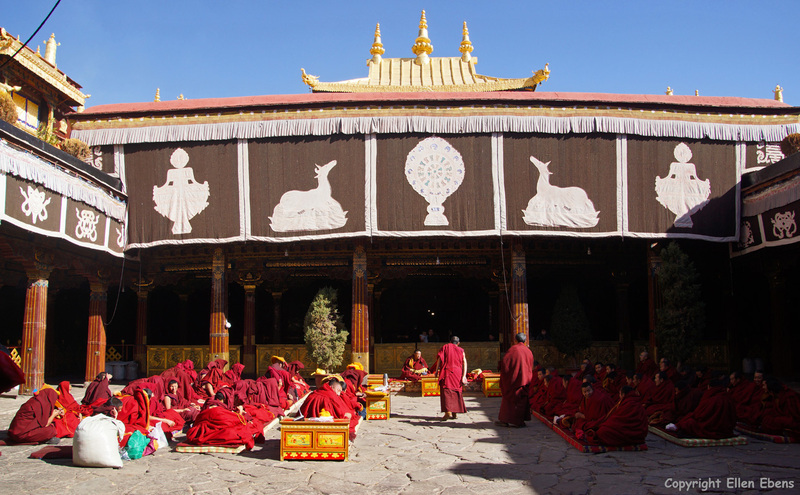 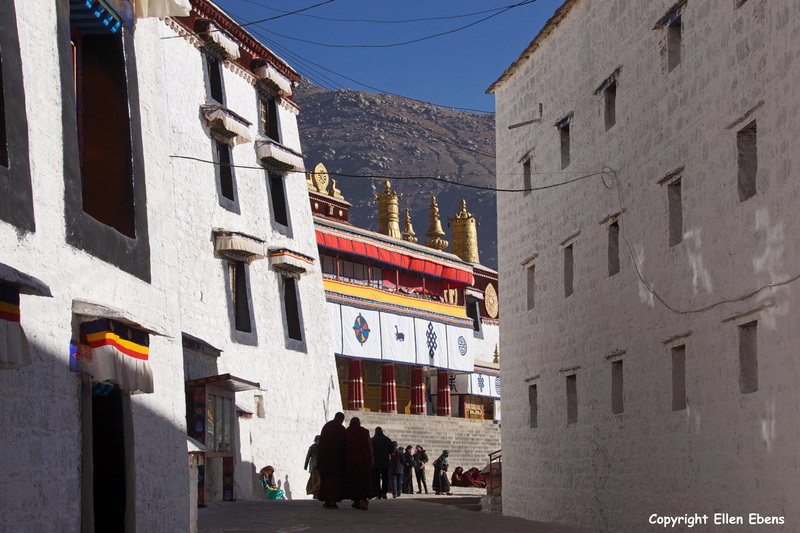 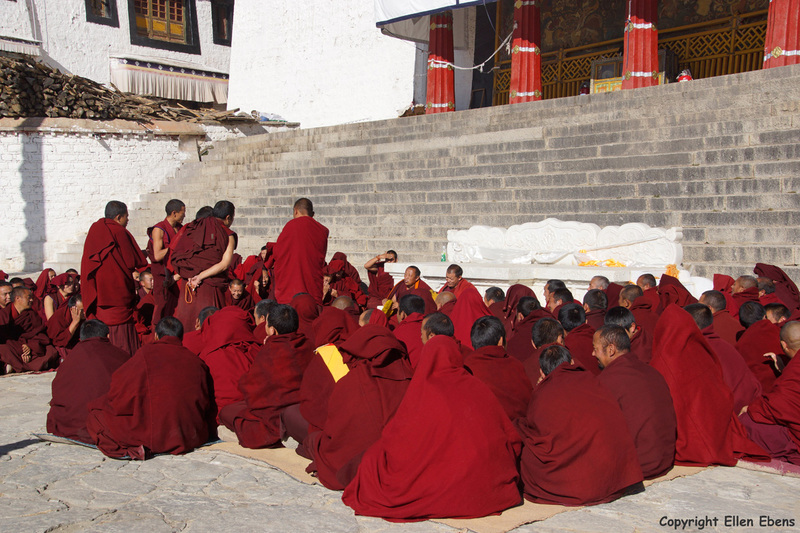 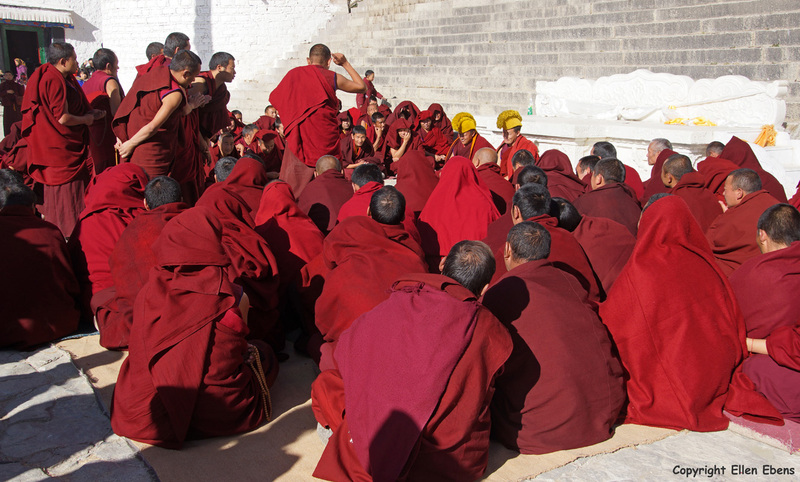 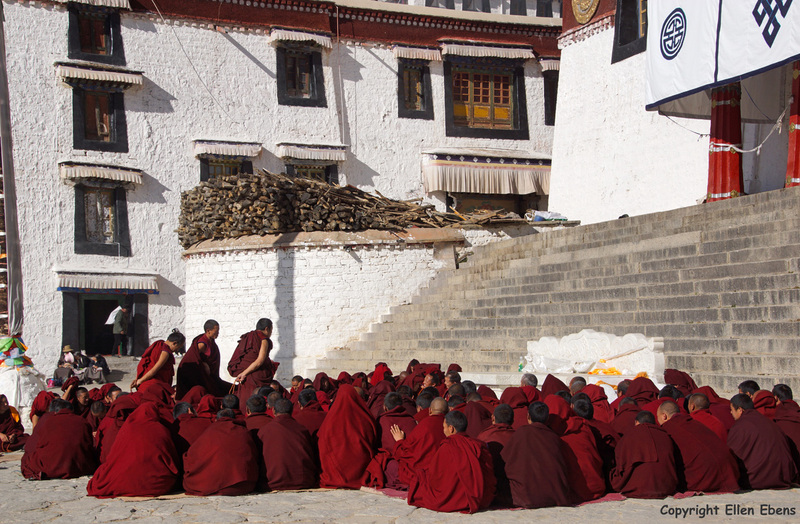 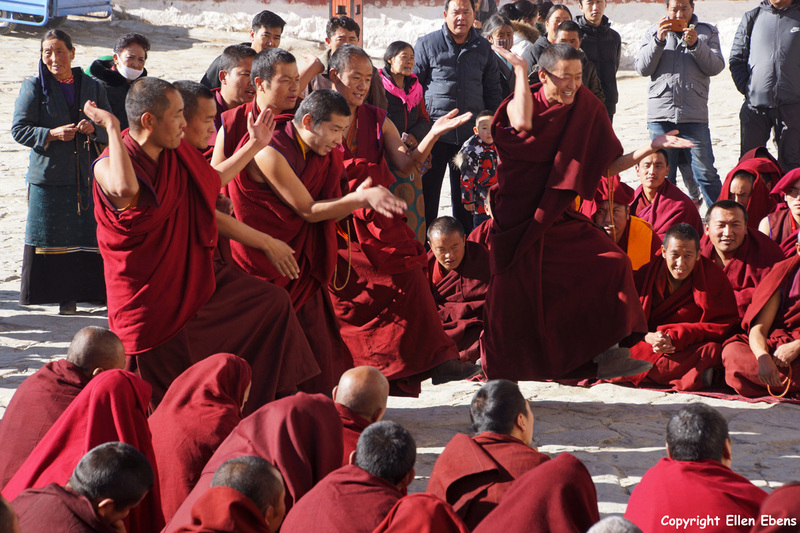 Lhasa, monks debating at the square before the main Assembly Hall of Drepung Monastery. 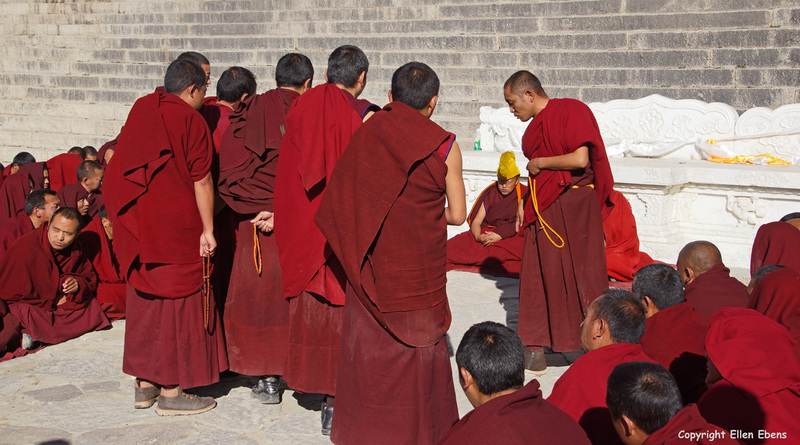 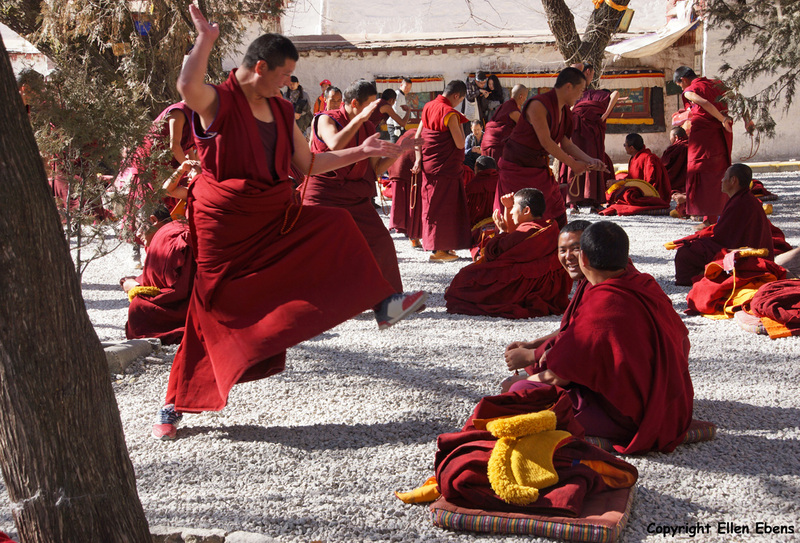 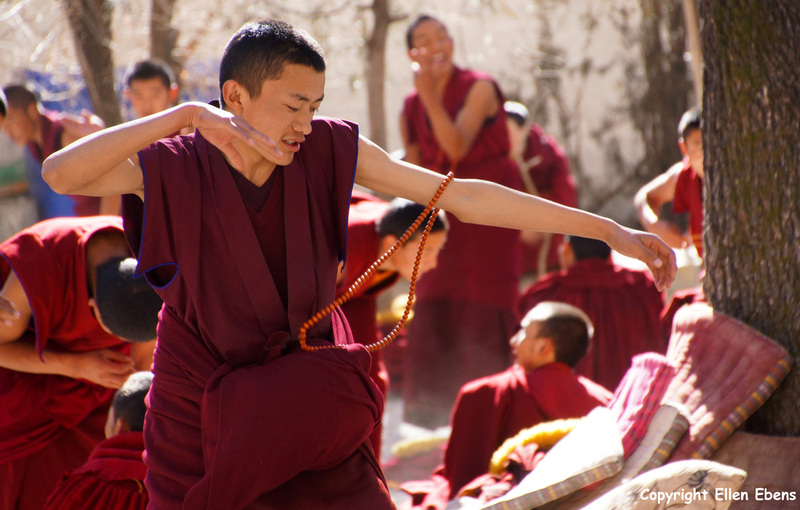 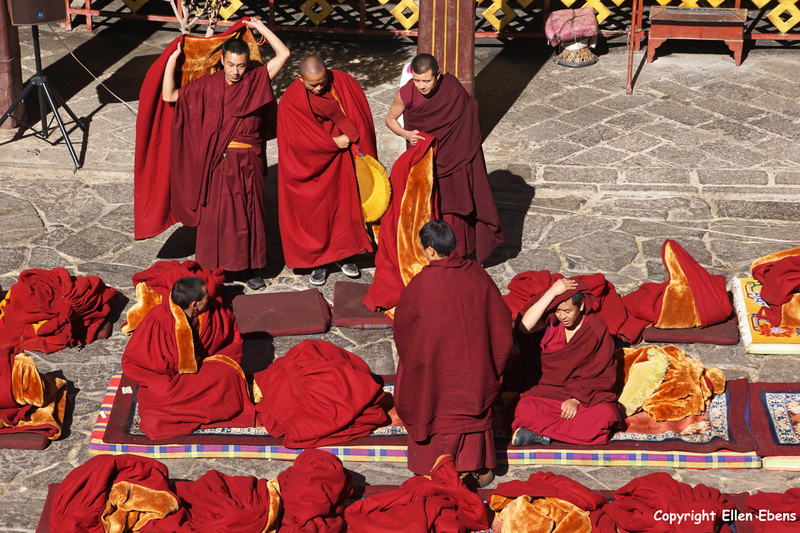 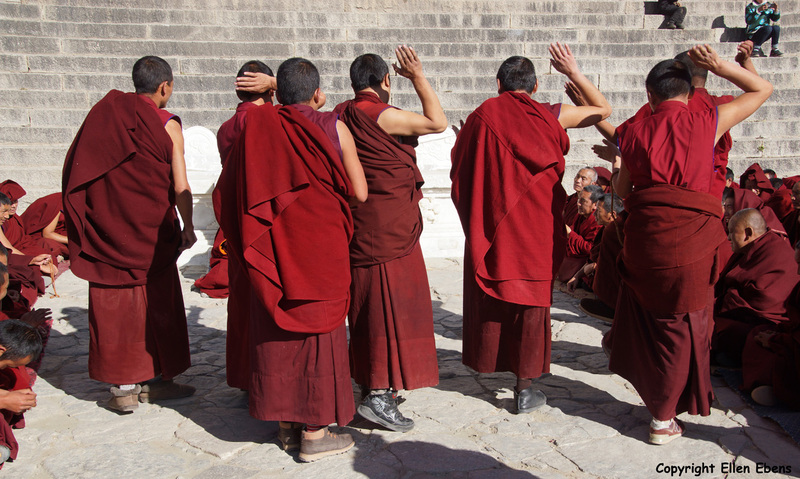 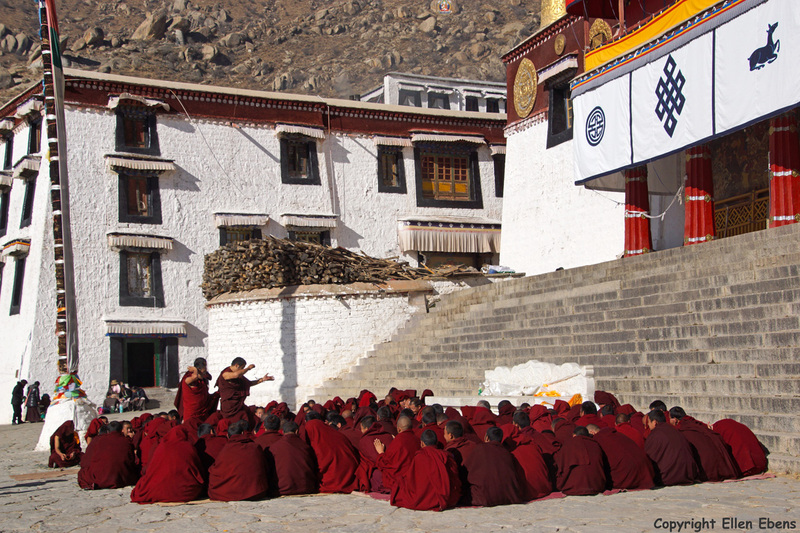 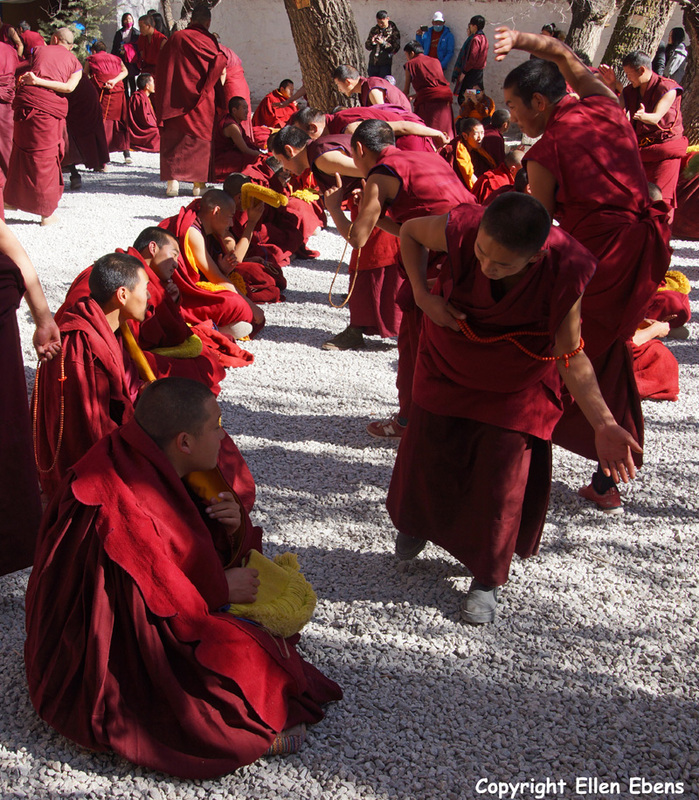 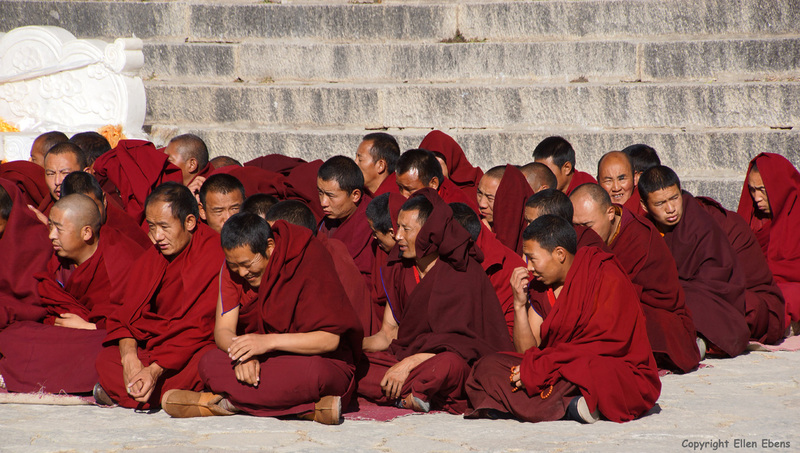 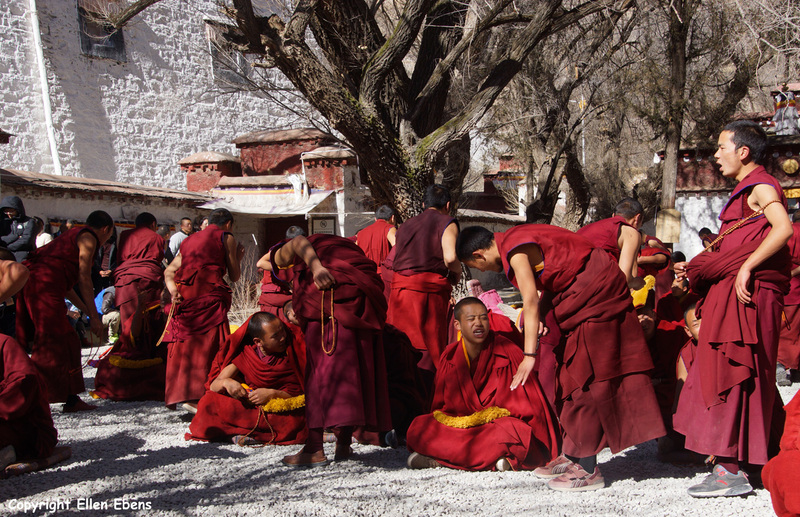 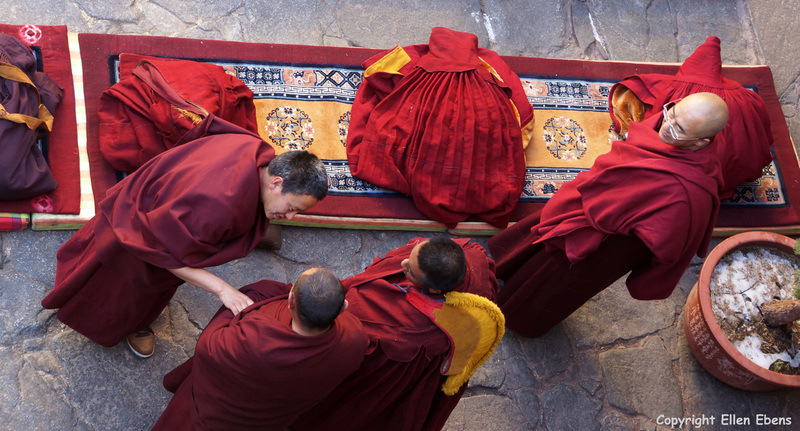 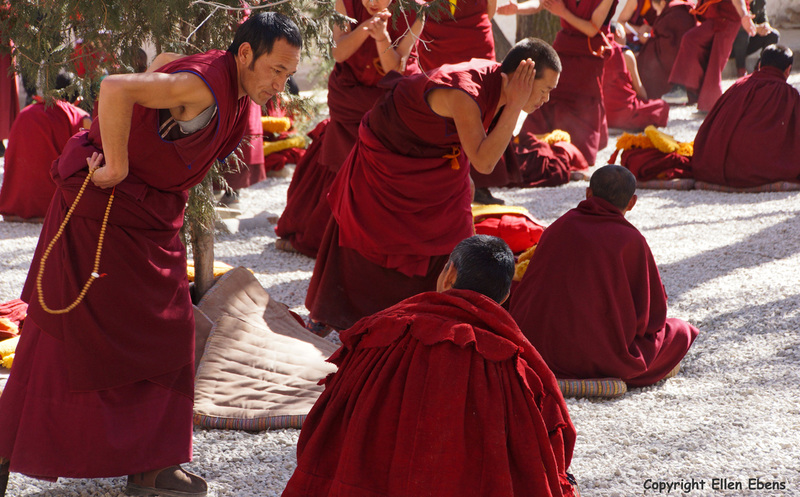 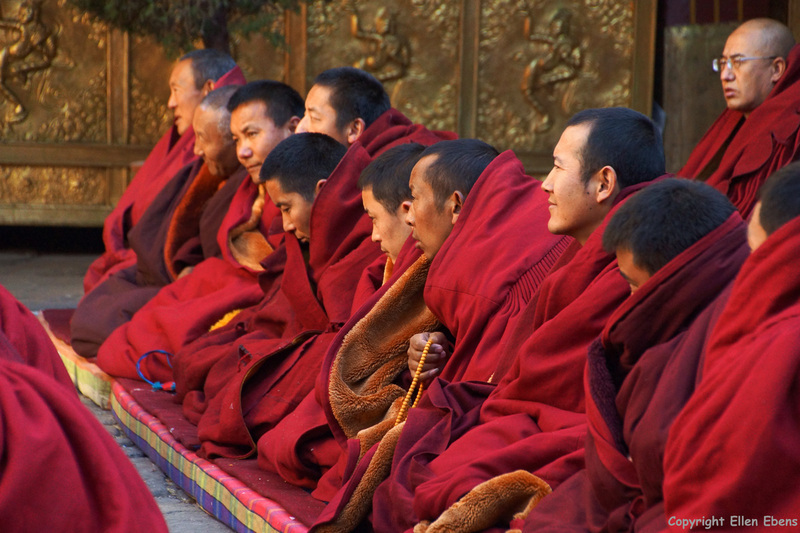 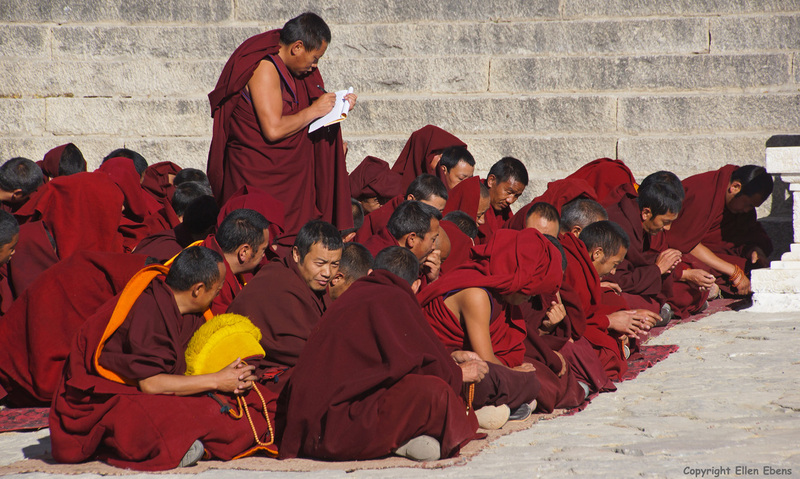 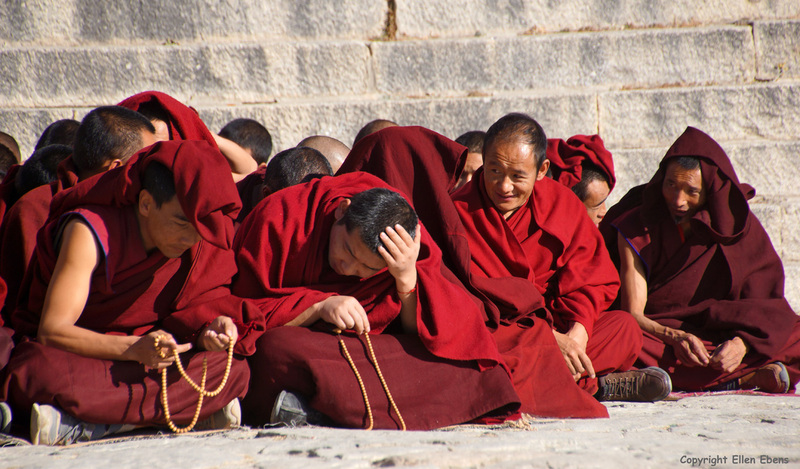 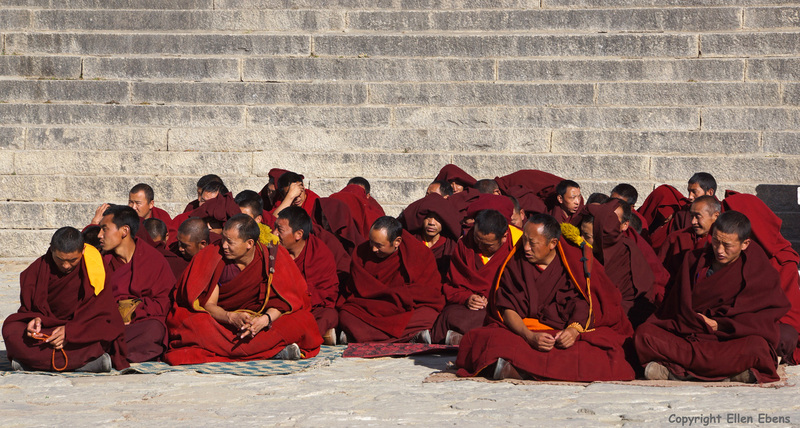 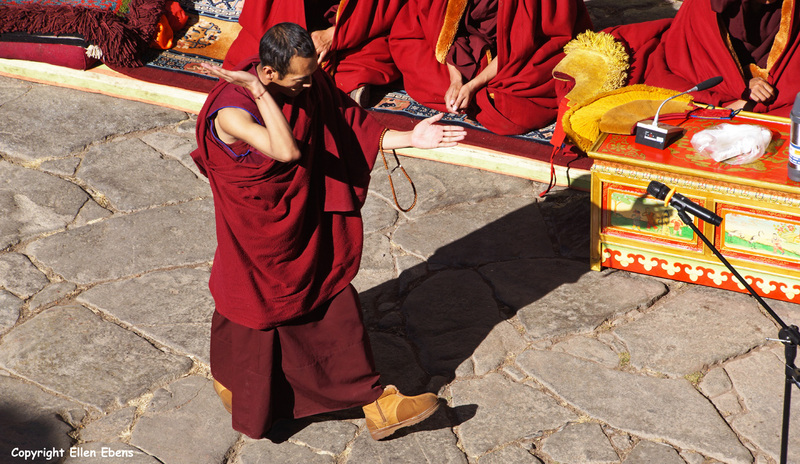 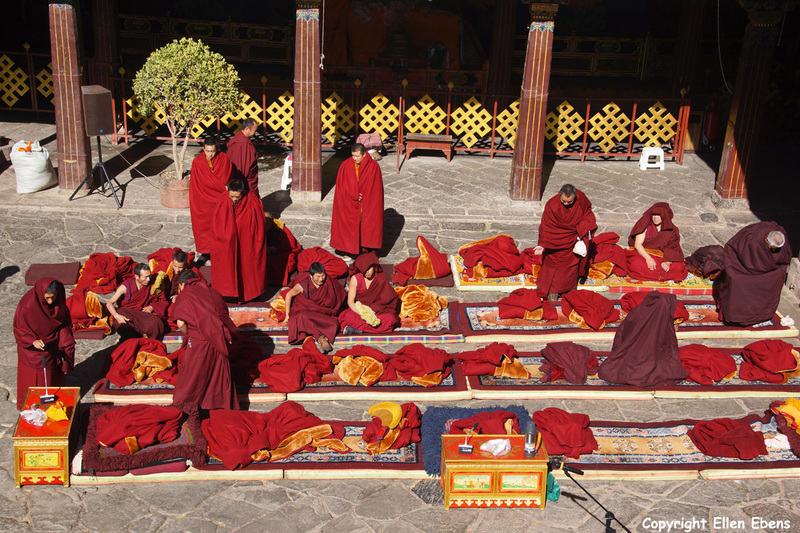 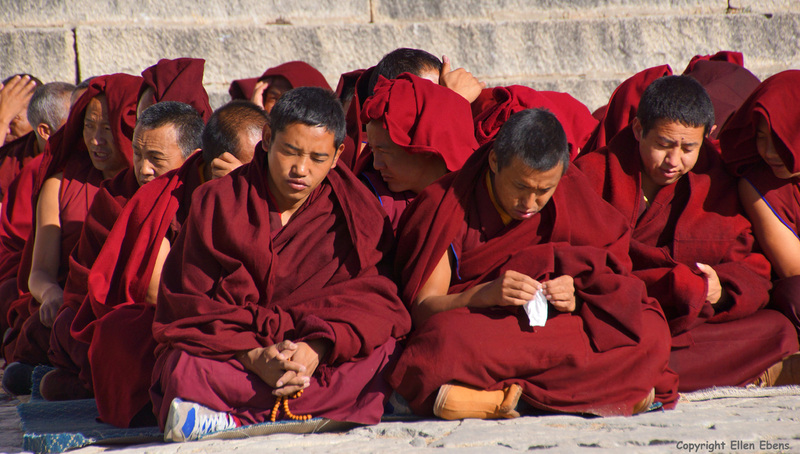 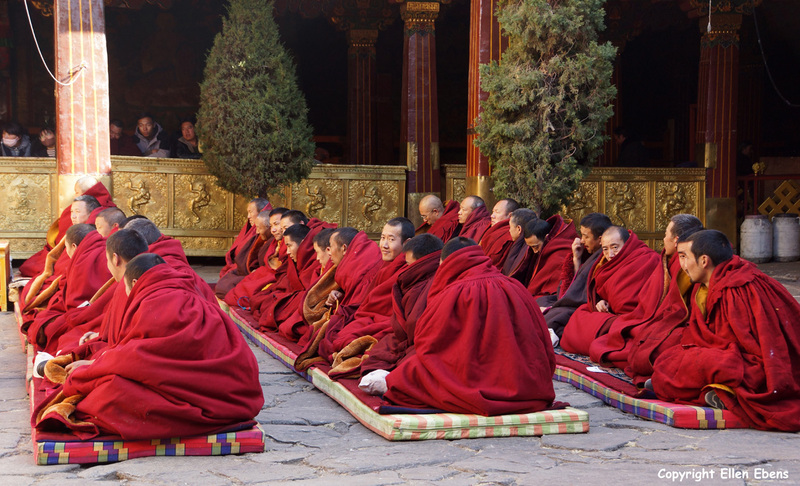 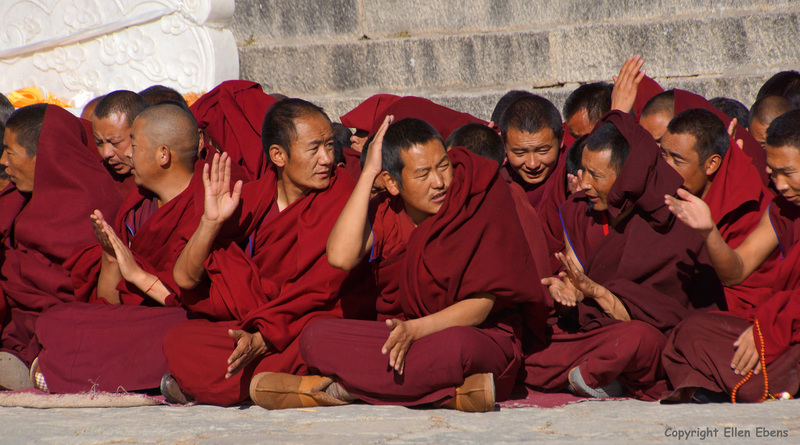 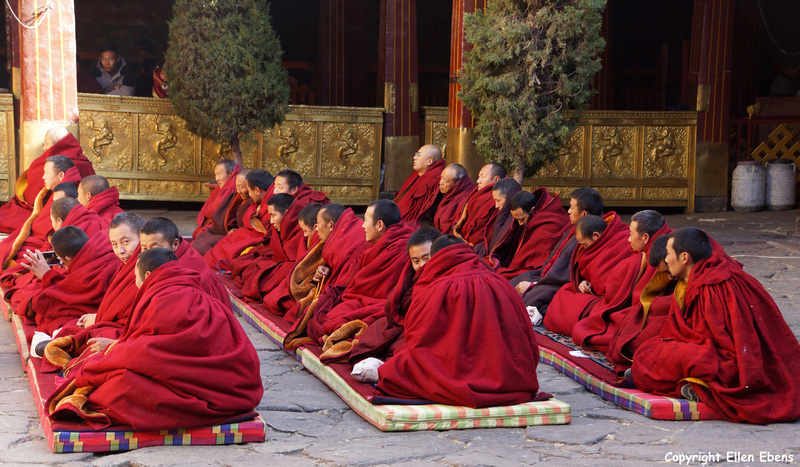 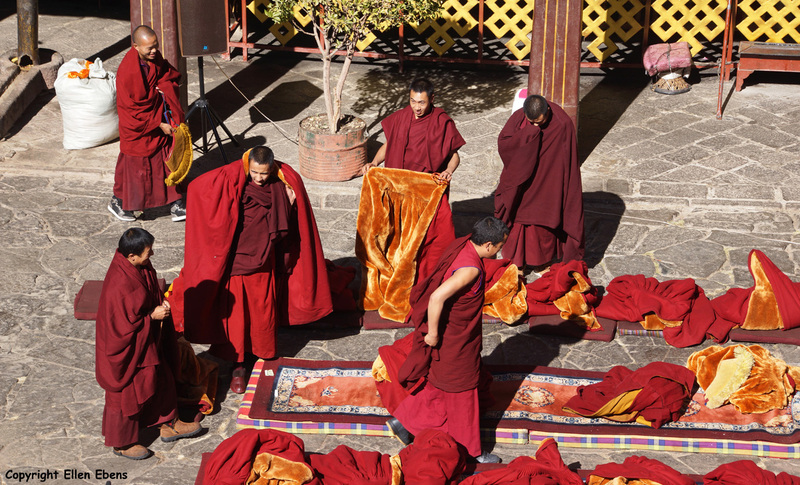 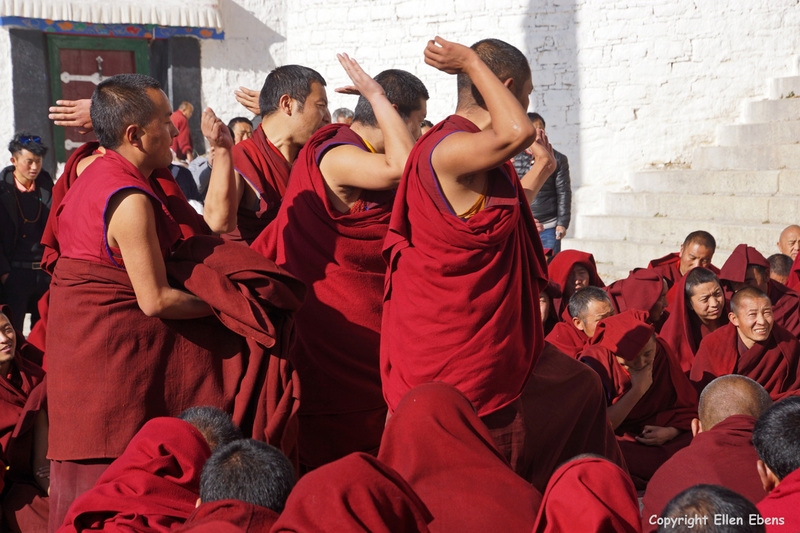 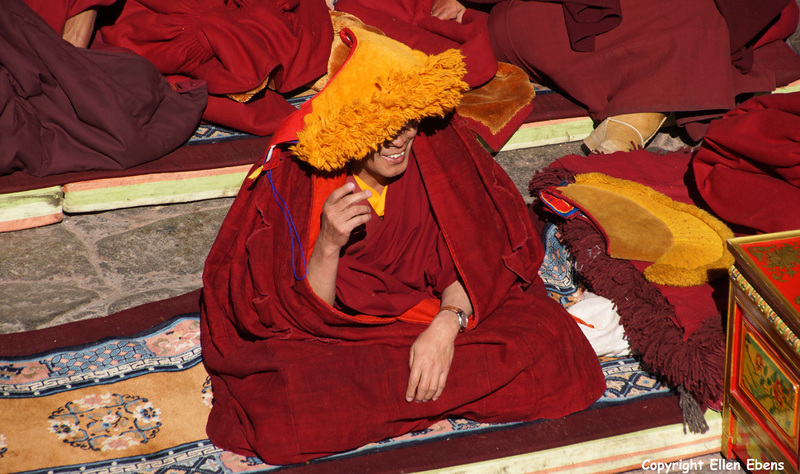 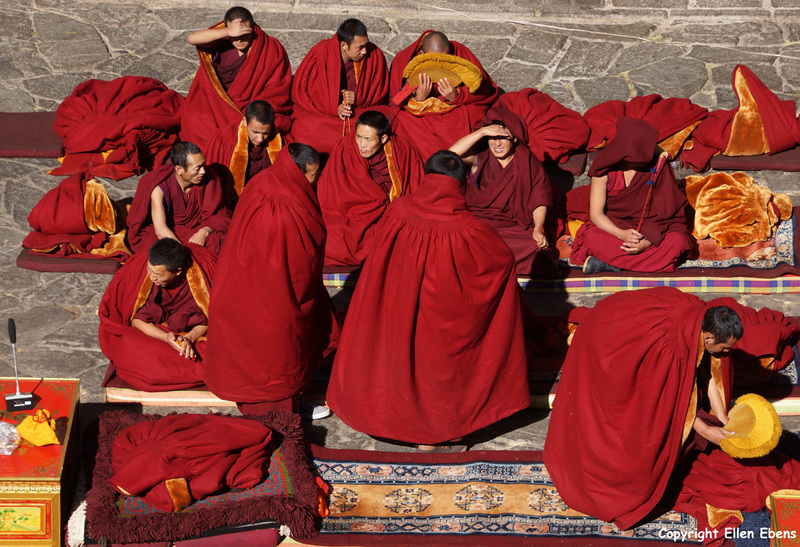 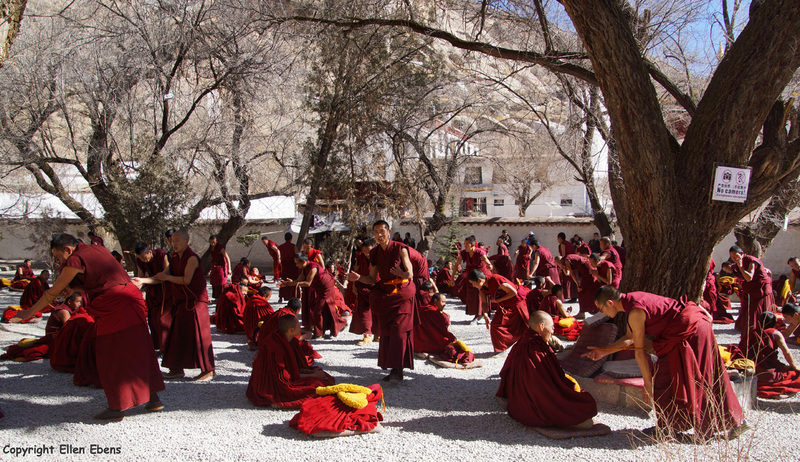 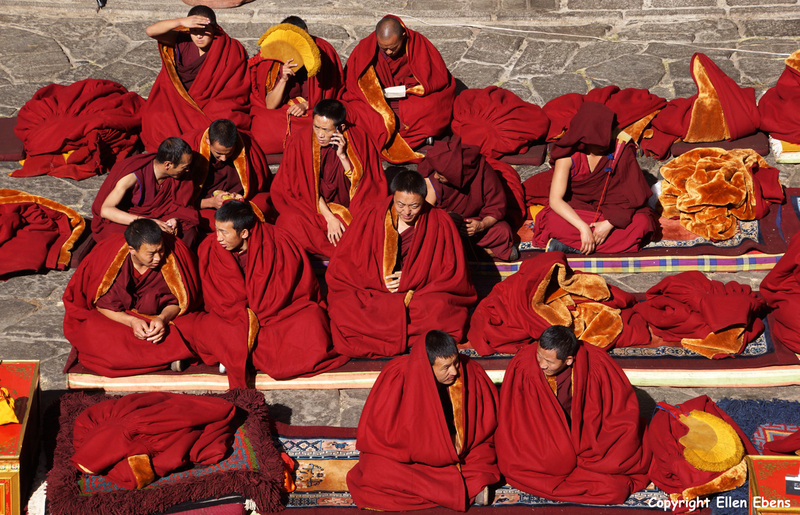 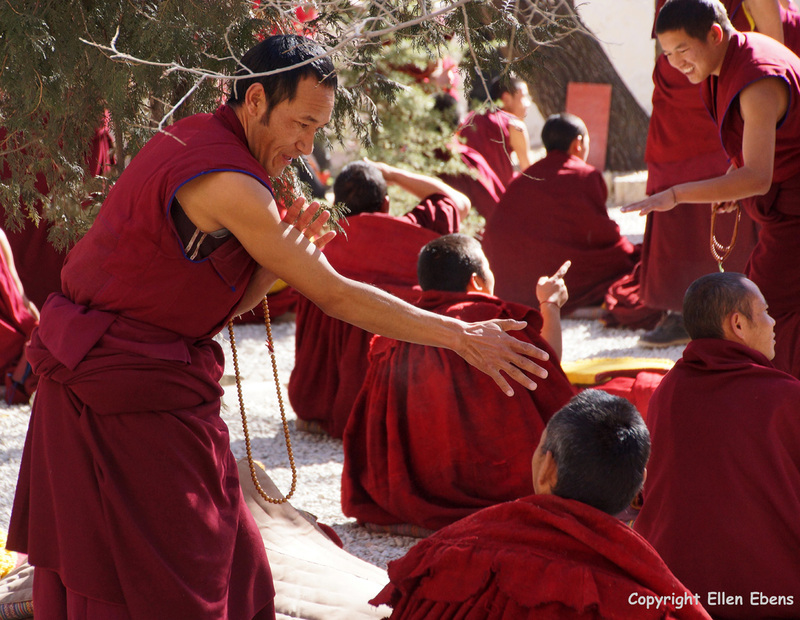 Lhasa, monks debating at the debating court yard of Sera Monastery. 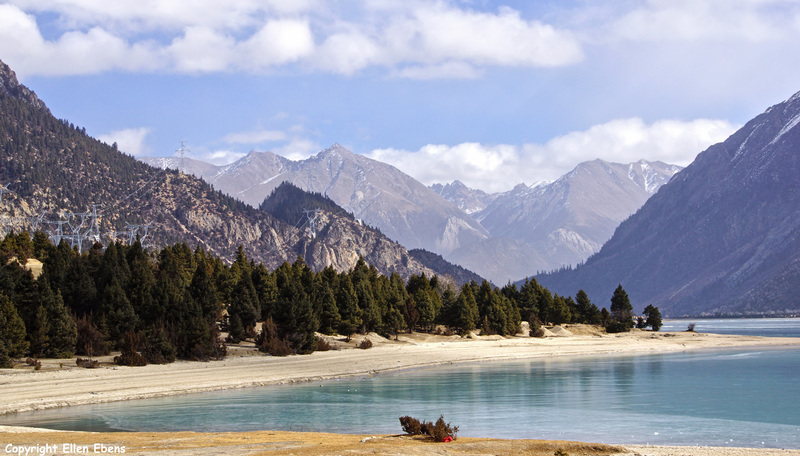 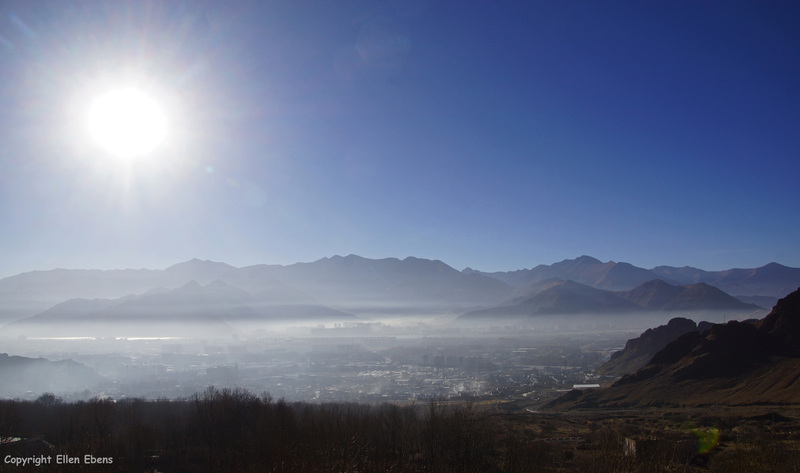 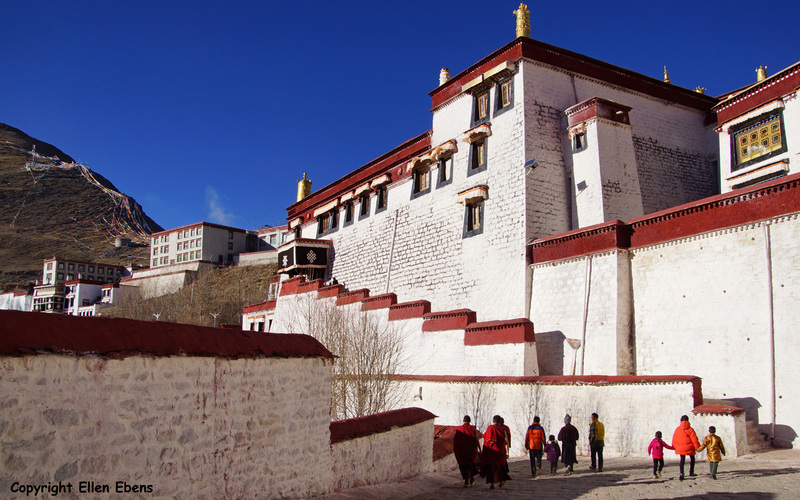 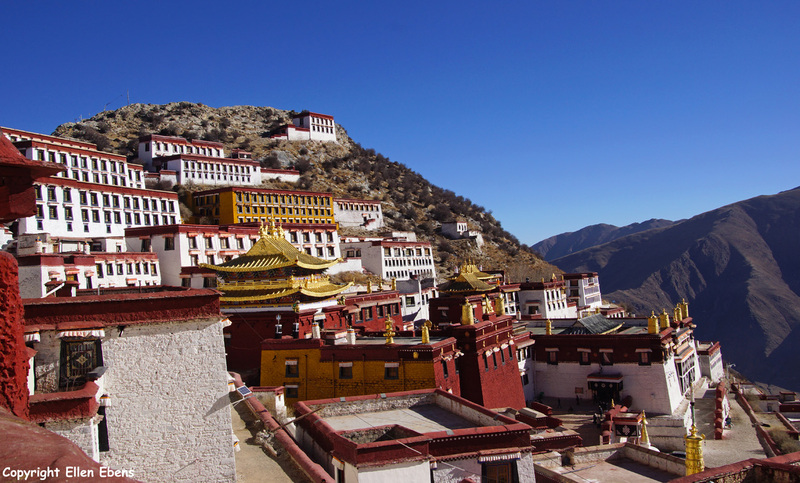 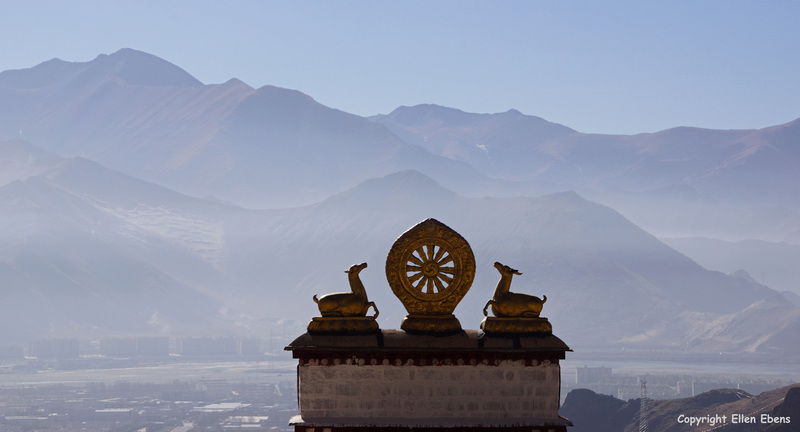 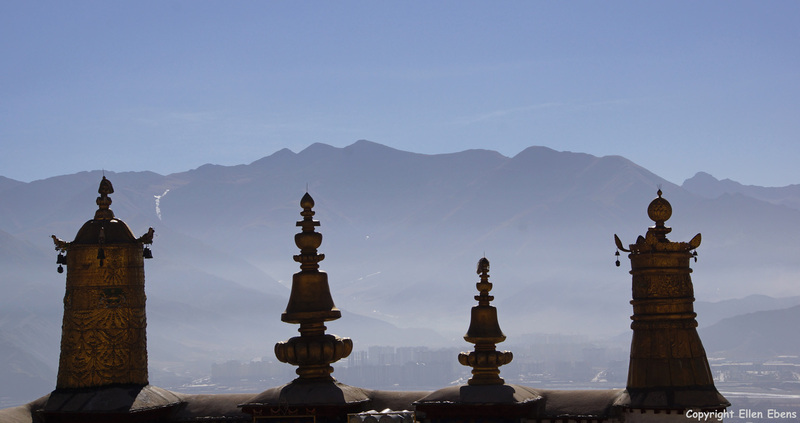 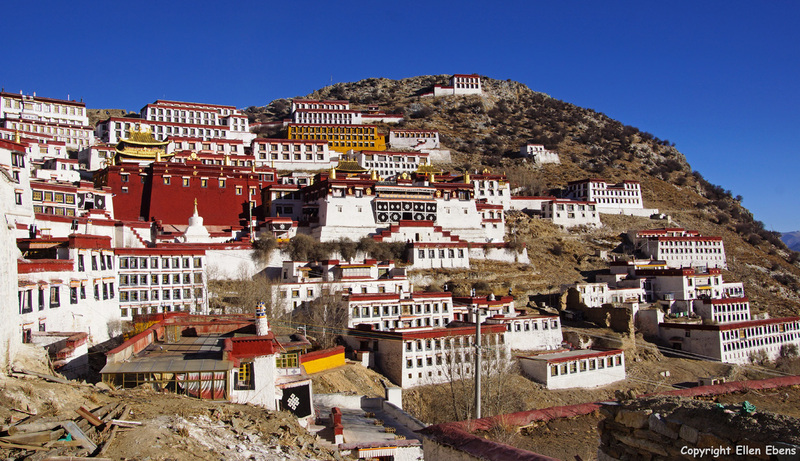 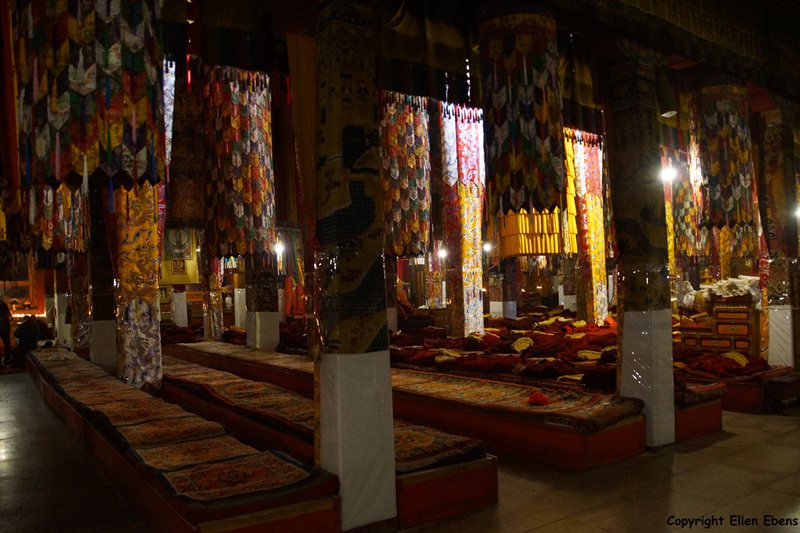 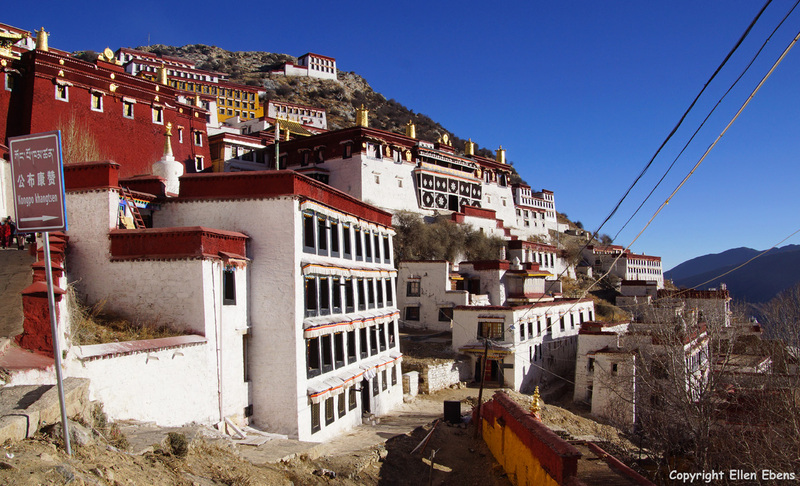 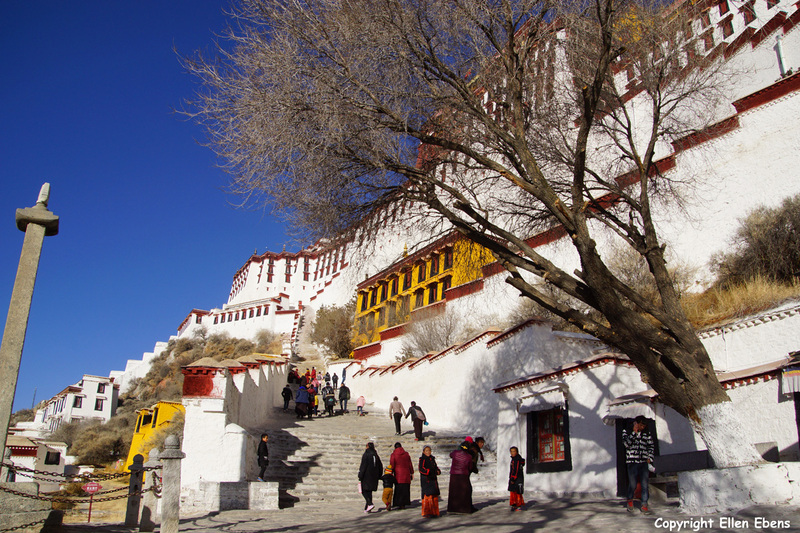 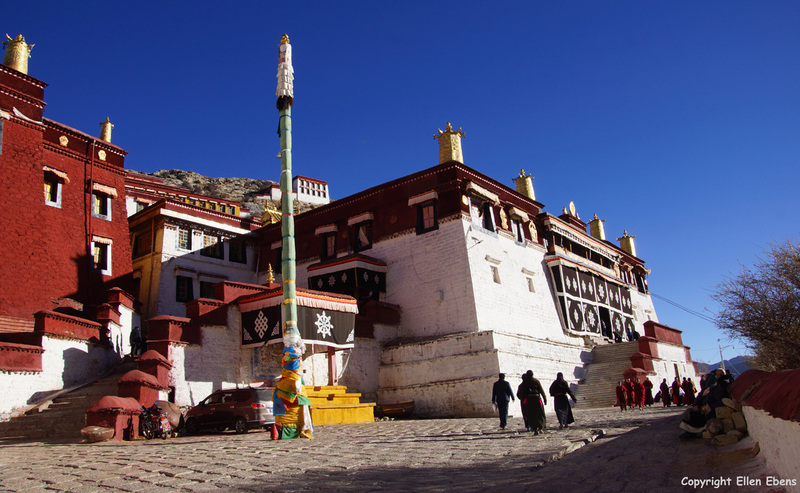 Ganden Monastery, situated about 50 km northeast of Lhasa. 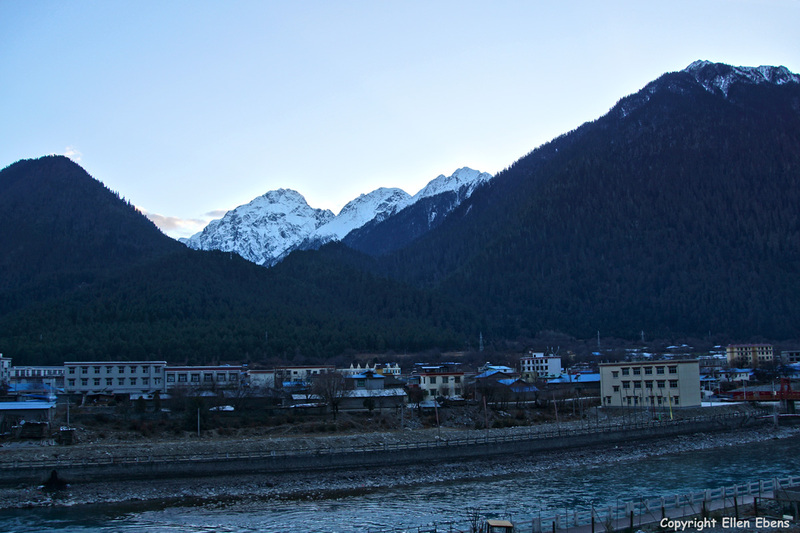 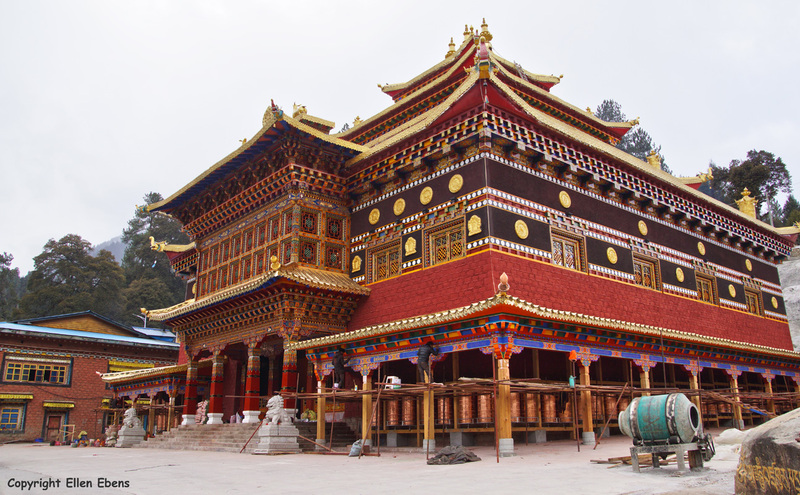 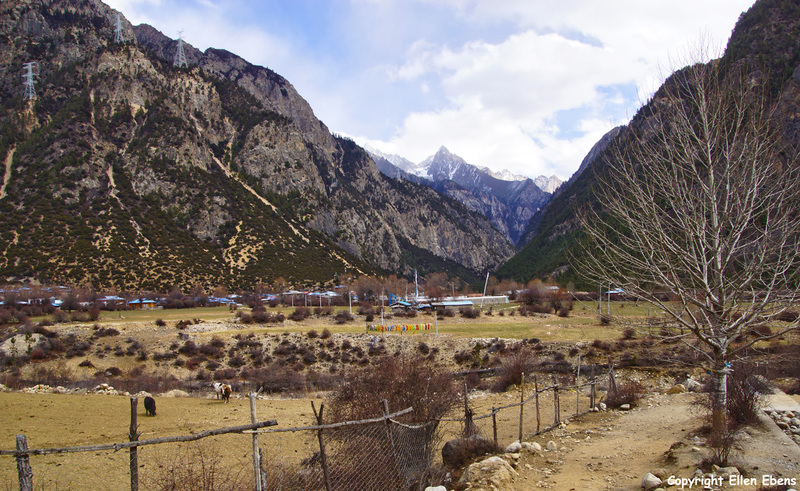 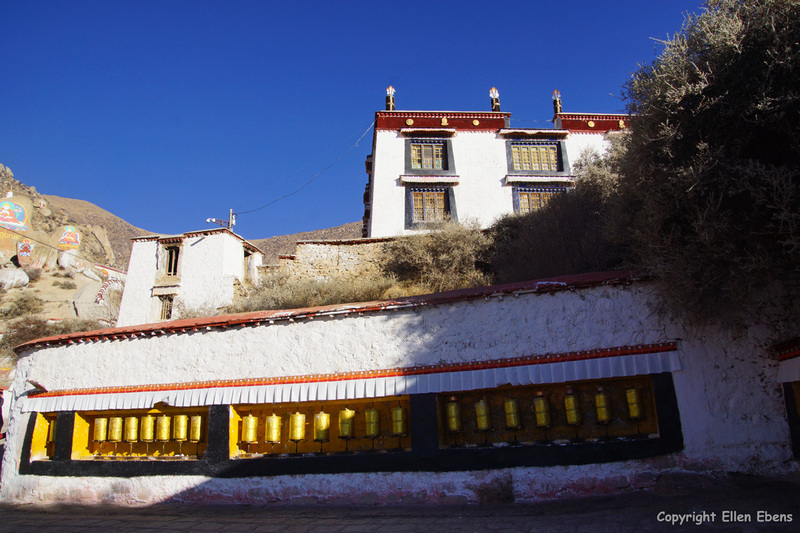 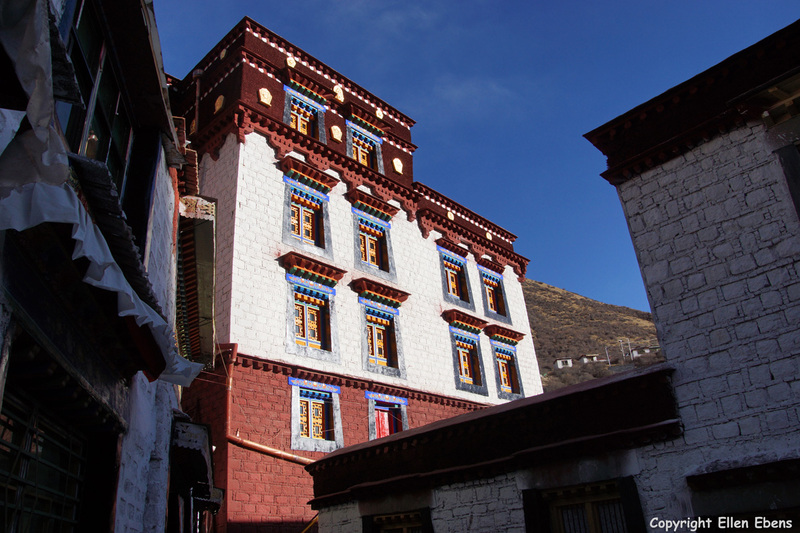 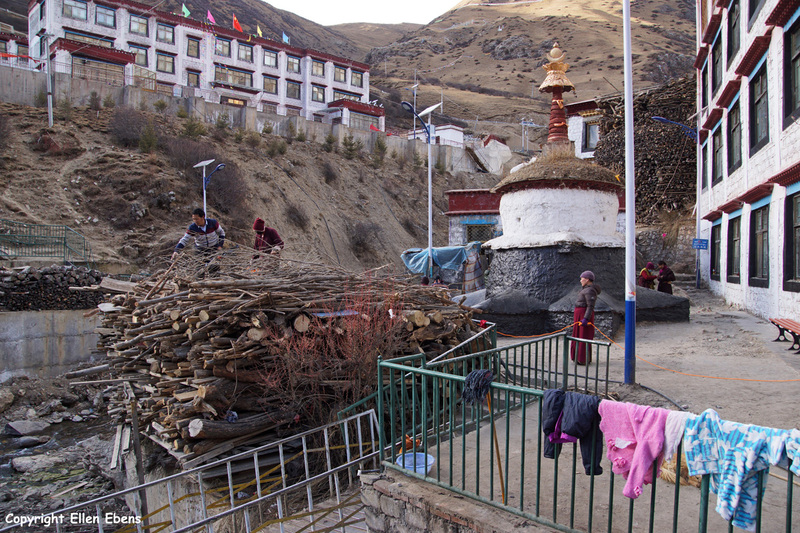 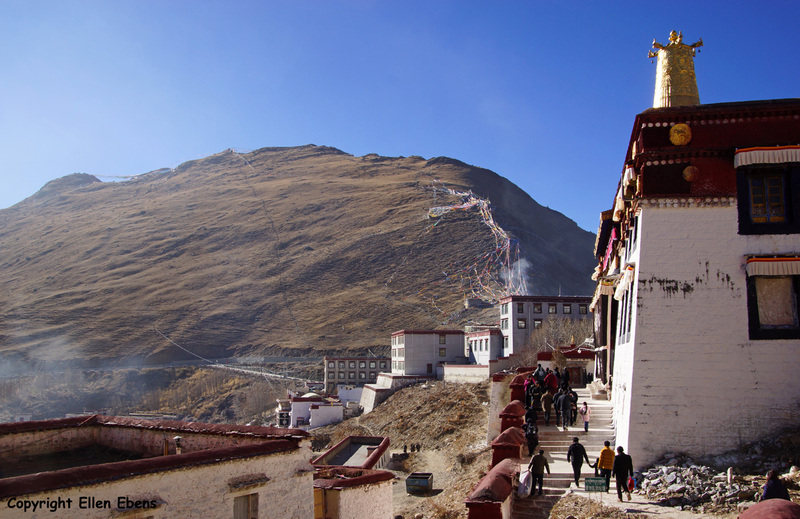 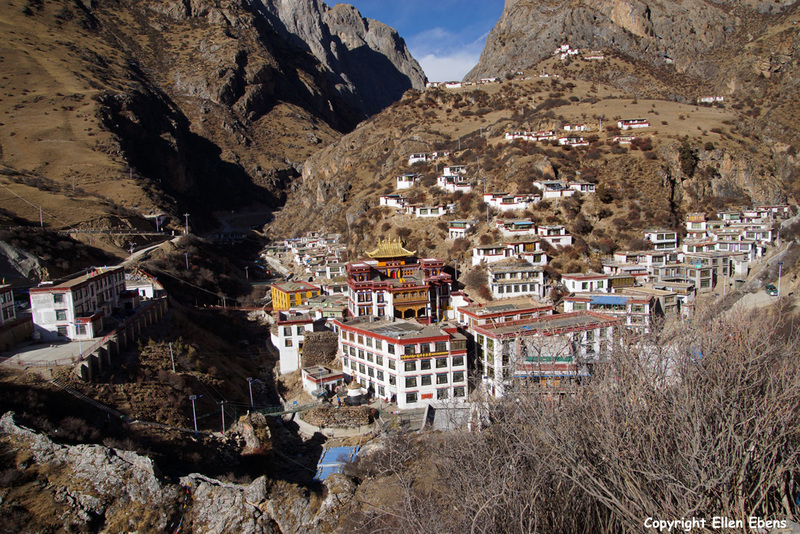 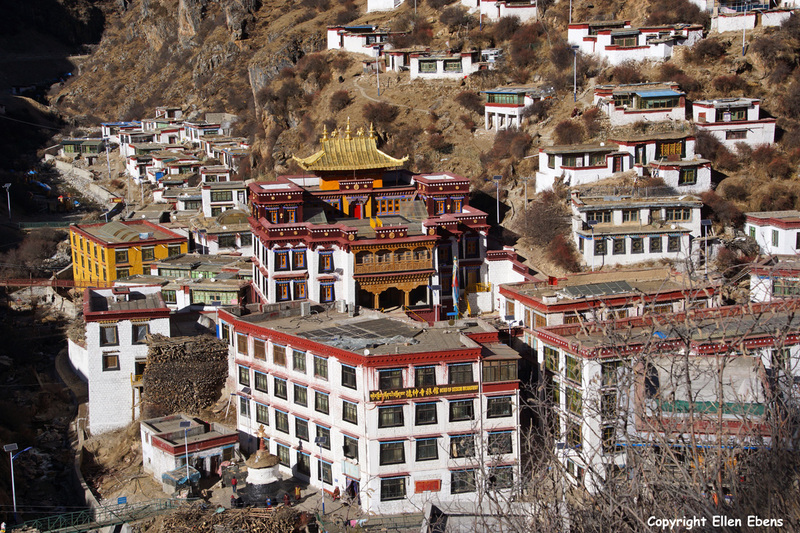 Ganden Monastery. 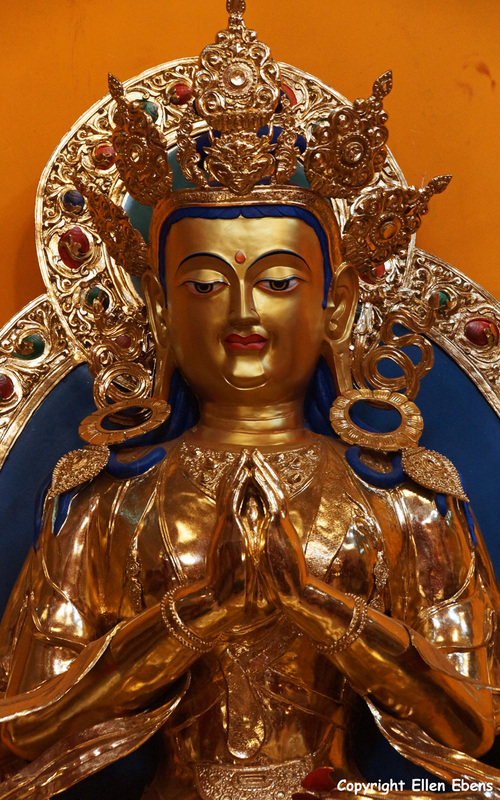 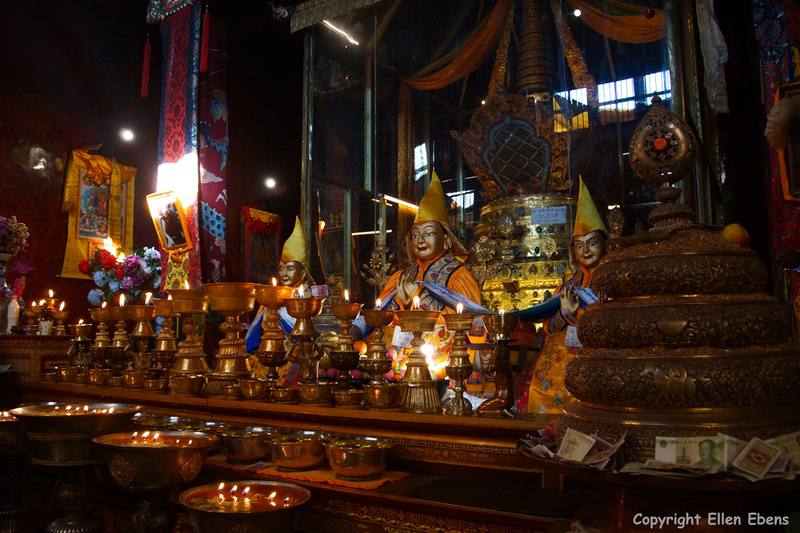 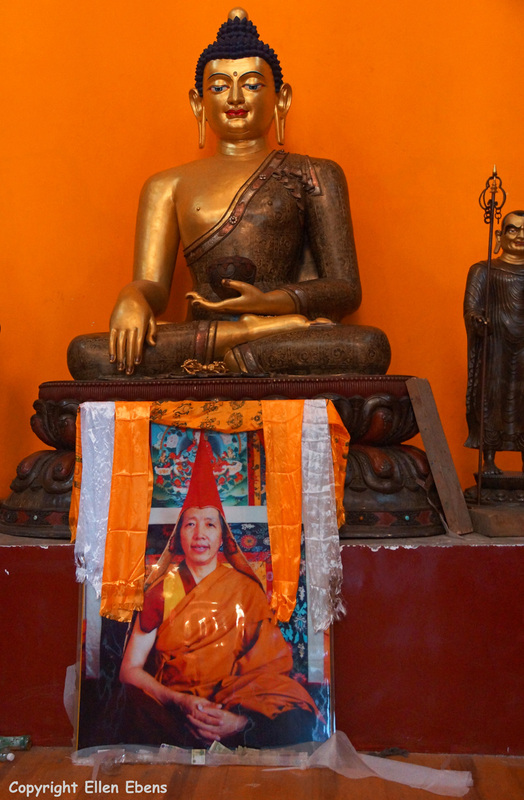 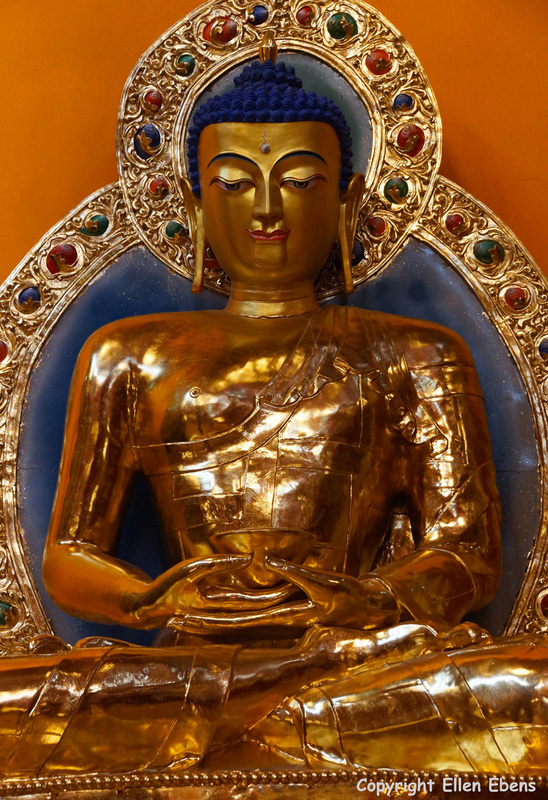 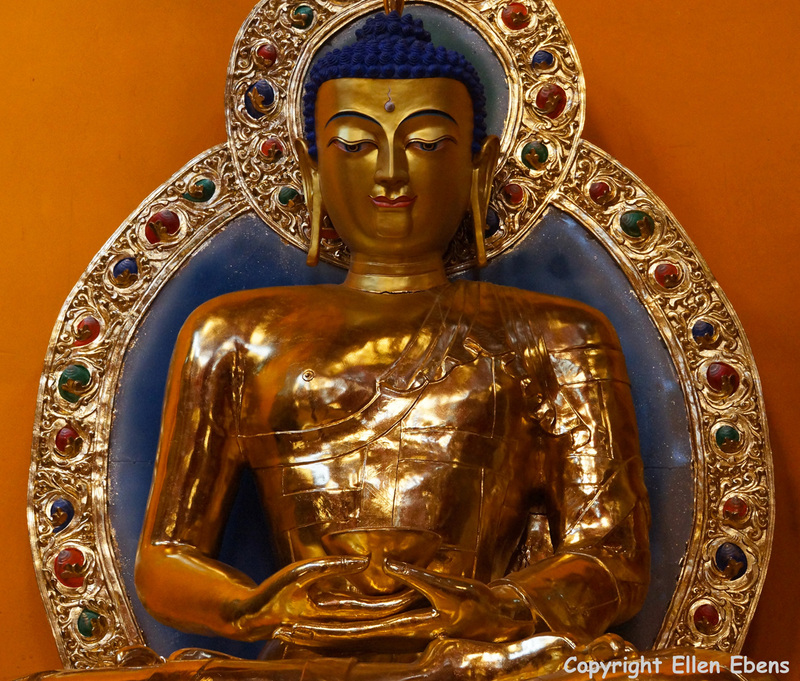 Pilgrims are mandala praying in the chapel where the stupa of master Tsongkhapa is. 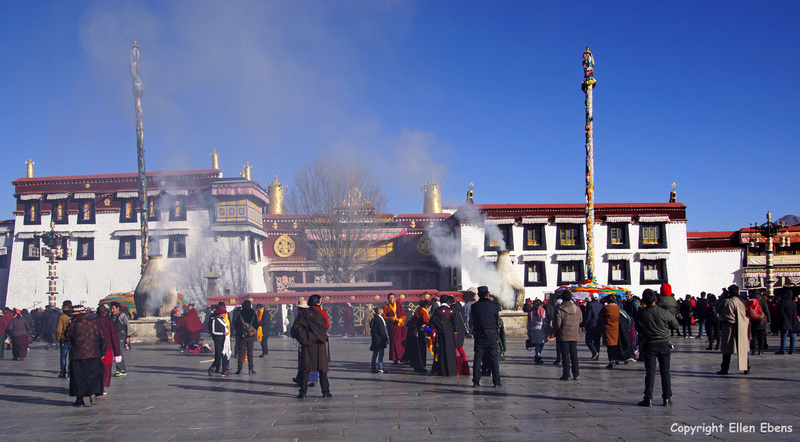 Ganden Monastery. 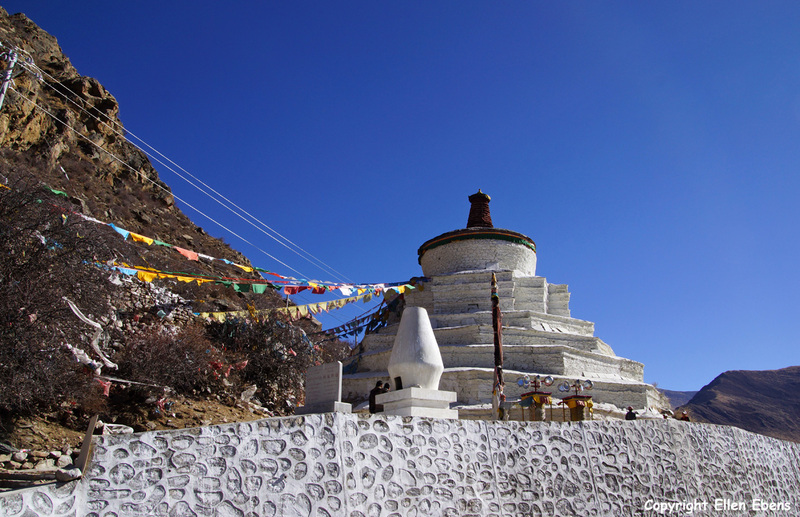 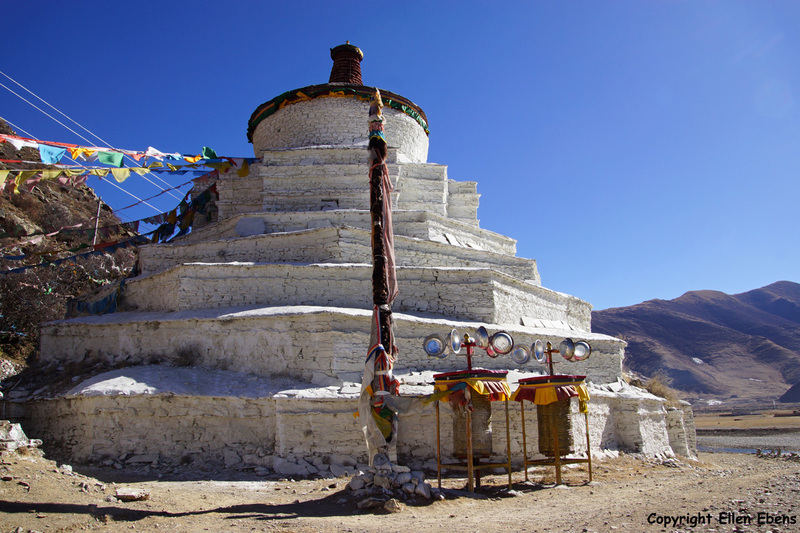 The stupa of master Tsongkhapa. 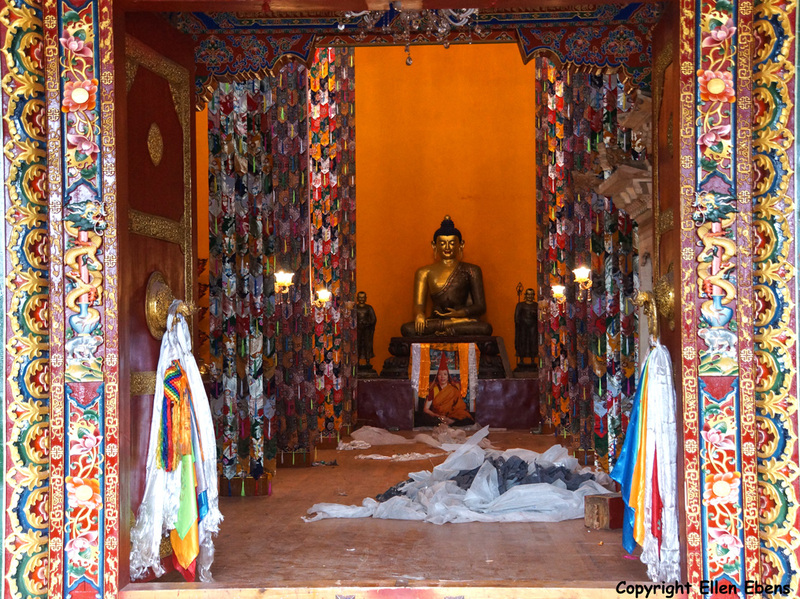 A chapel at Ganden Monastery. 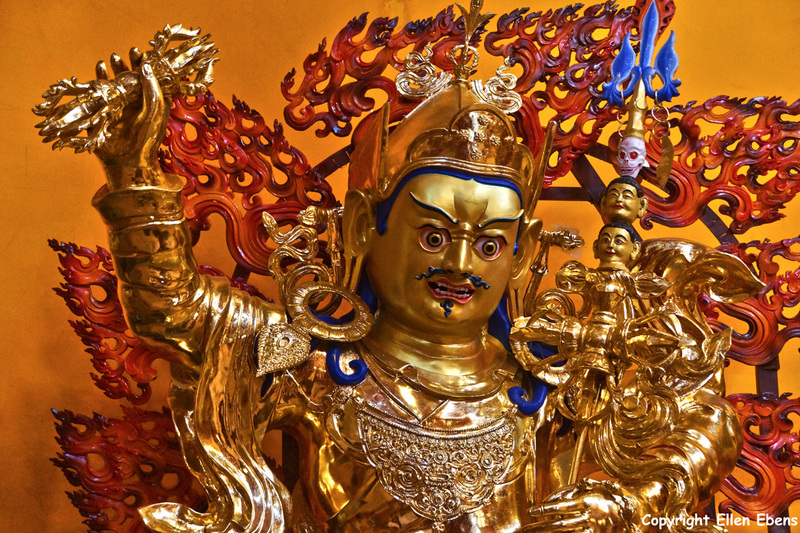 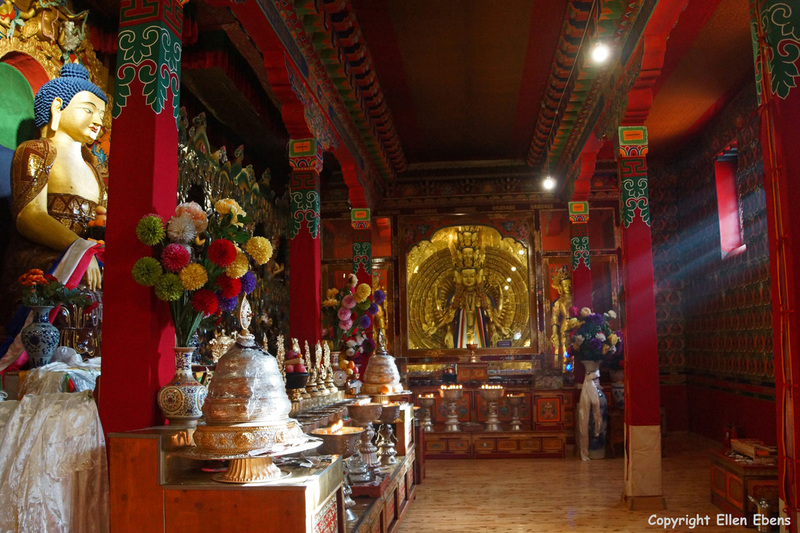 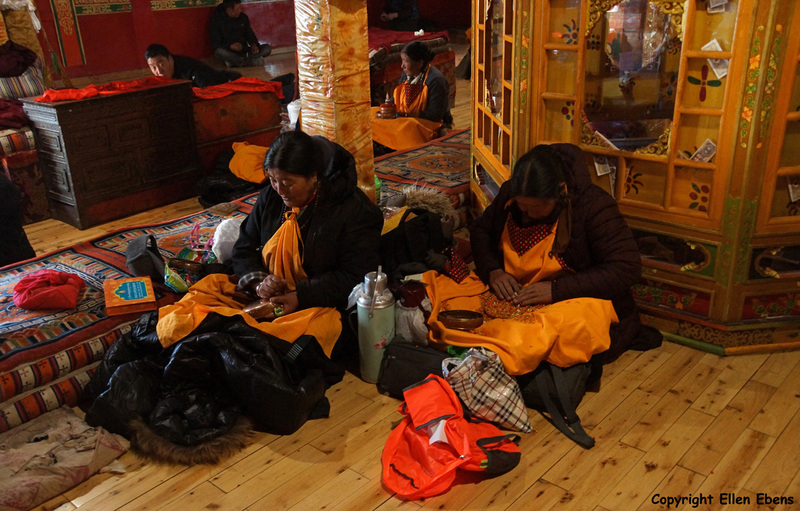 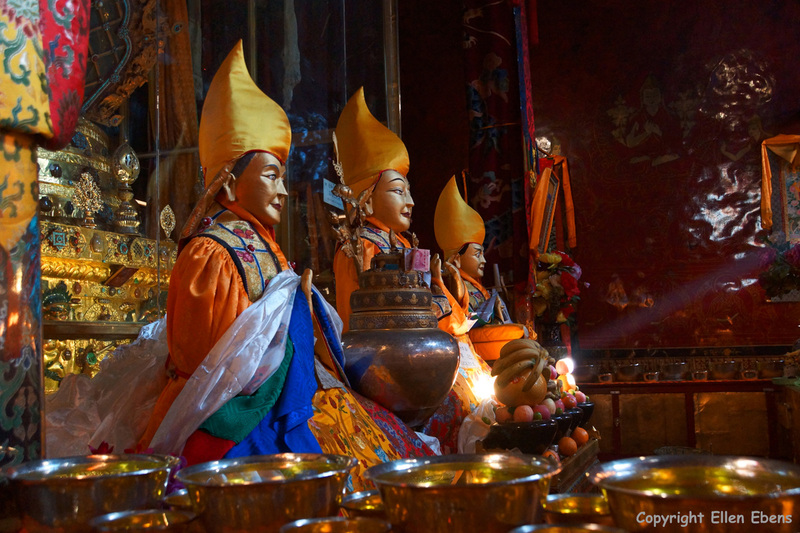 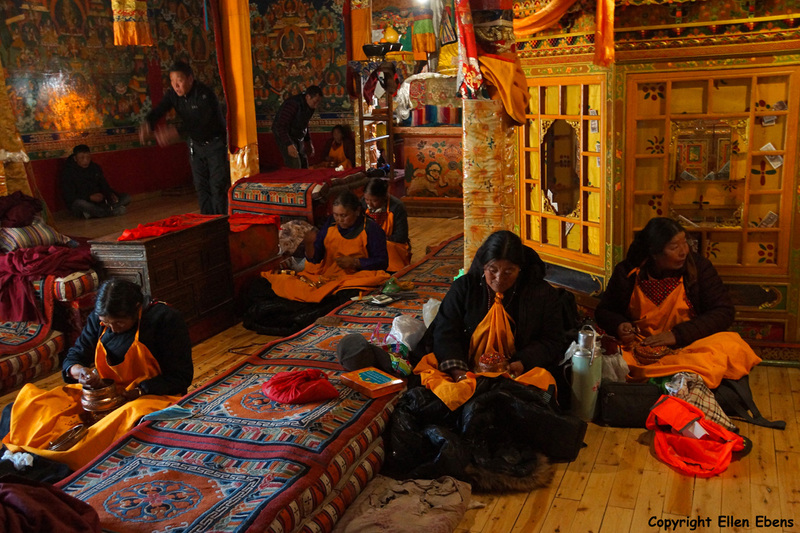 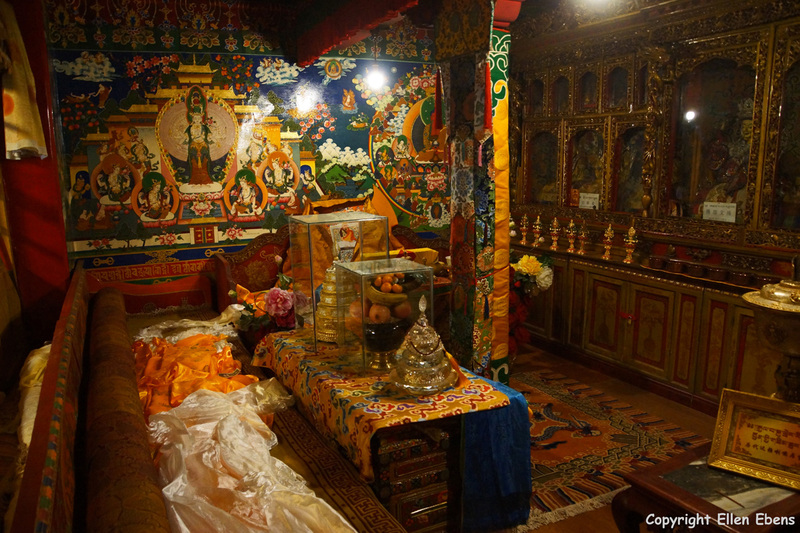 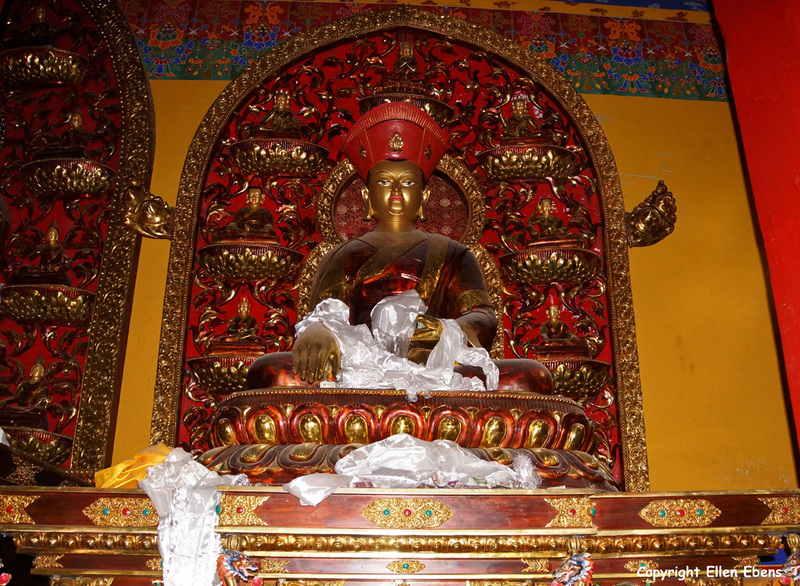 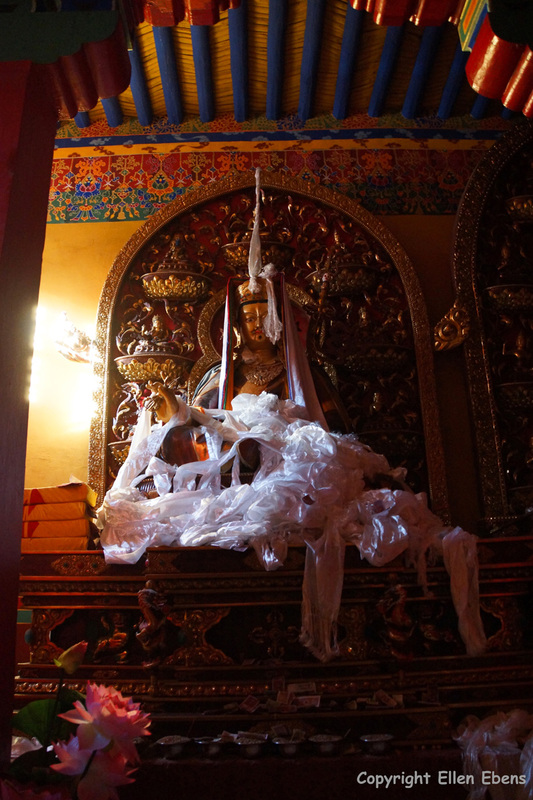 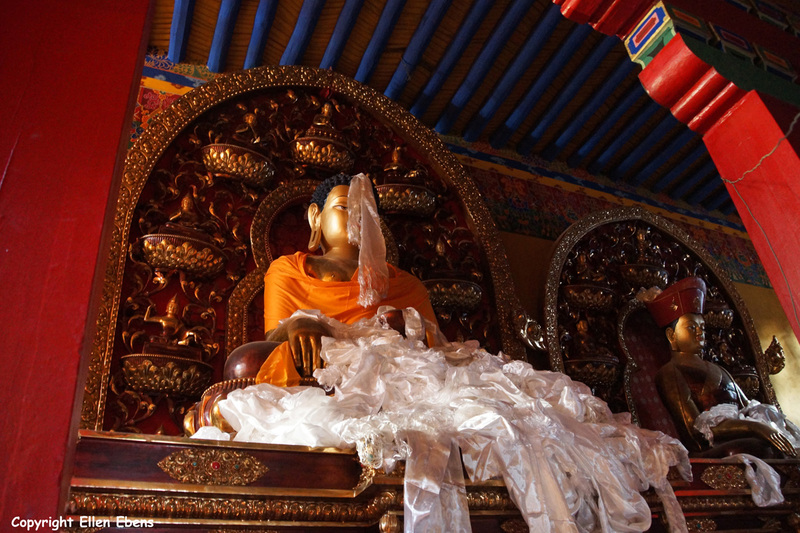 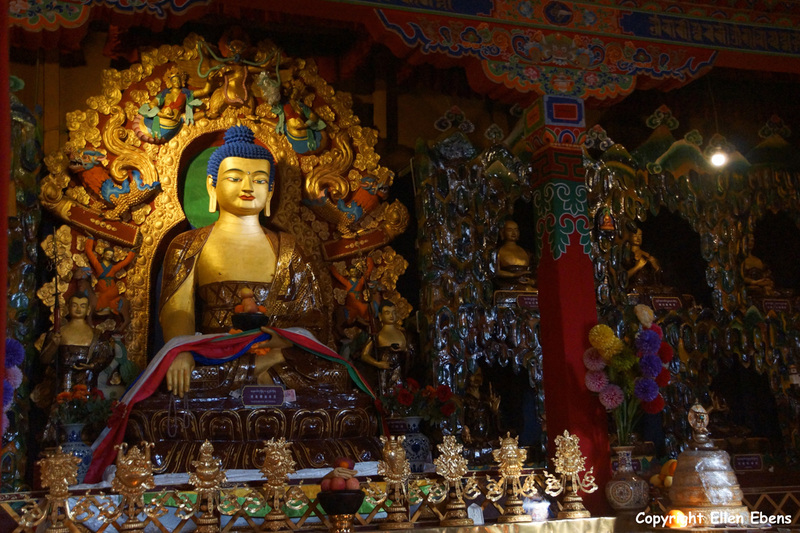 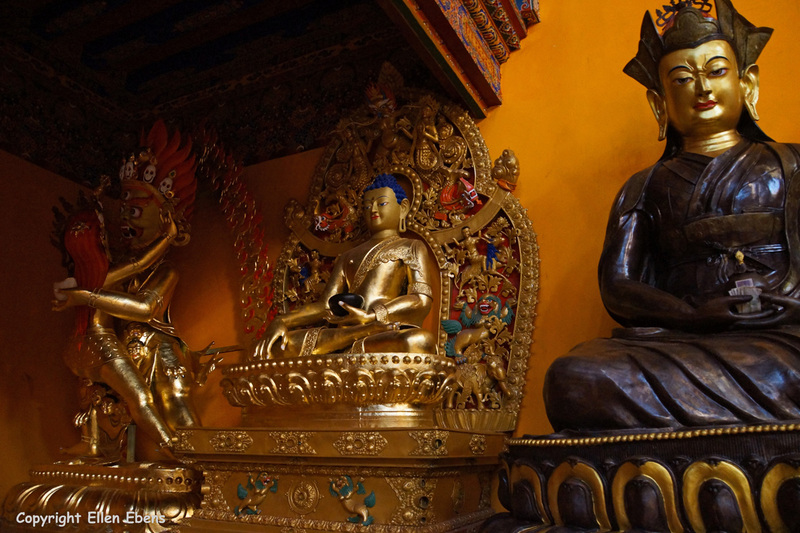 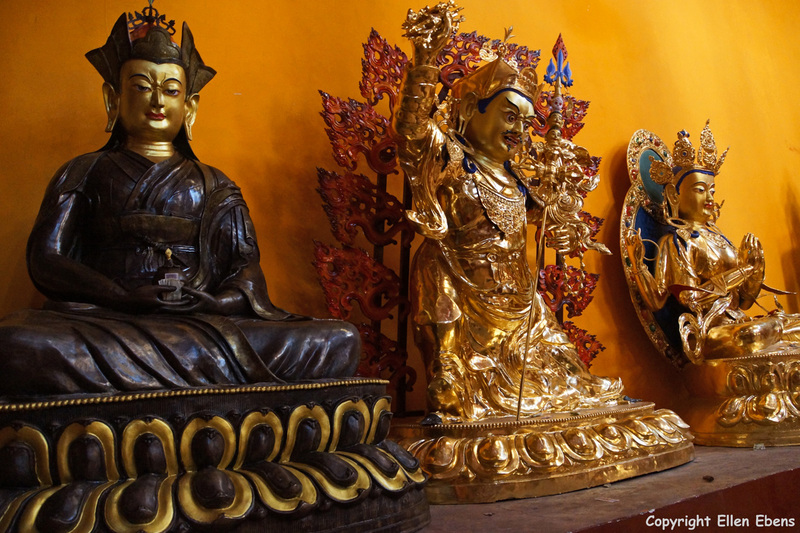 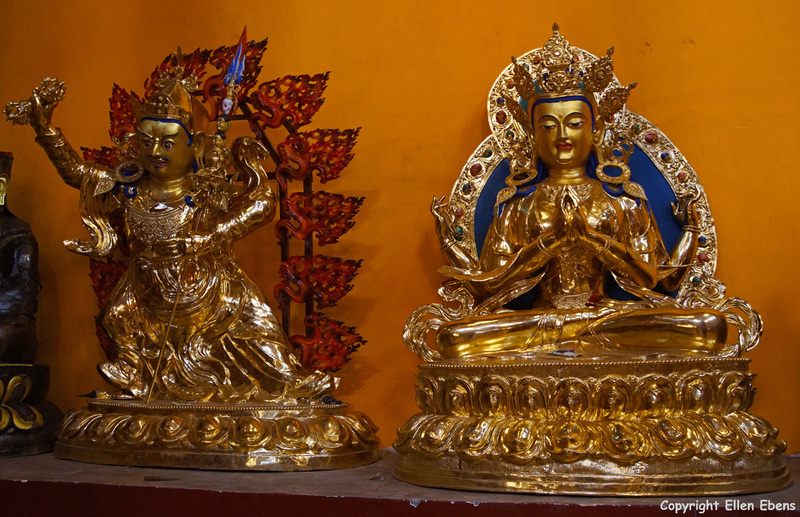 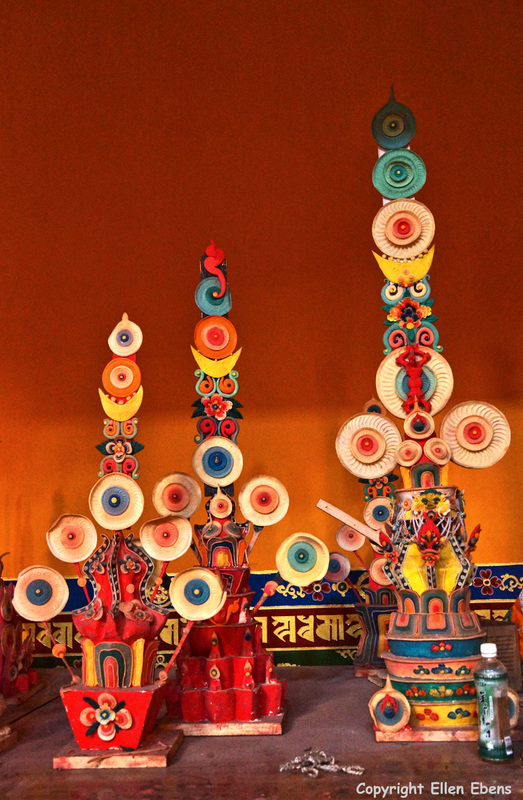 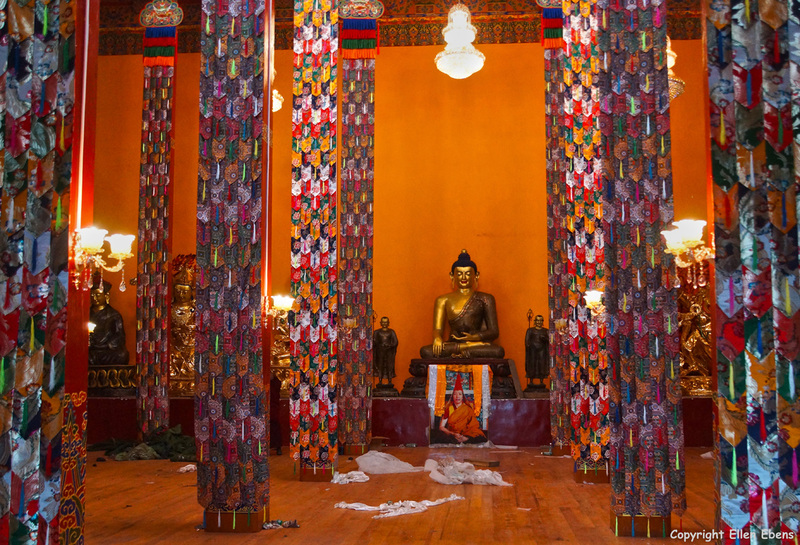 Inside a chapel at Ganden Monastery. 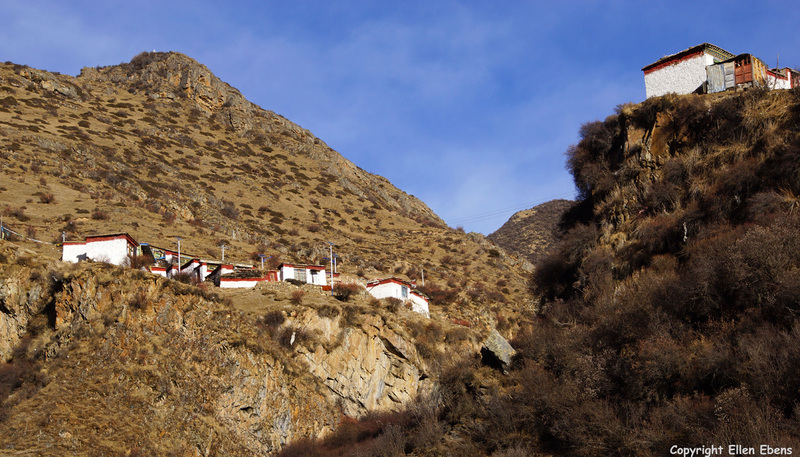 Tidrum Nunnery. 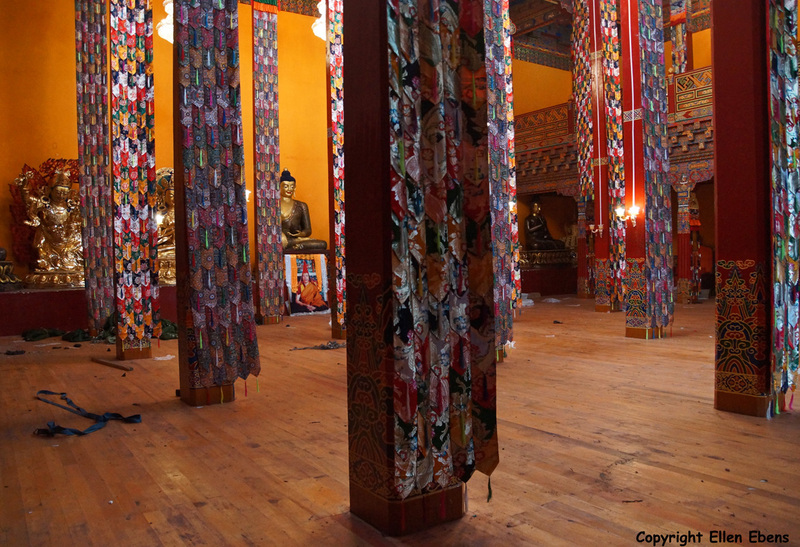 The main Assembly Hall is rebuild and not yet totally ready. 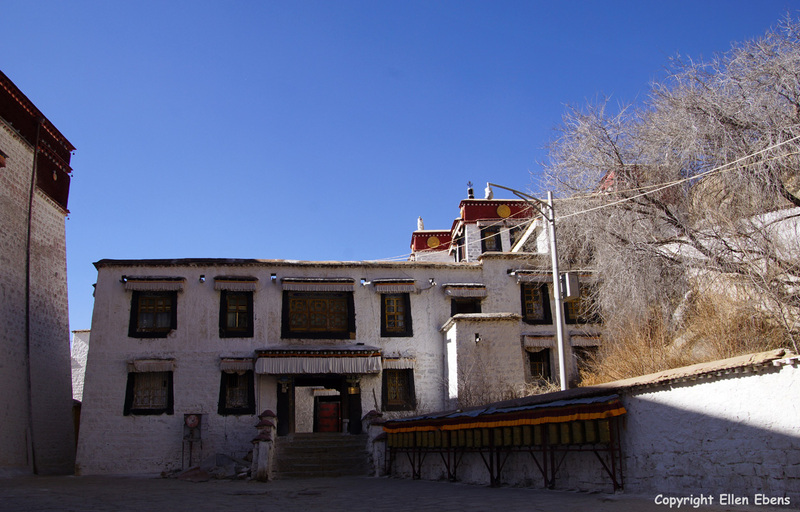 Tidrum Nunnery. 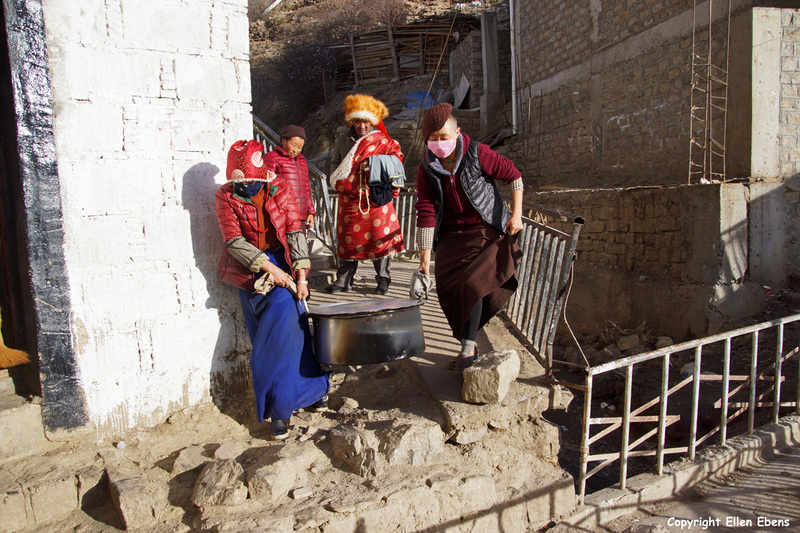 Nuns cooking dinner. 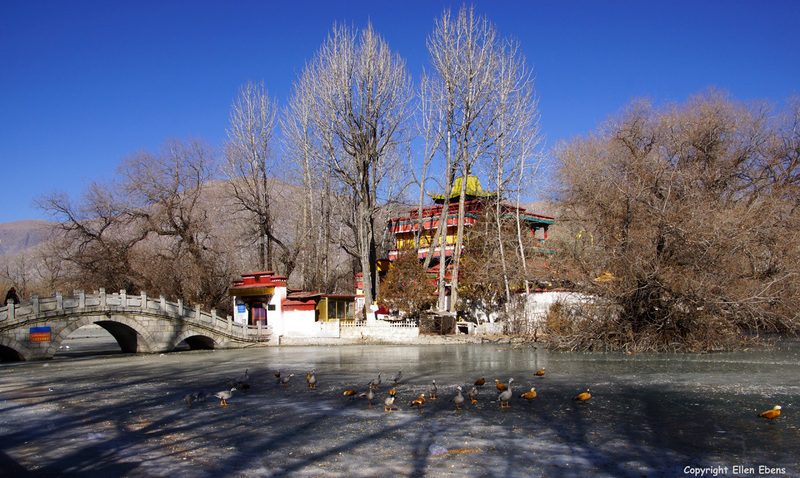 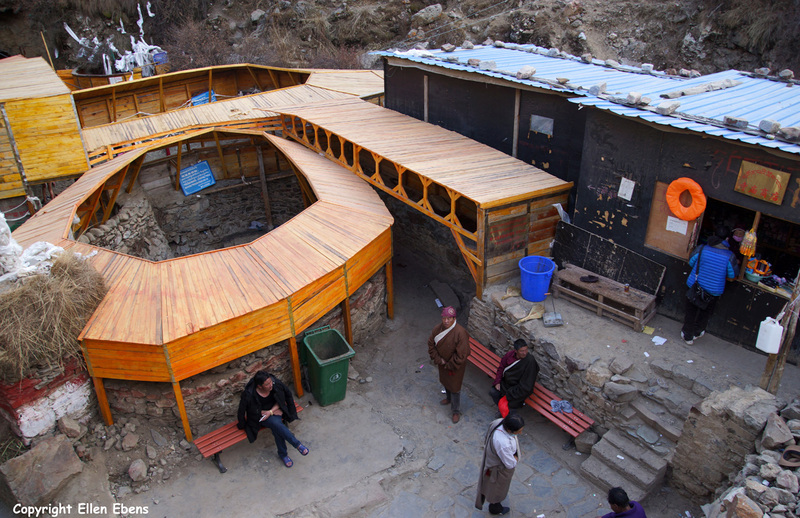 The hot springs at Tidrum Nunnery. 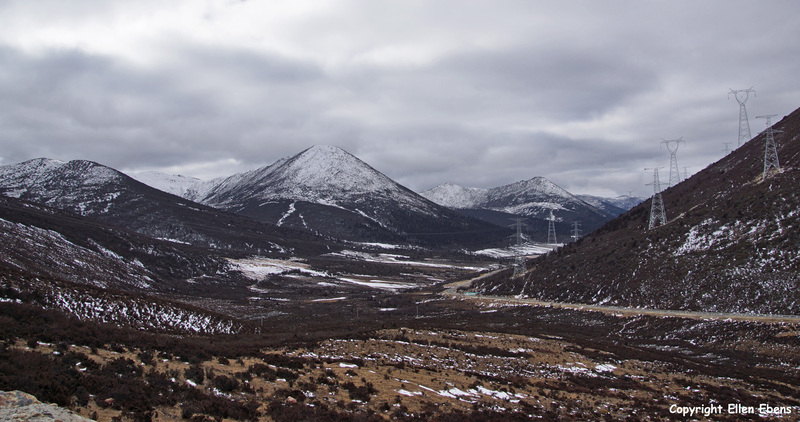 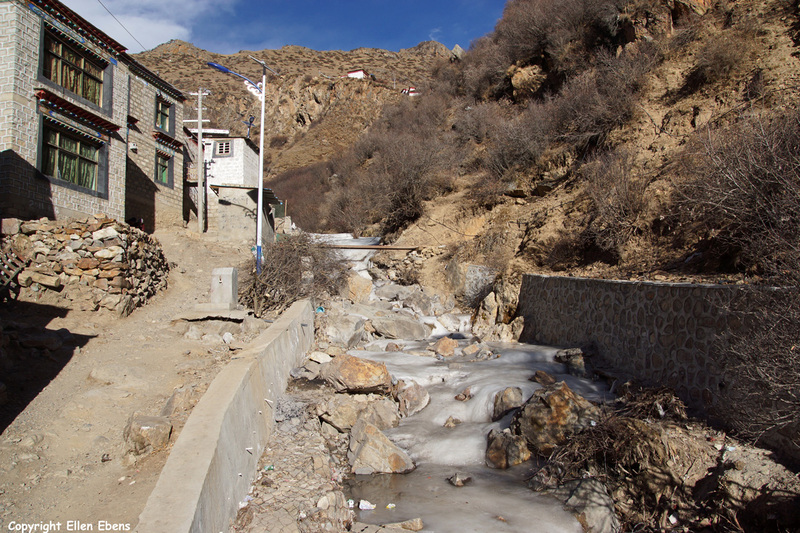 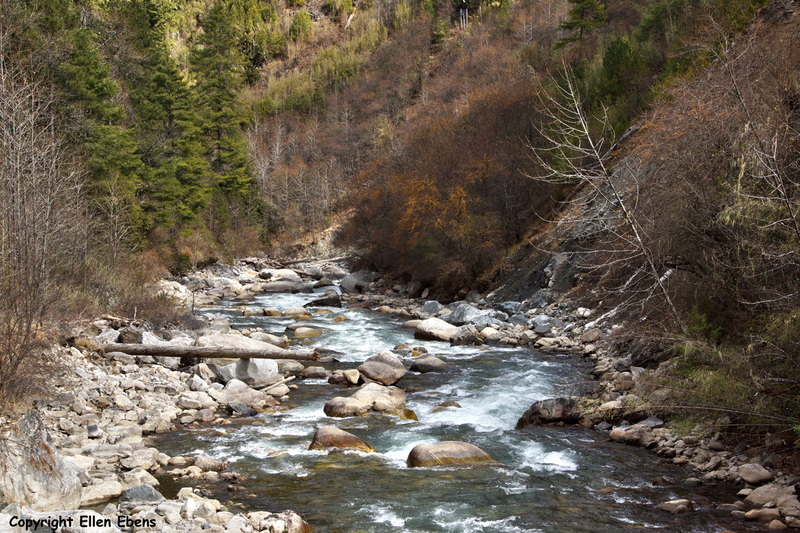 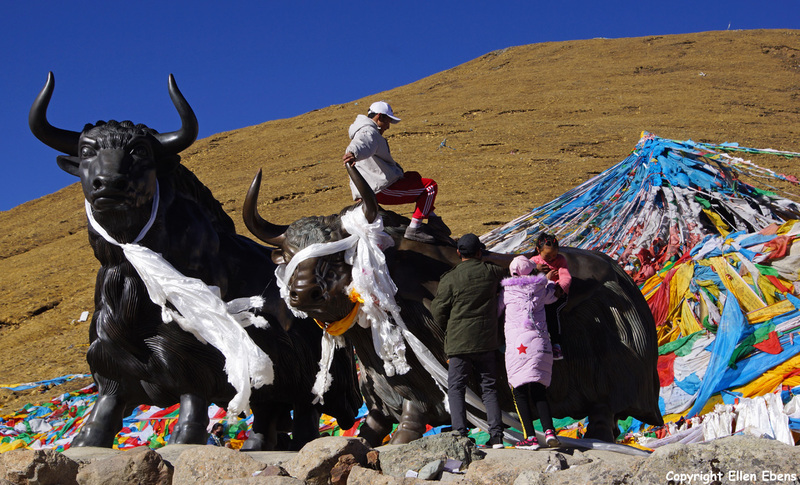 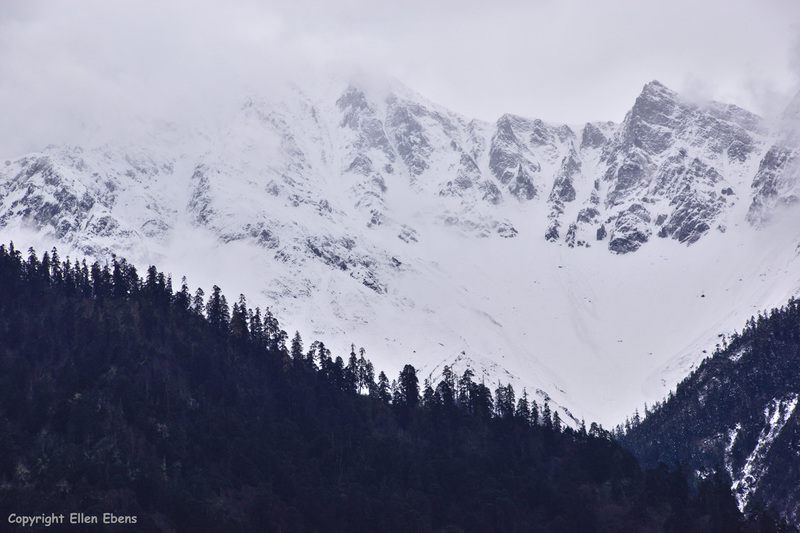 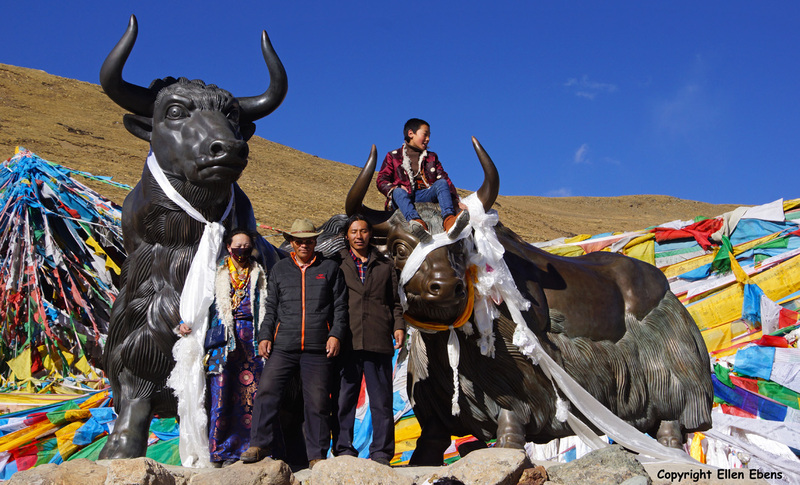 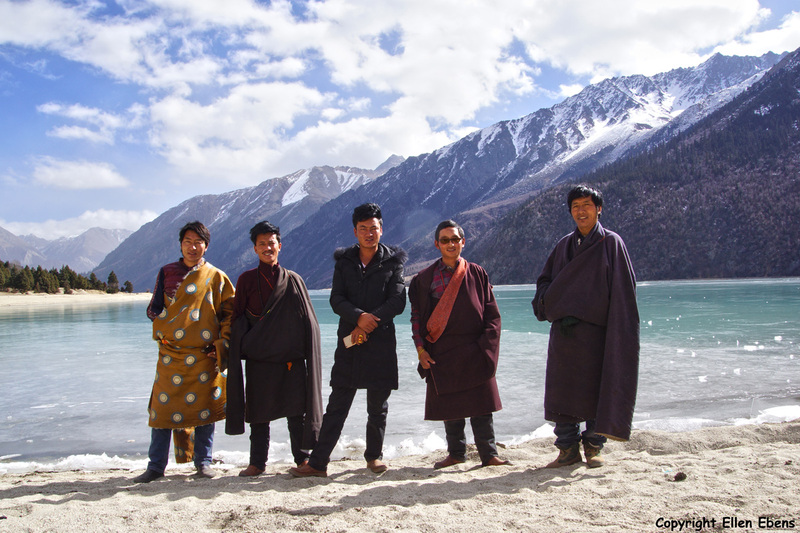 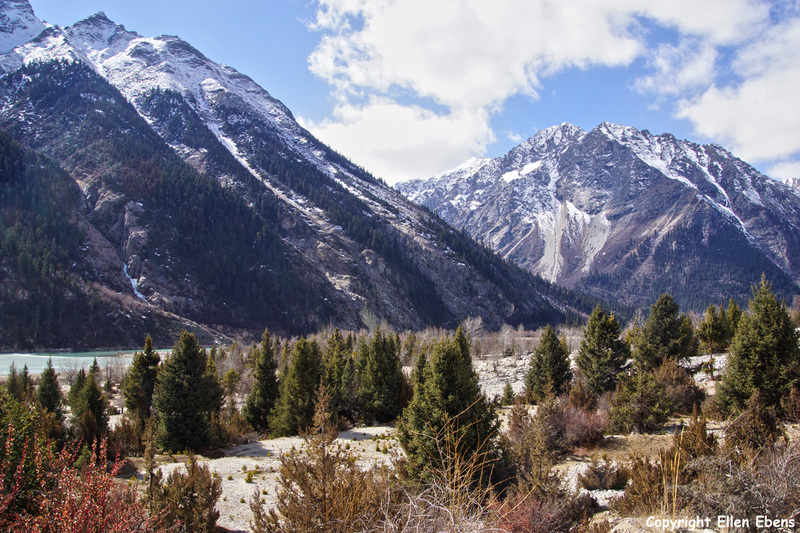 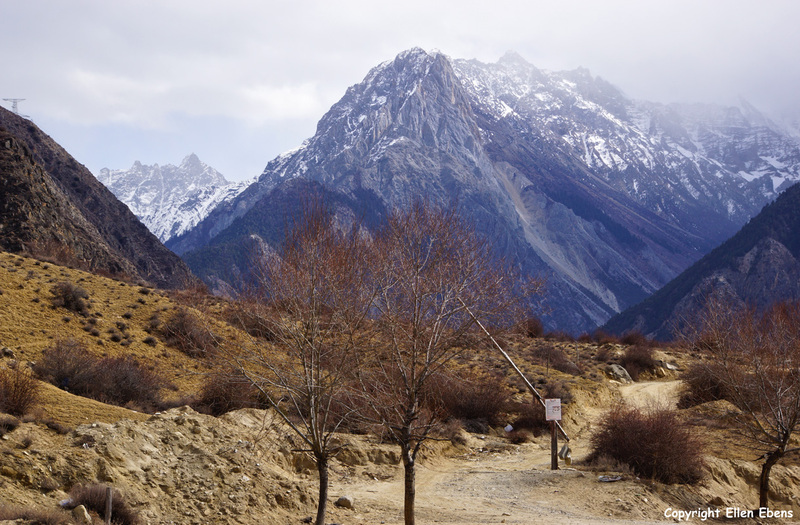 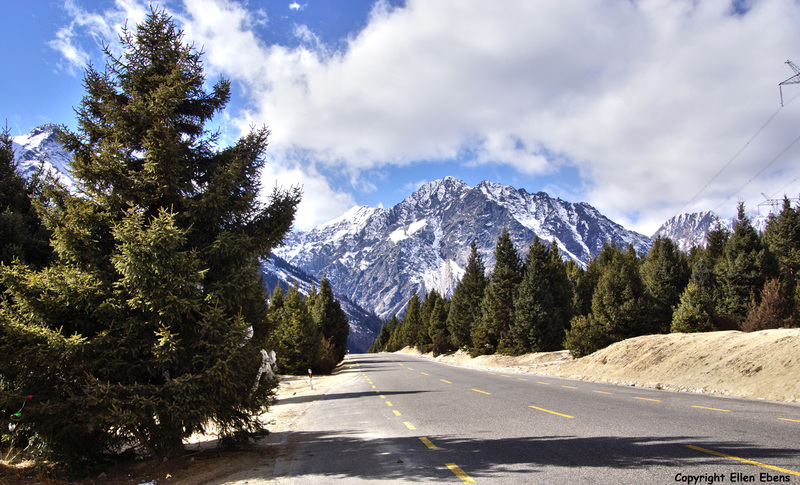 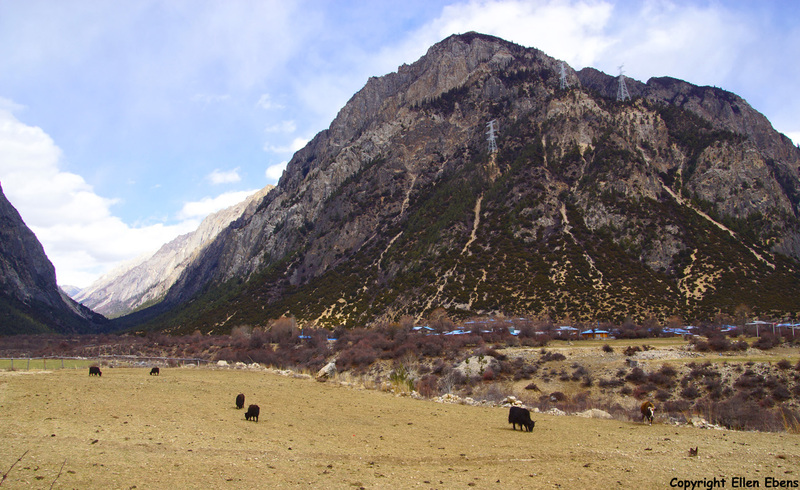 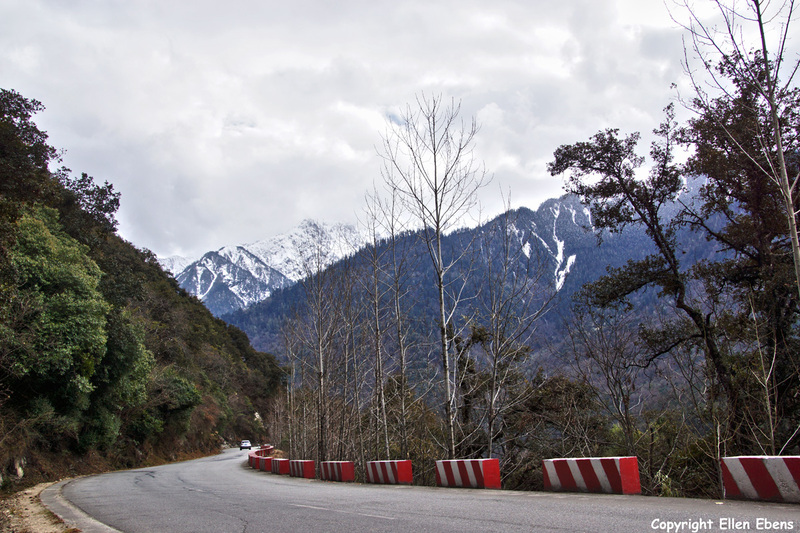 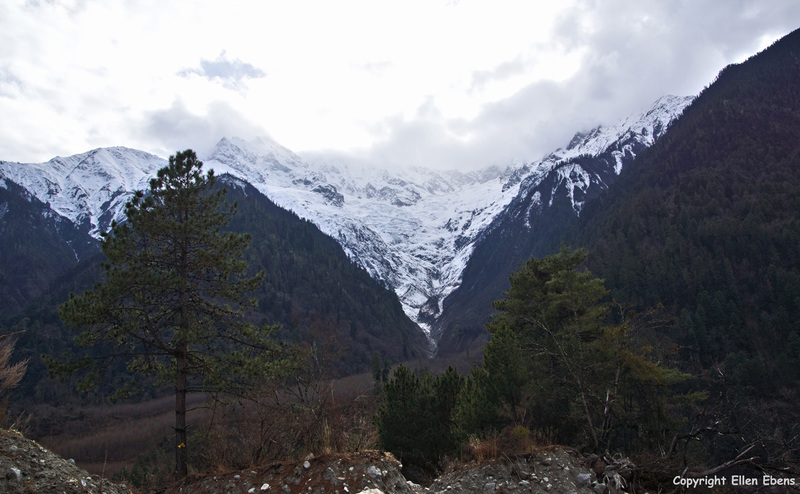 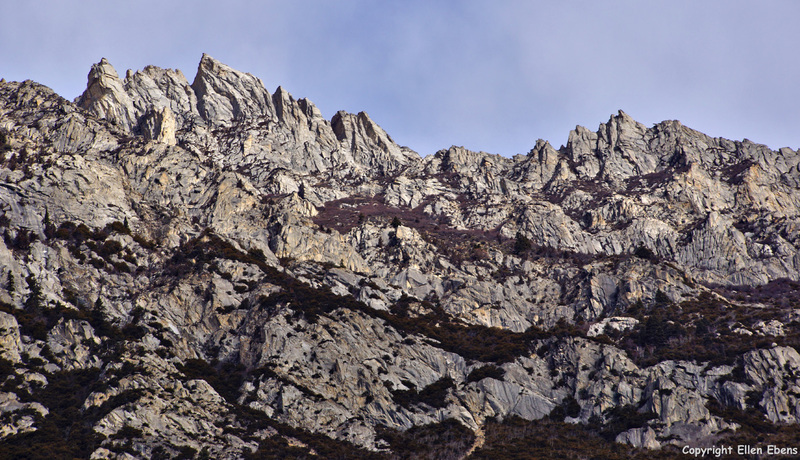 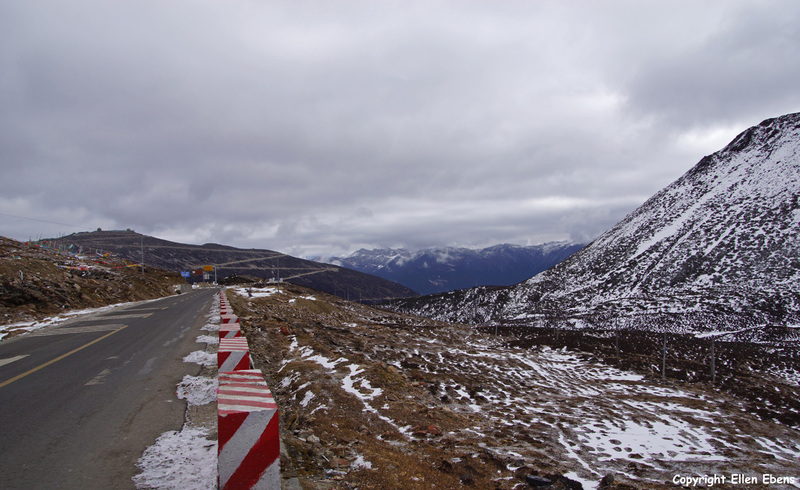 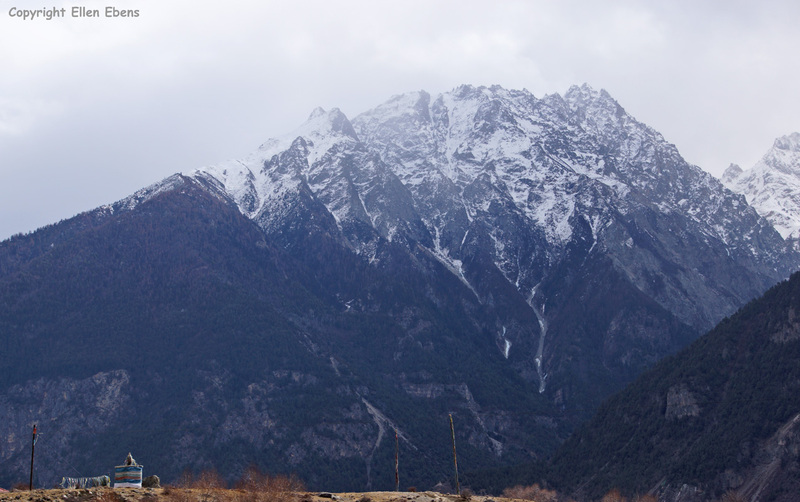 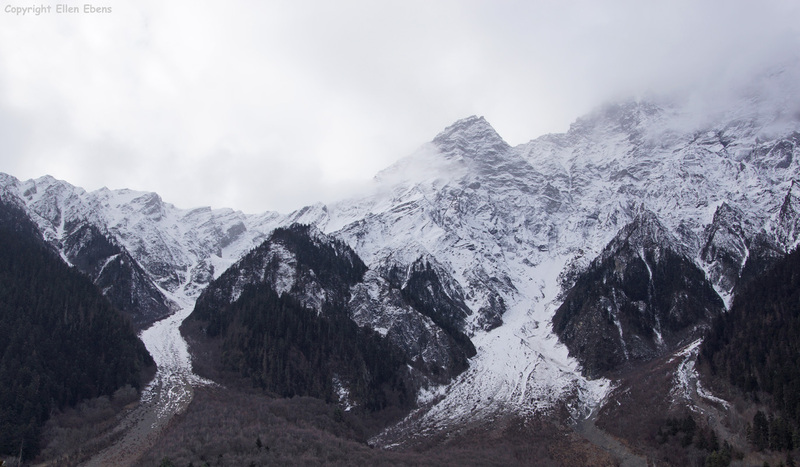 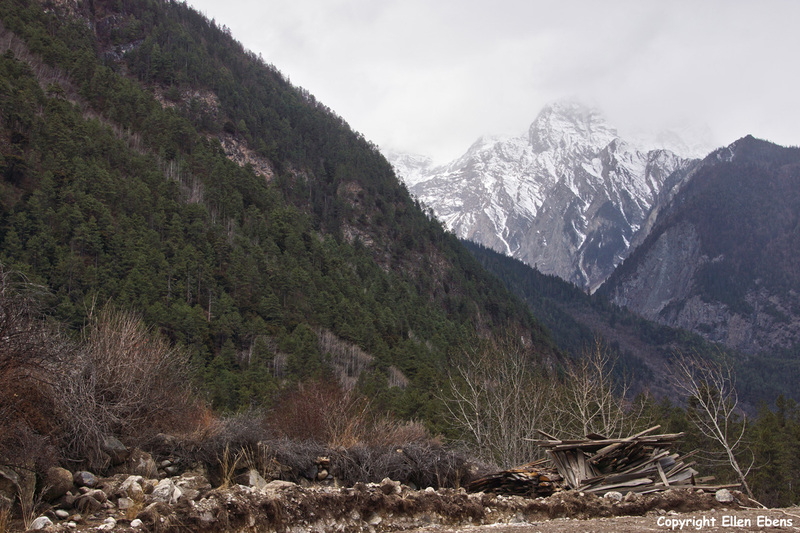 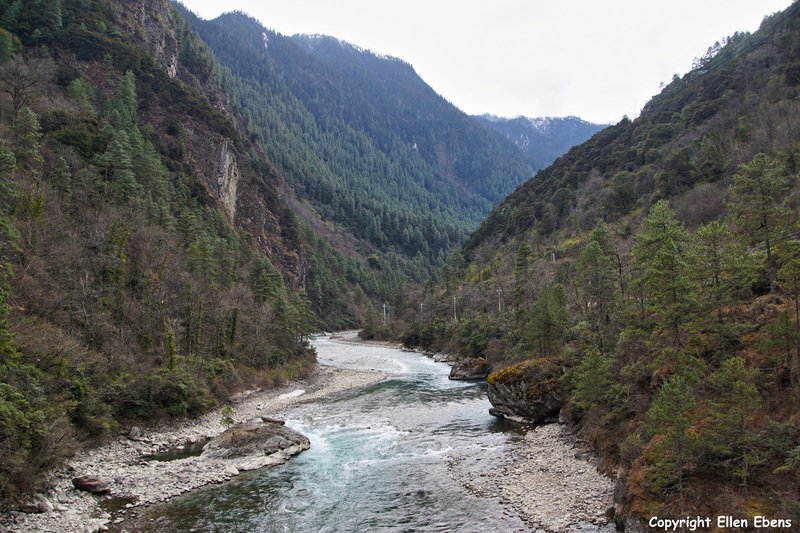 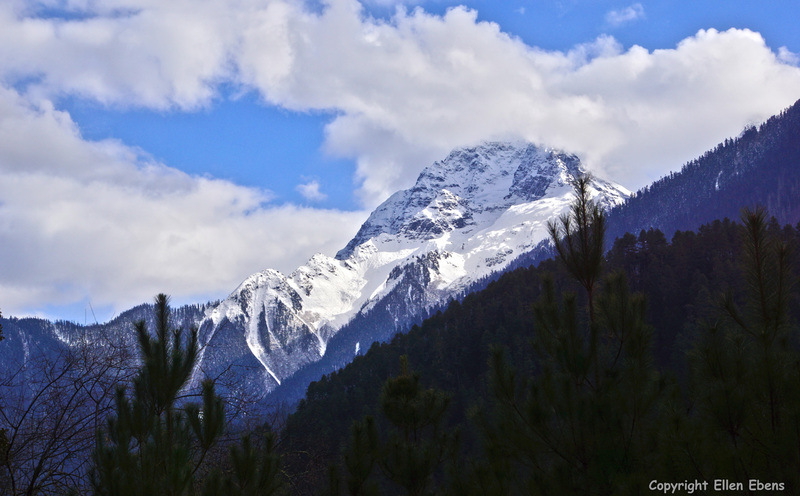 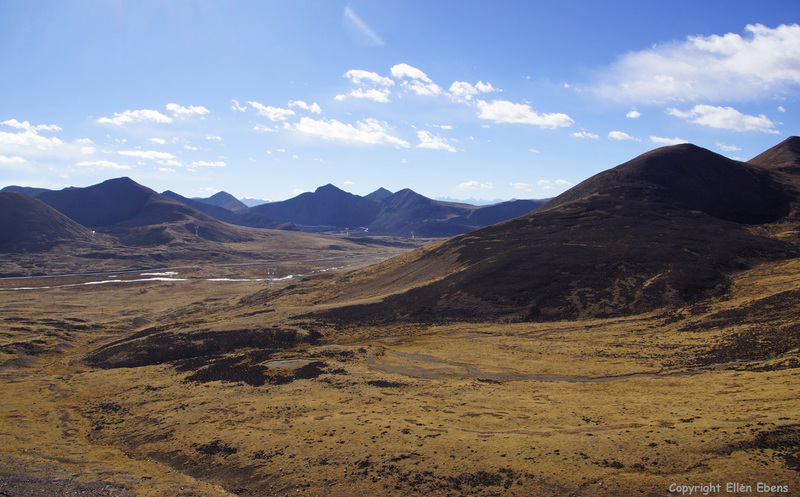 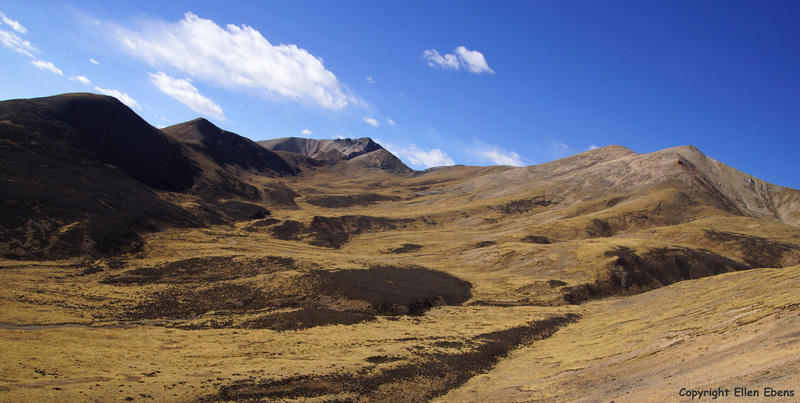 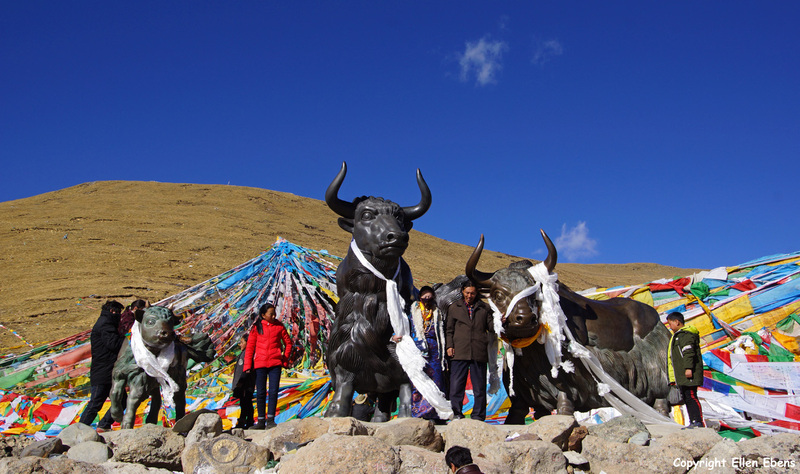 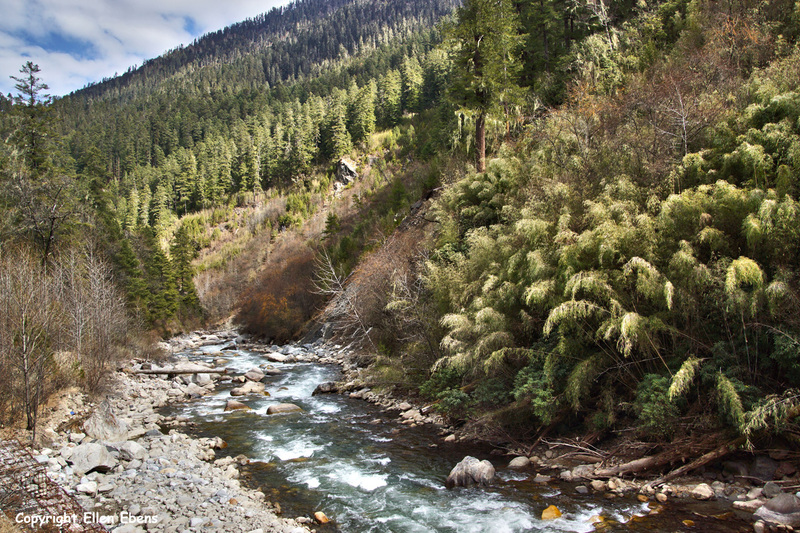 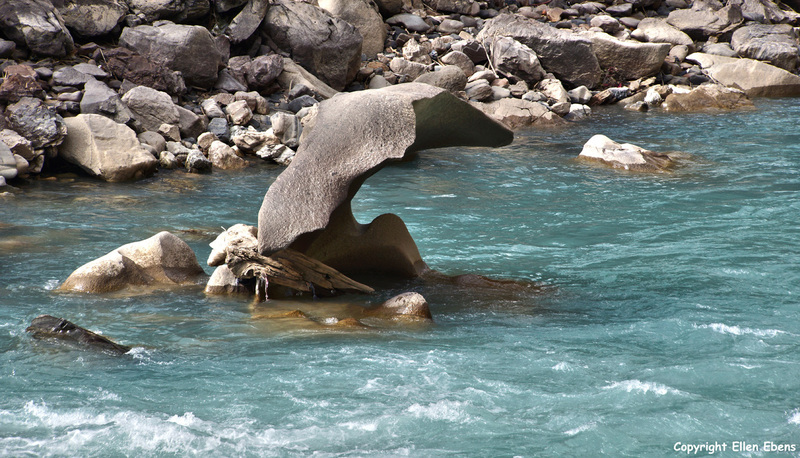 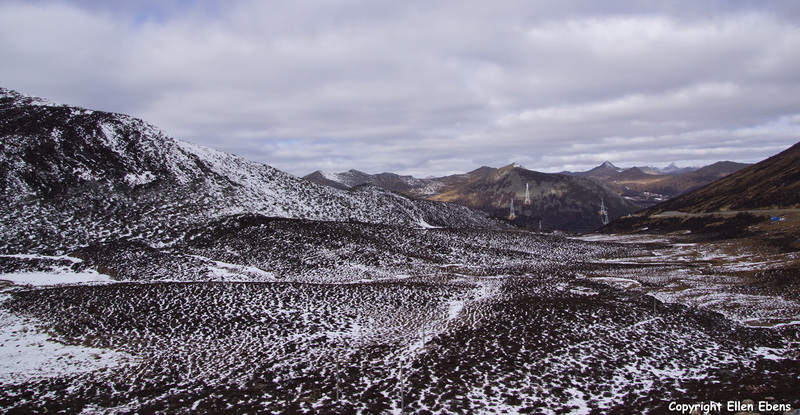 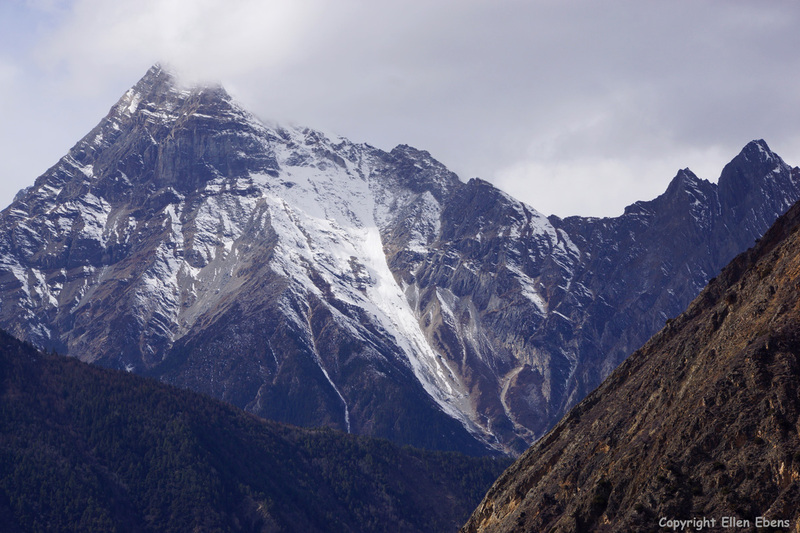 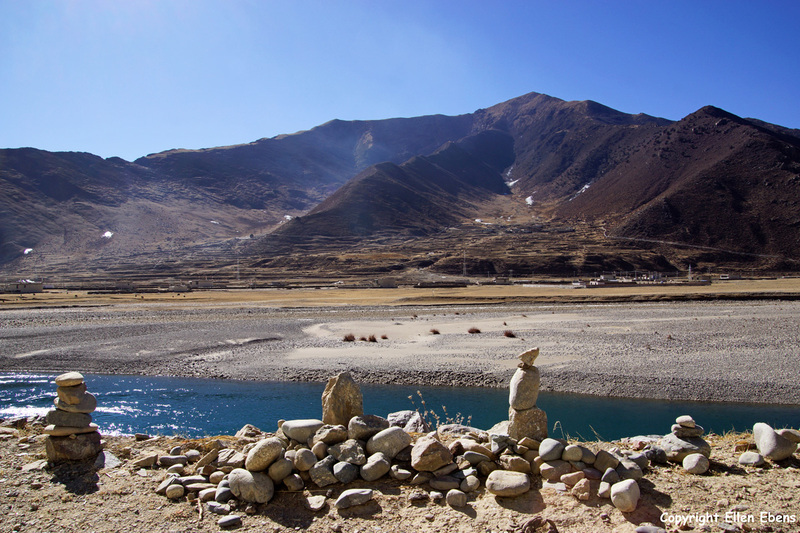 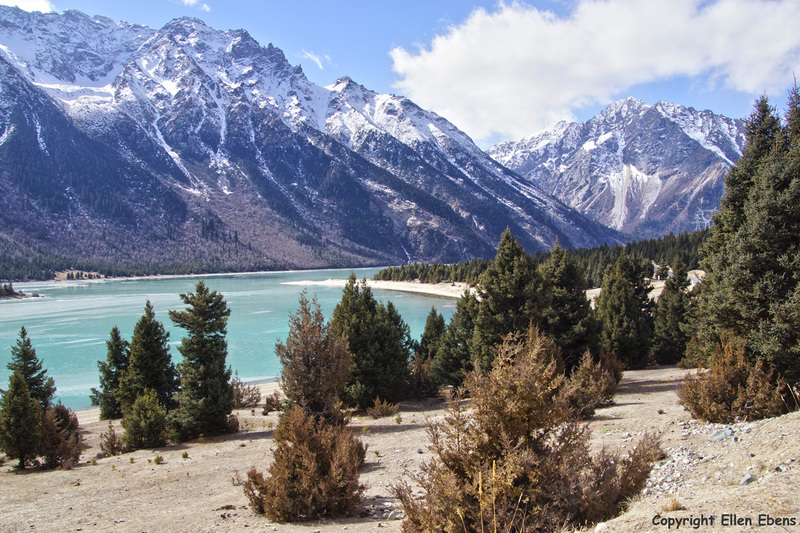 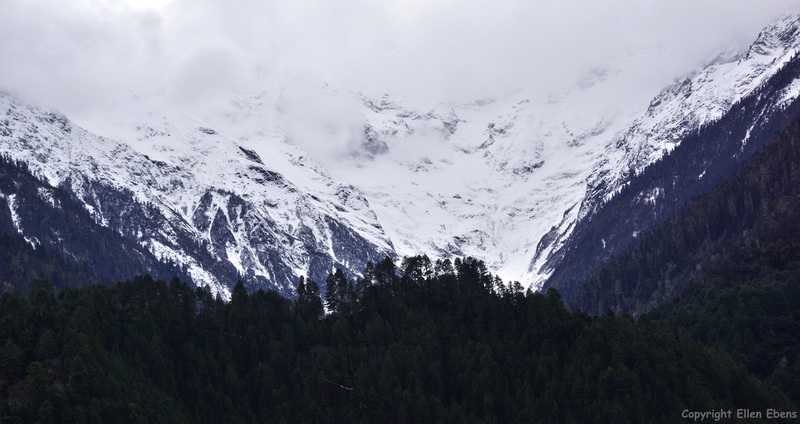 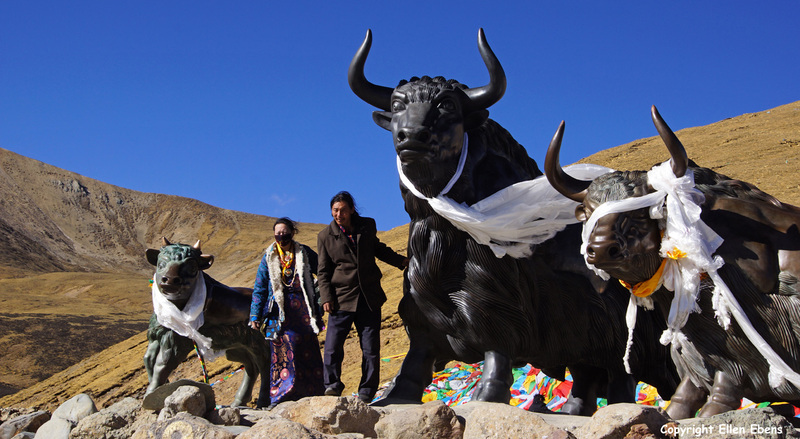 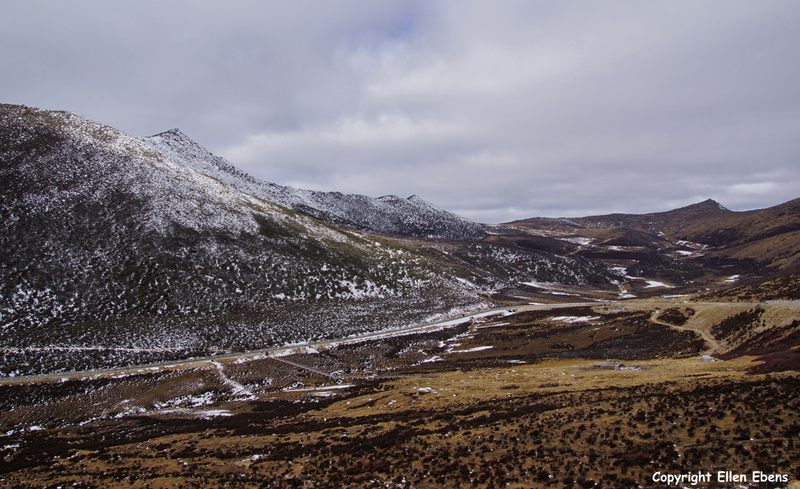 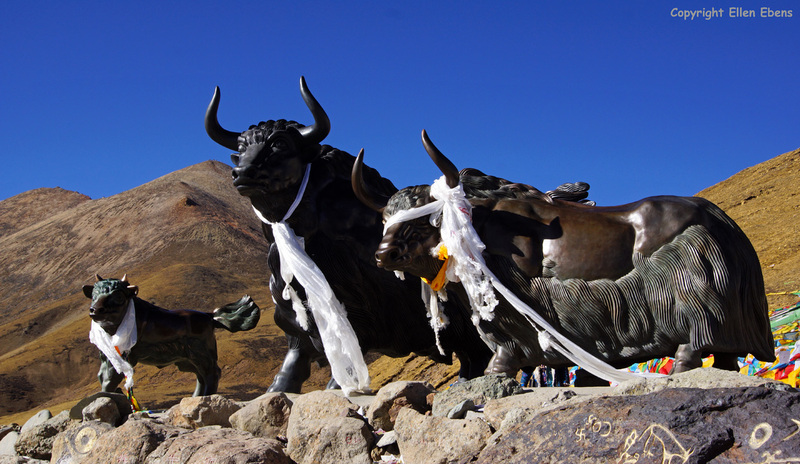 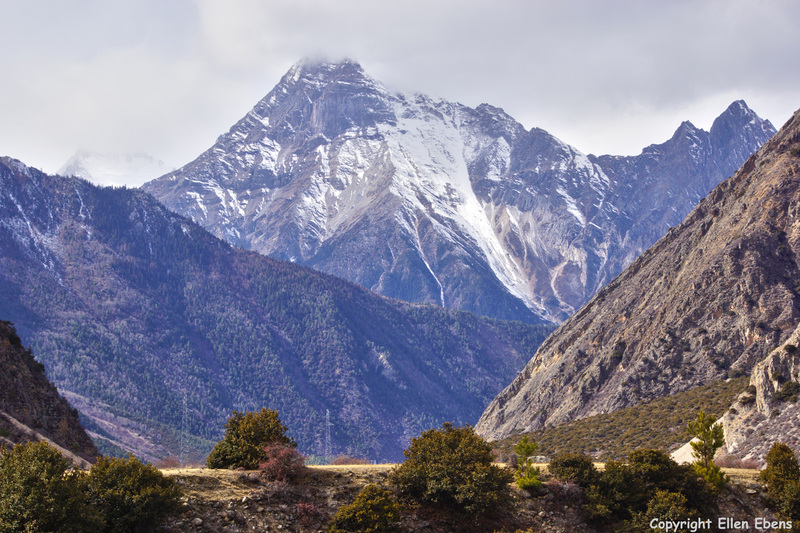 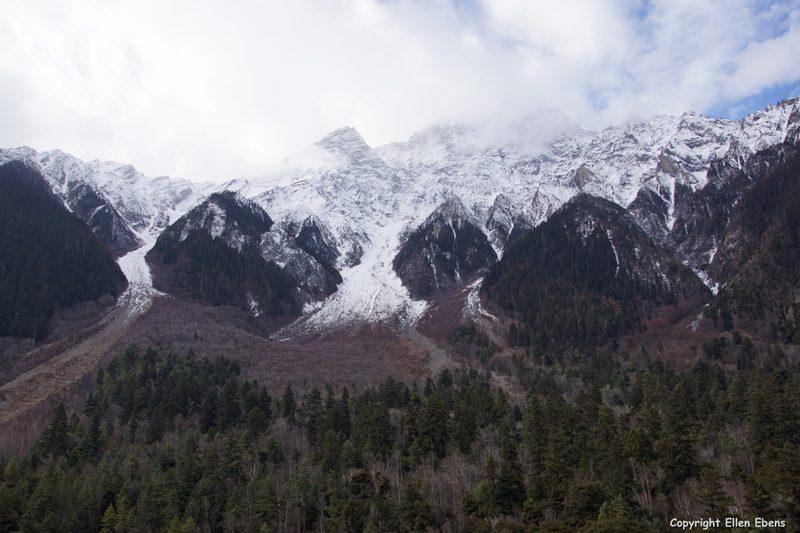 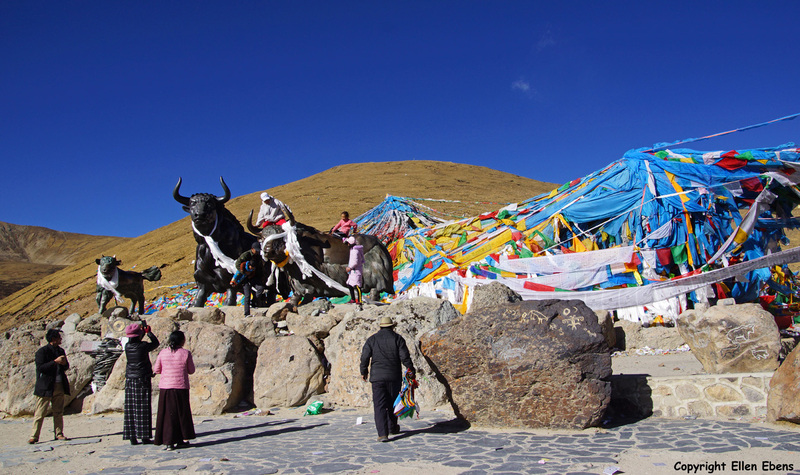 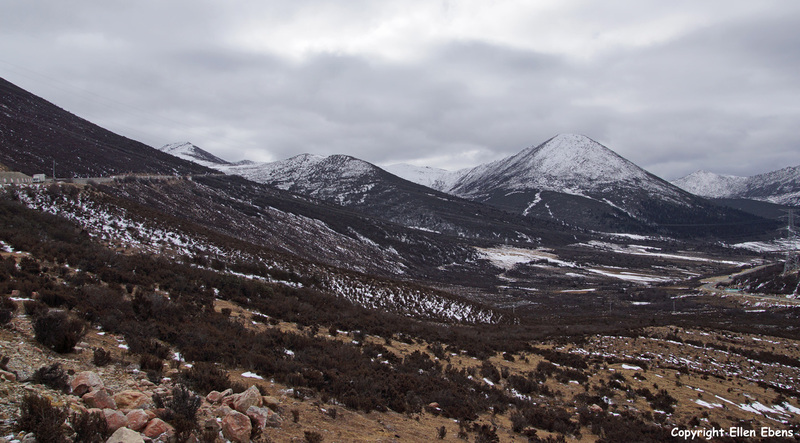 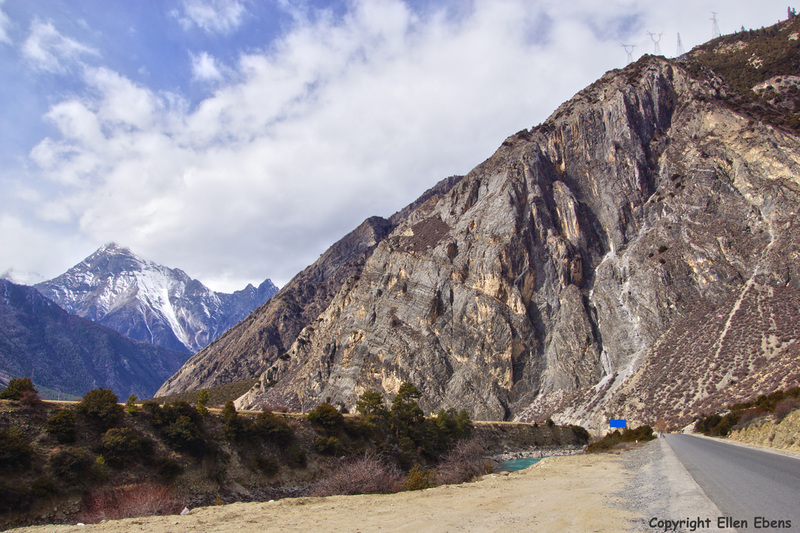 On the road from Nyingchi to Bome you cross the Serkyam La pass of Sejila Mountain pass (4,728 meters). 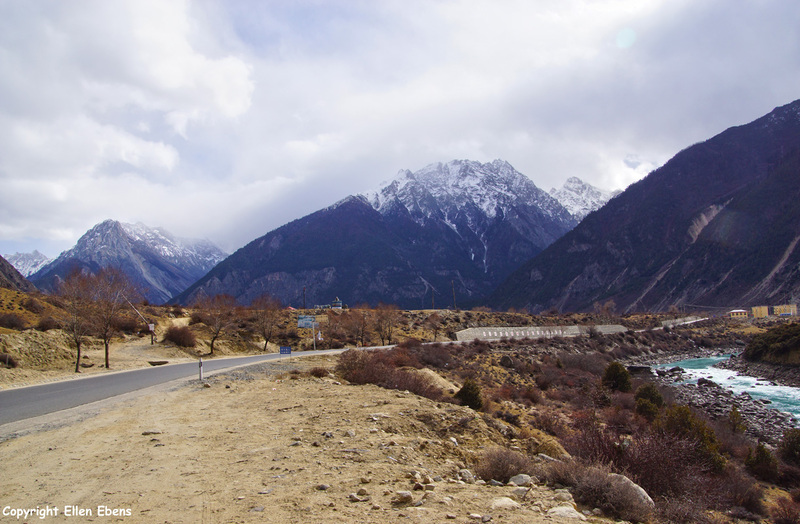 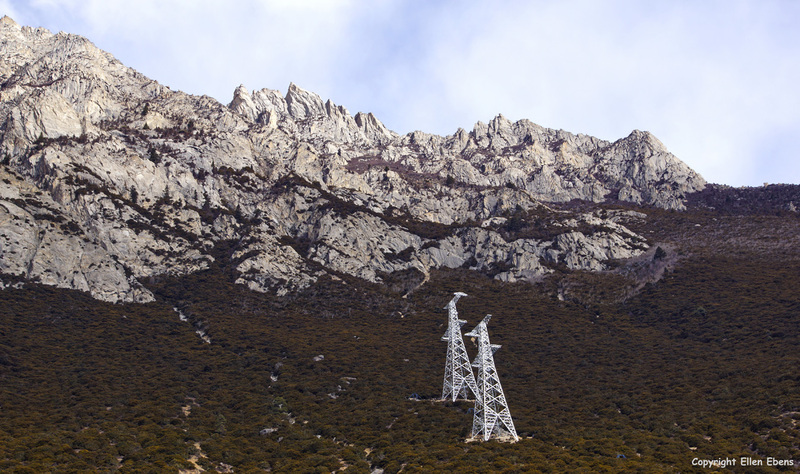 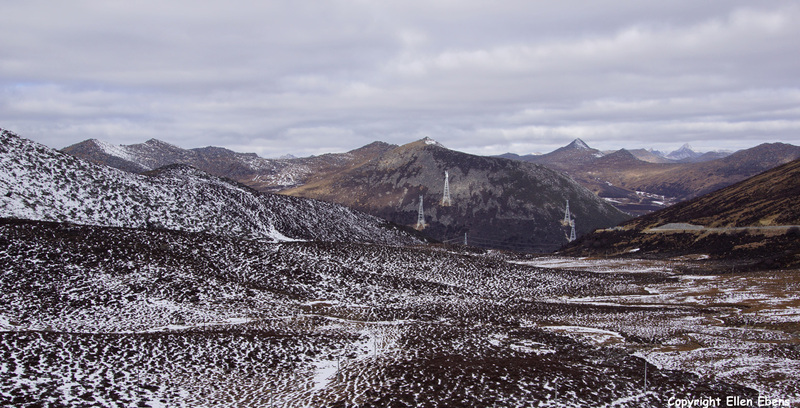 On the right of the picture the Namcha Bawa Mountaing (7,782 meters, the 28th highest mountain in the world) is visible. 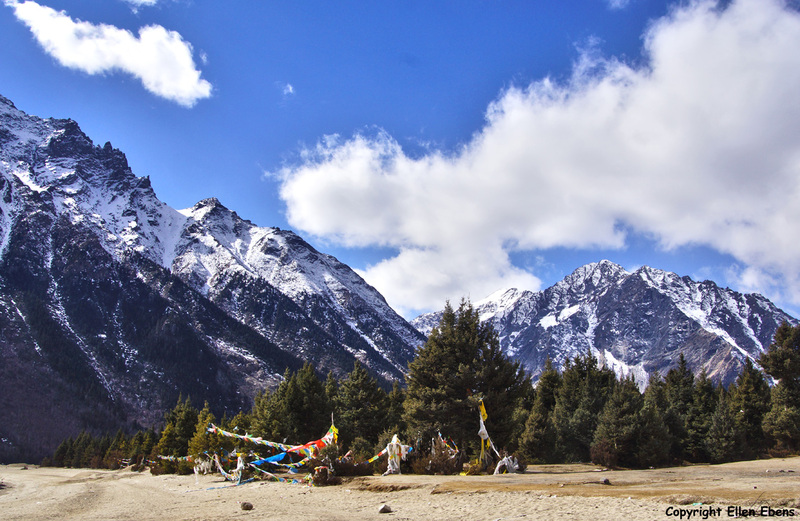 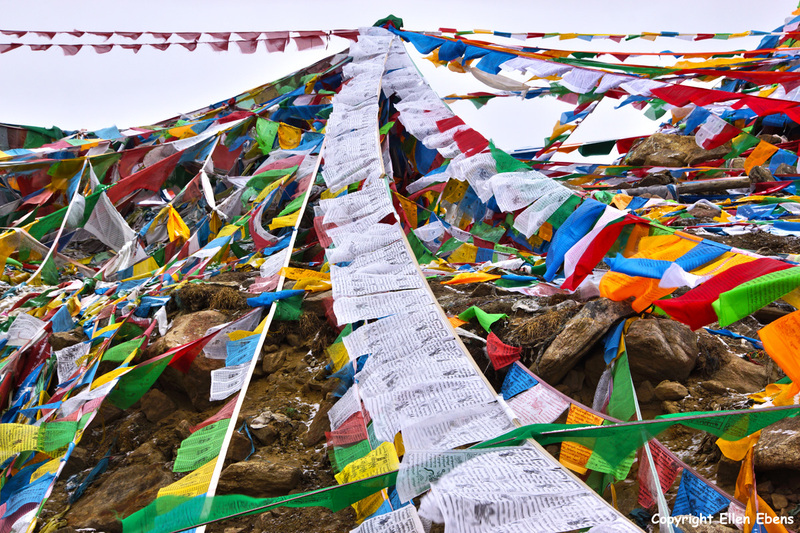 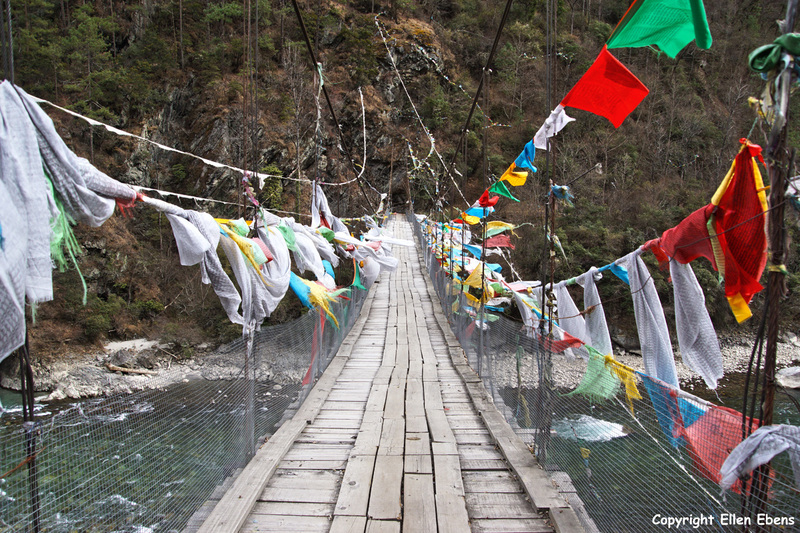 Prayer flags on the Serkyam La pass of Sejila Mountain pass (4,728 meters). 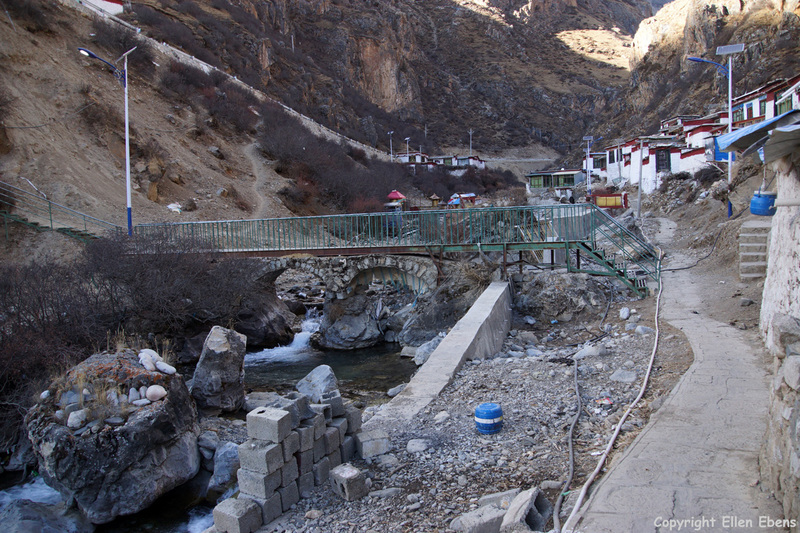 A little town in eastern Tibet, on google maps called Nage. 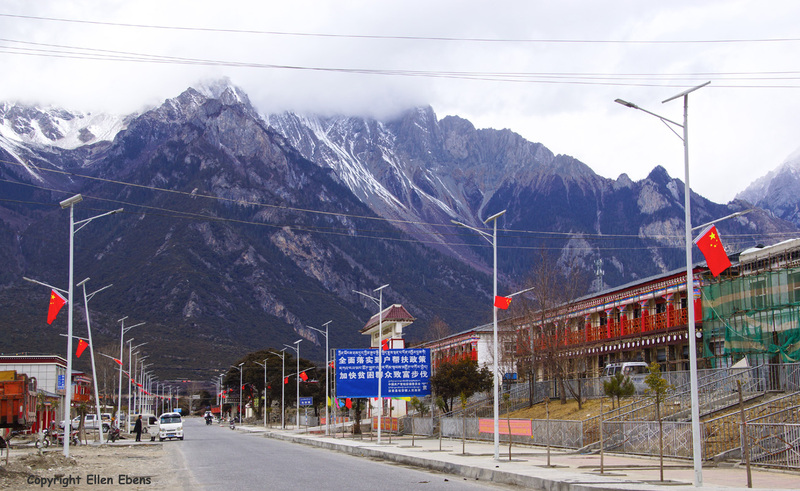 It’s a newly constructed town. 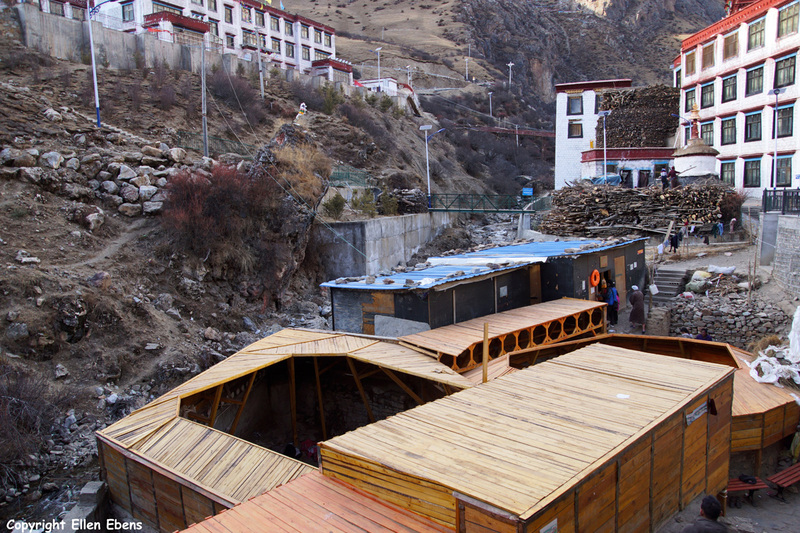 Construction work is still going on. 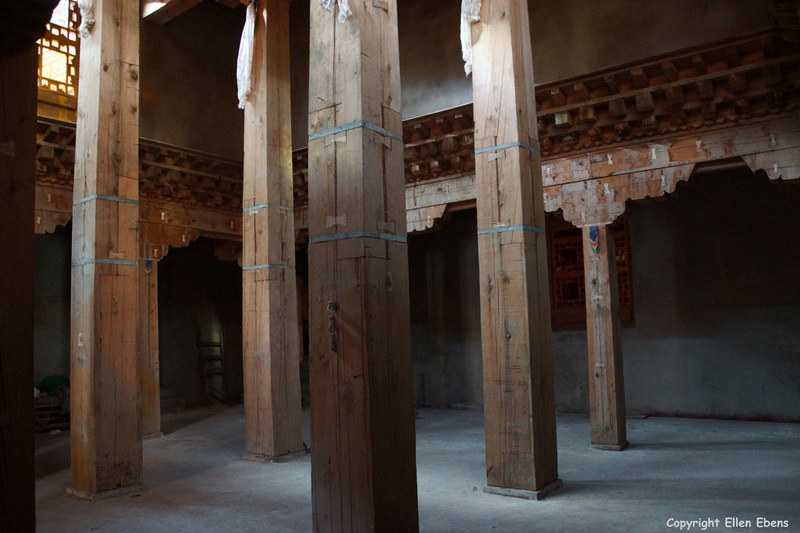 It’s built in the local style. 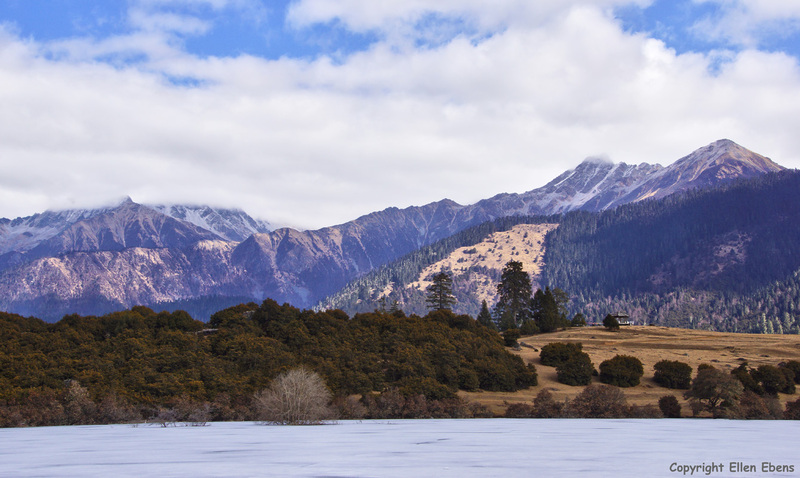 View over the frozen lake on the little town of Nage. 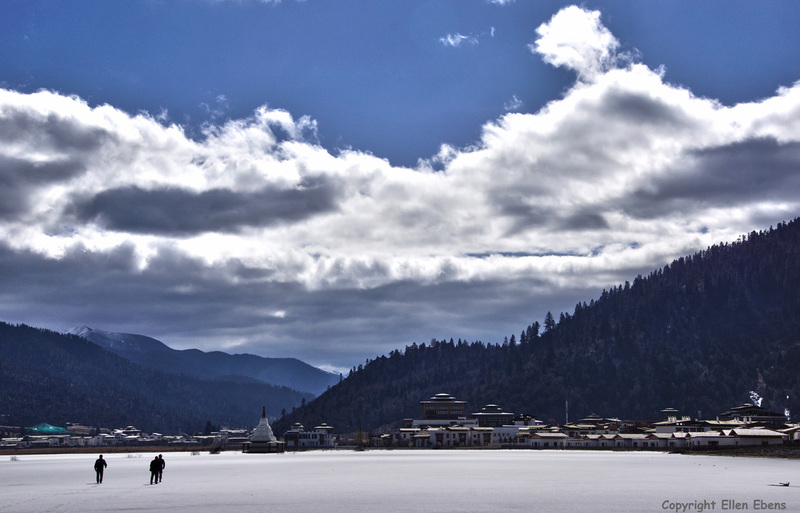 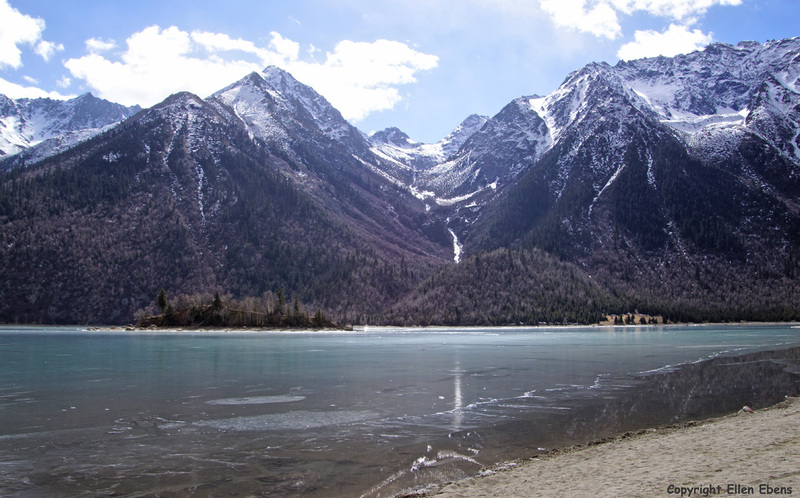 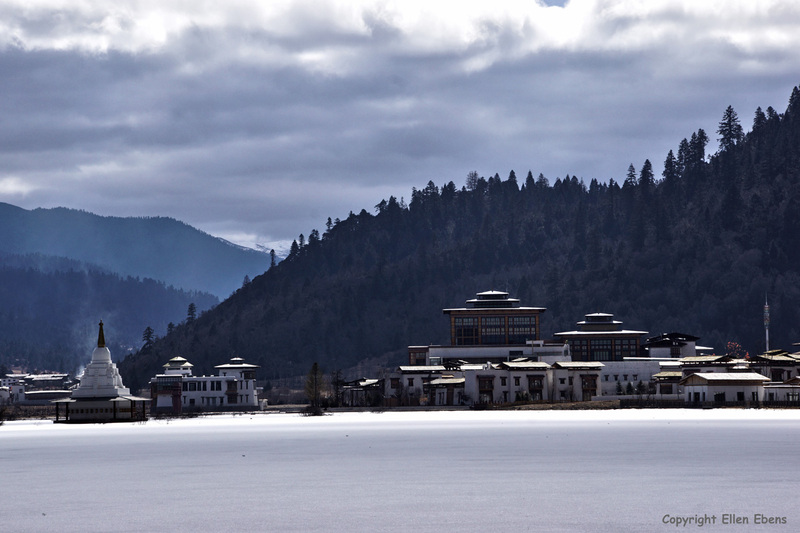 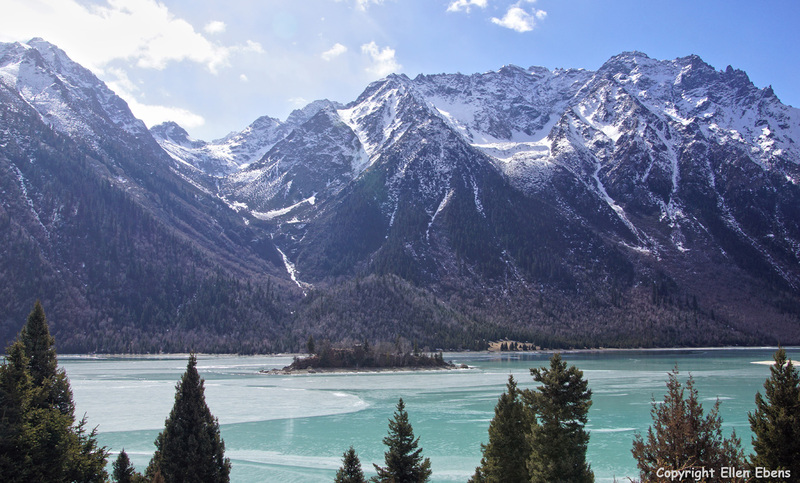 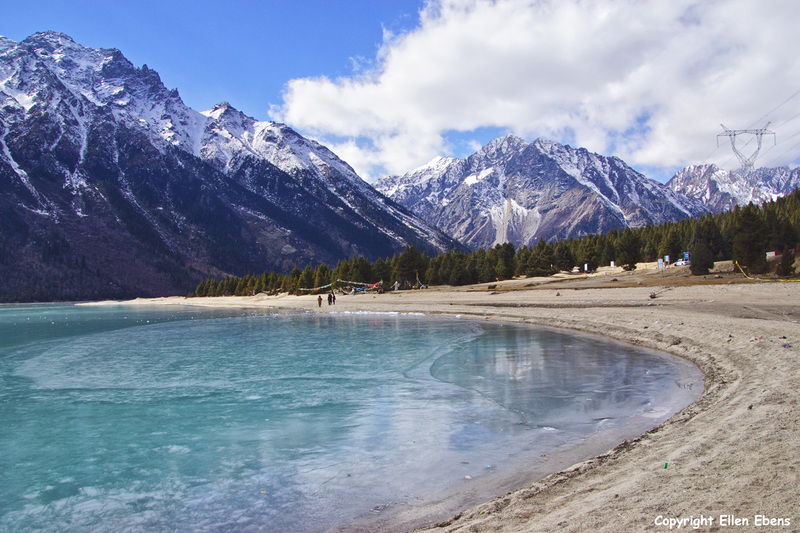 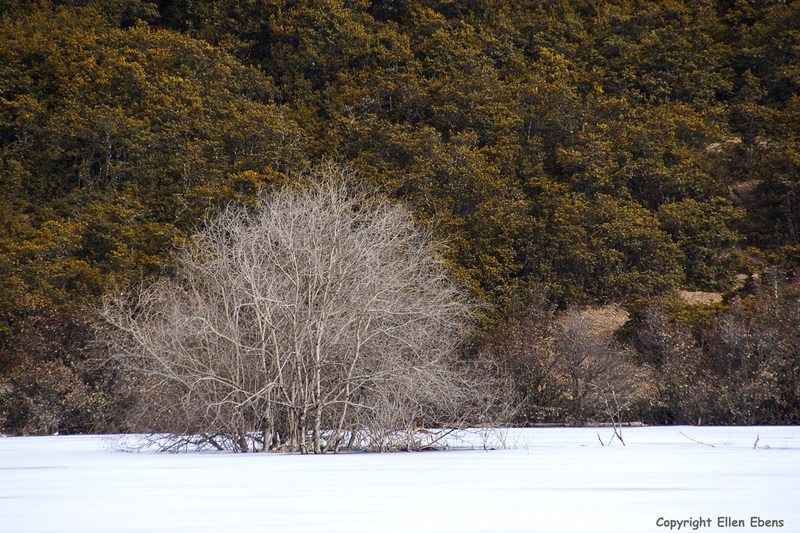 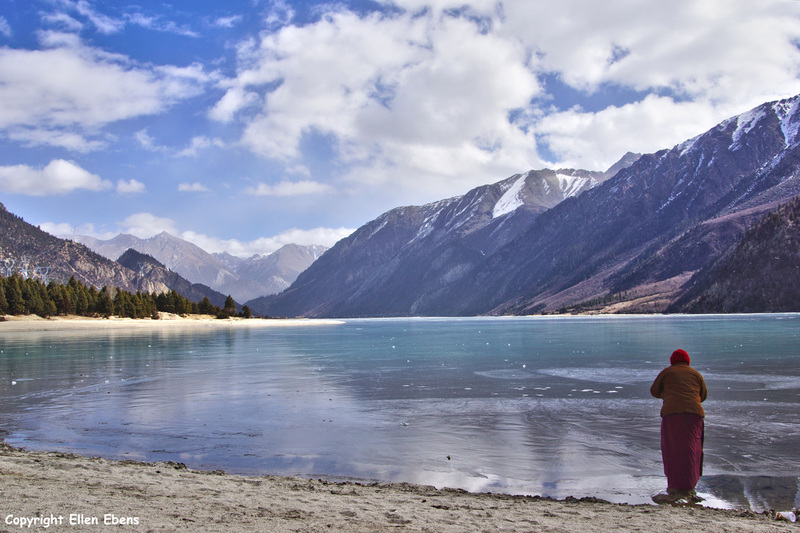 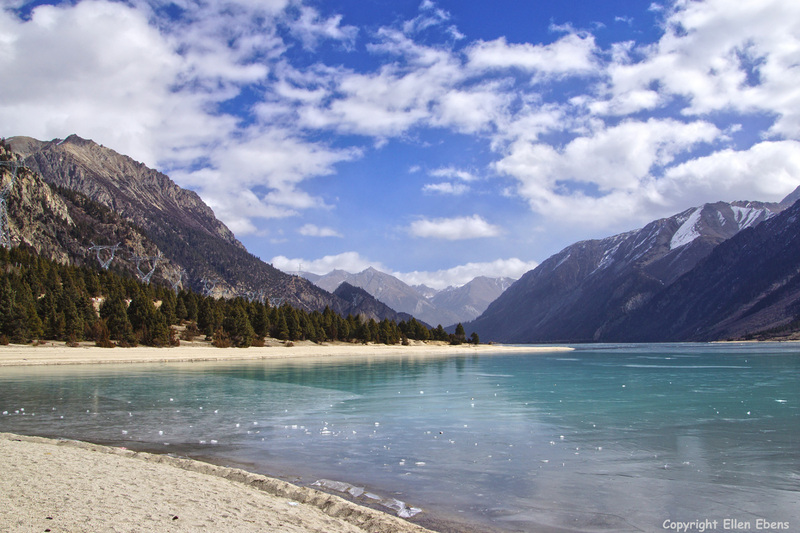 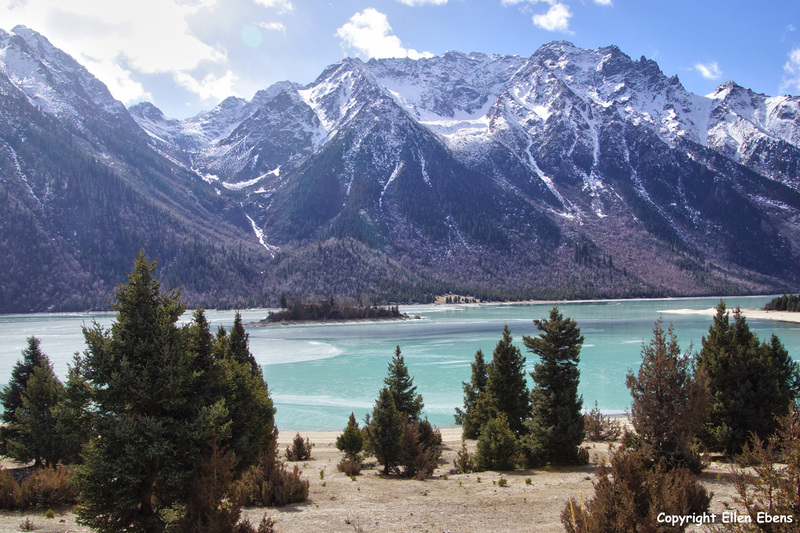 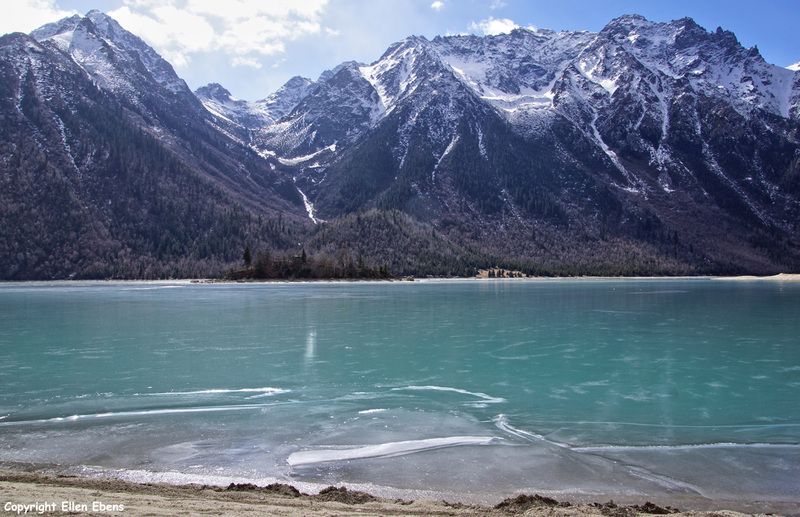 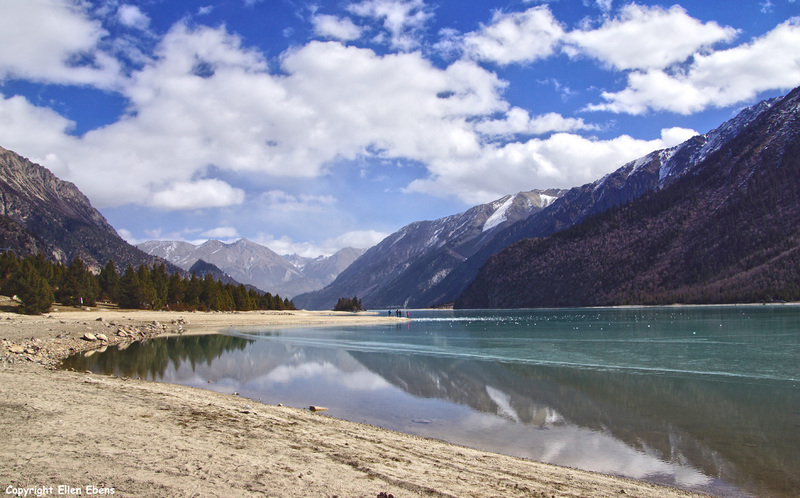 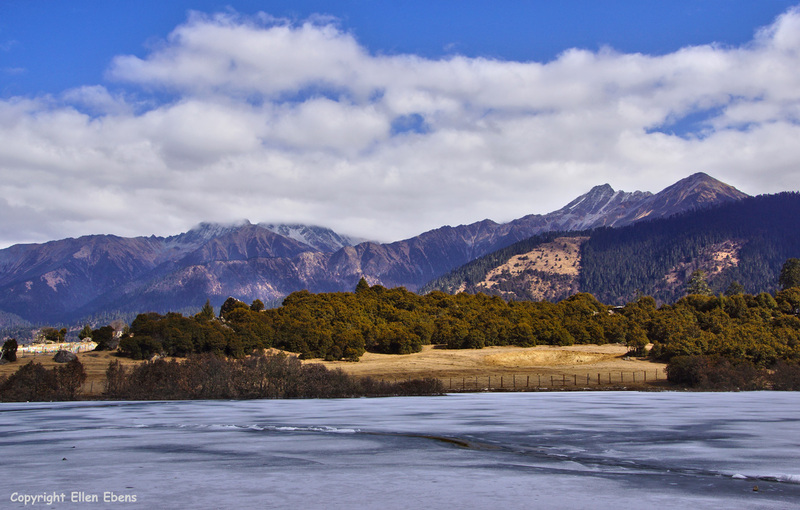 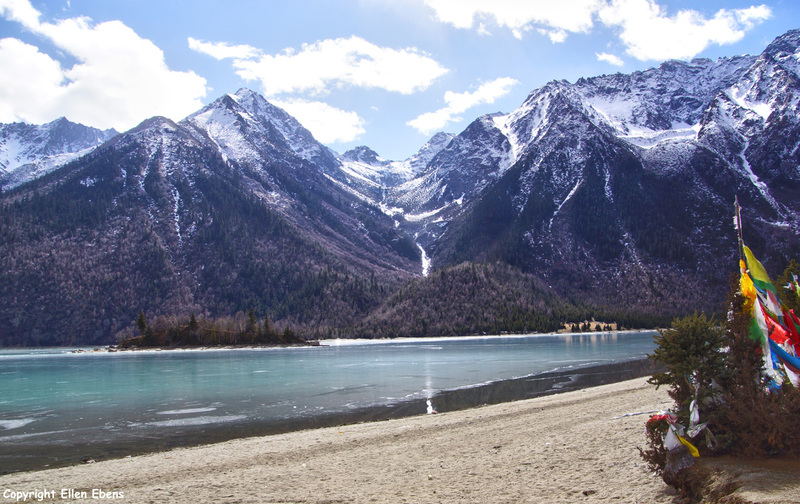 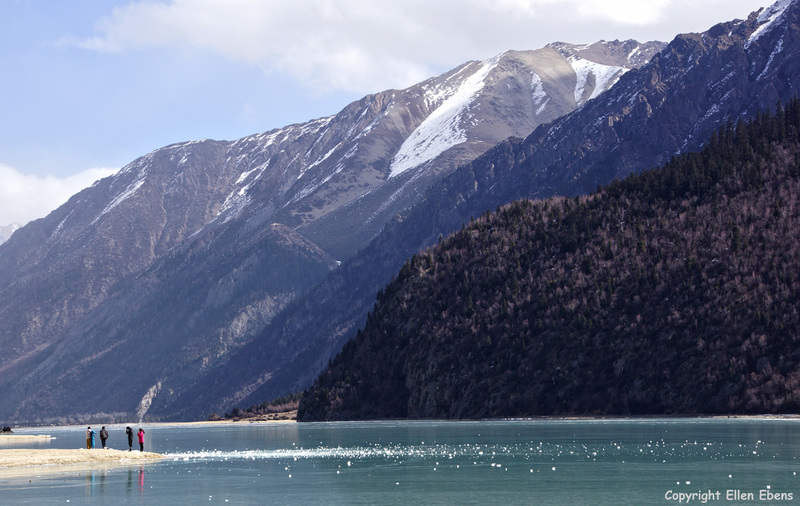 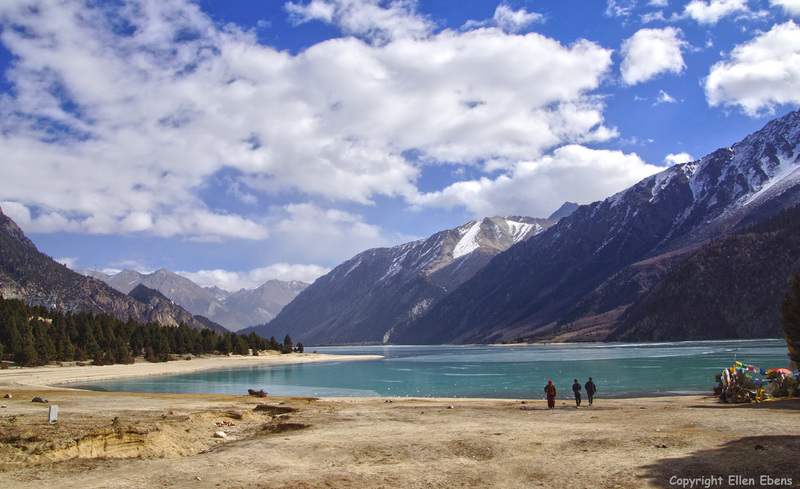 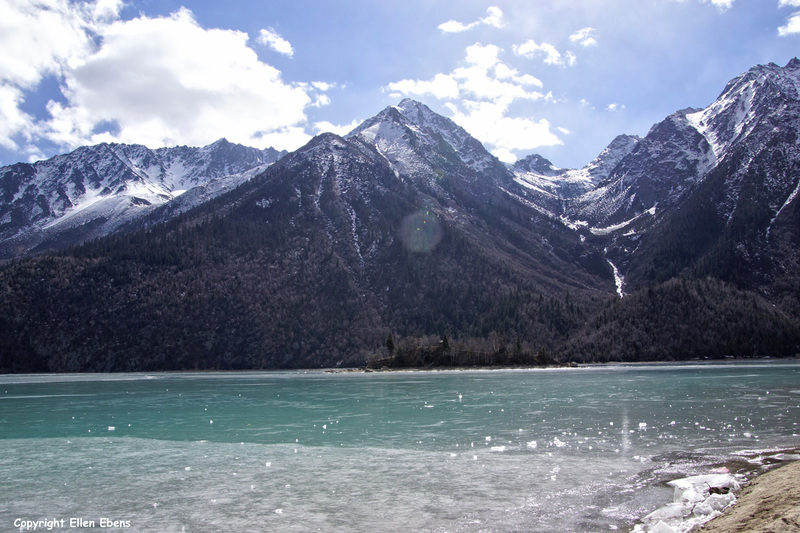 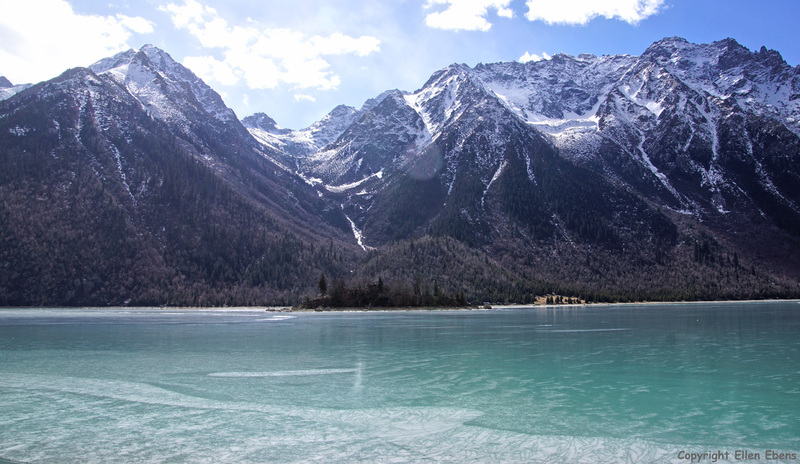 The frozen lake at the little town of Nage in eastern Tibet. 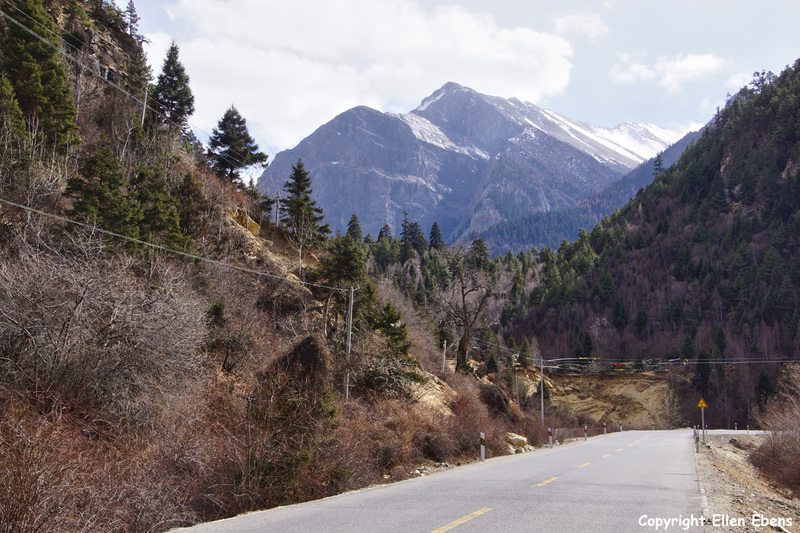 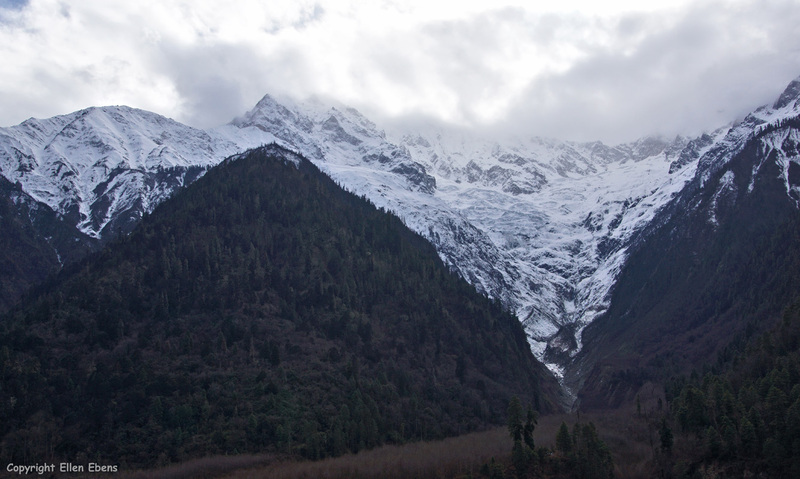 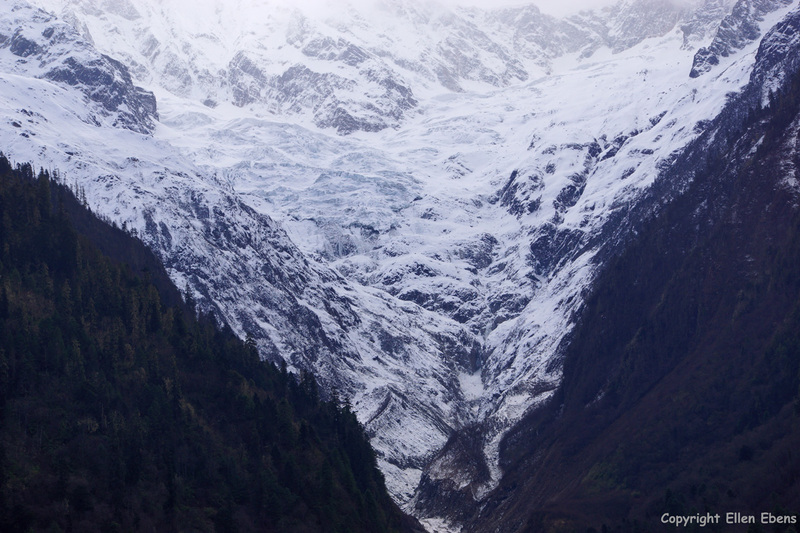 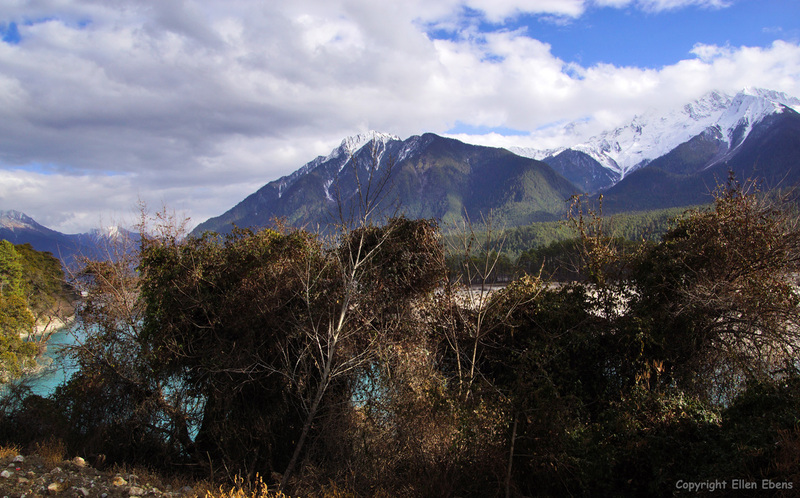 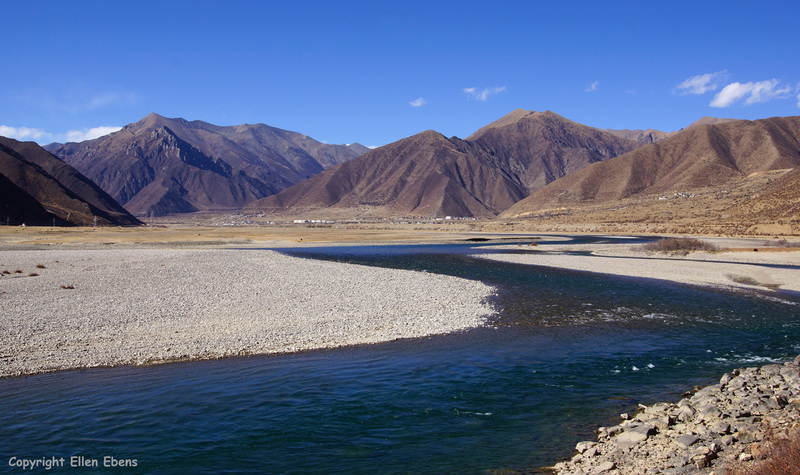 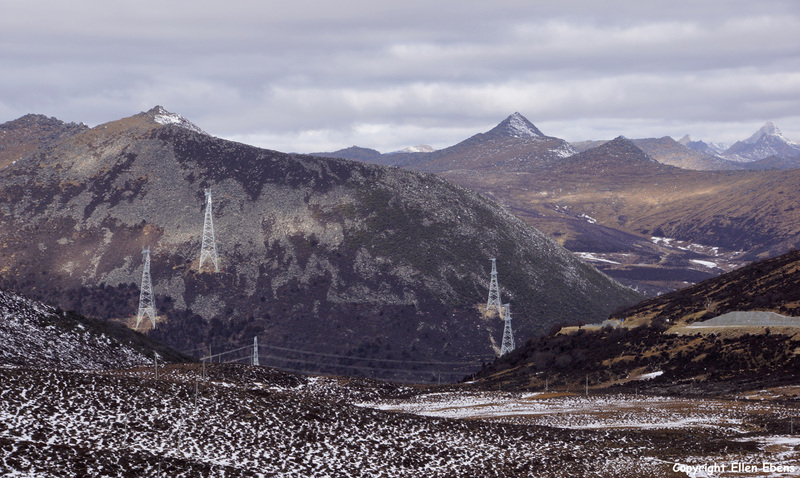 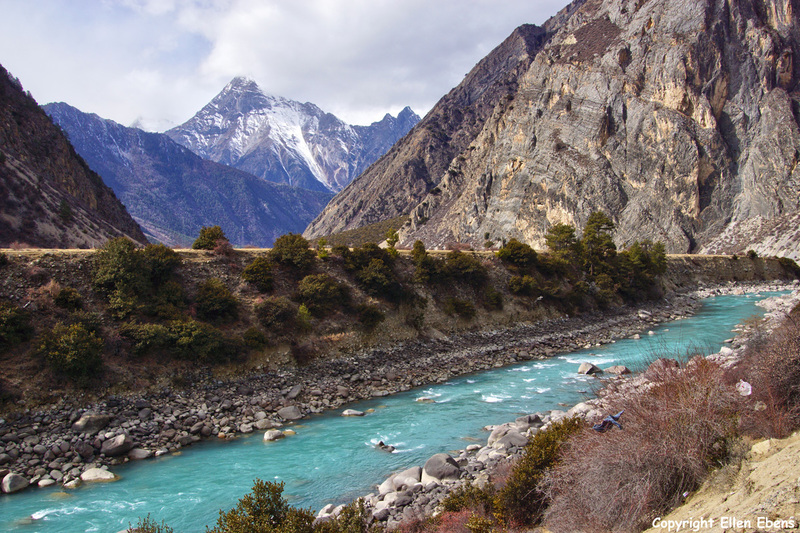 Driving through a beautiful river valley with white mountain tops and glaciers in eastern Tibet. 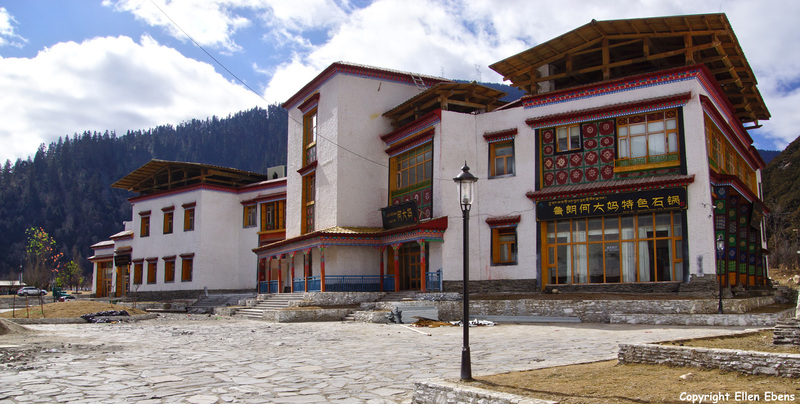 The newly constructed monastery at Bome (Pome). 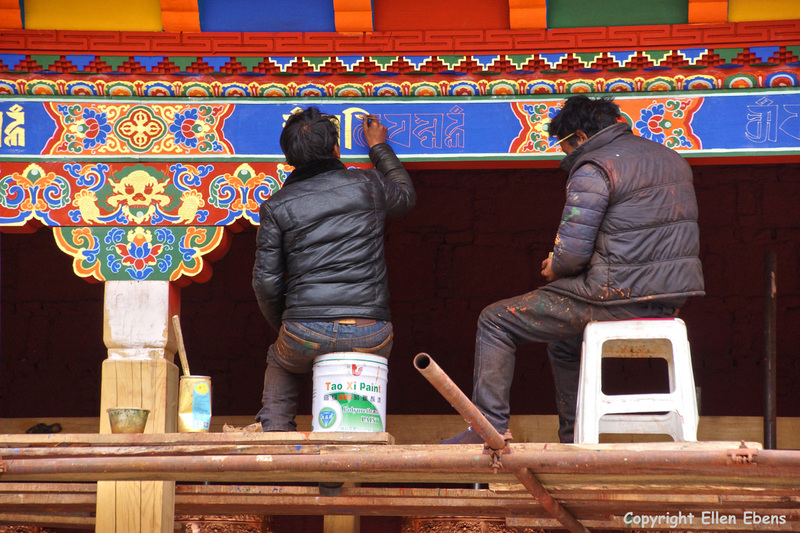 They were busy painting the gompa. 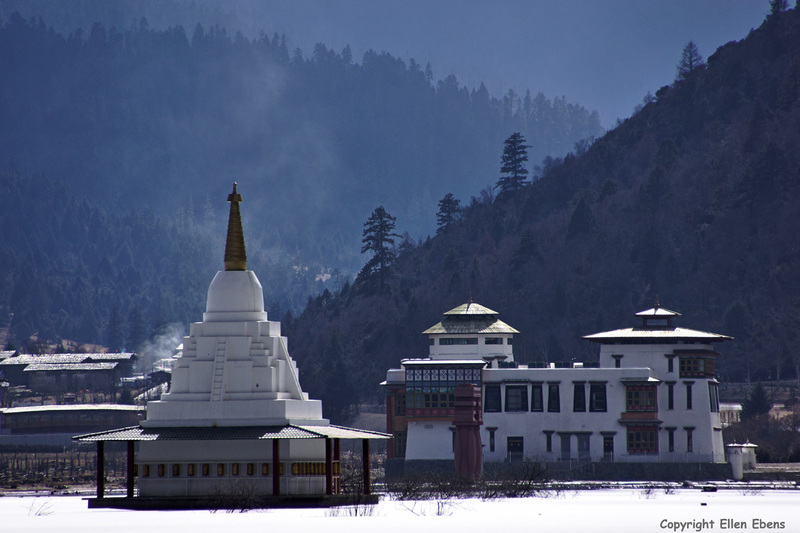 The newly constructed monastery at Bome (Pome). 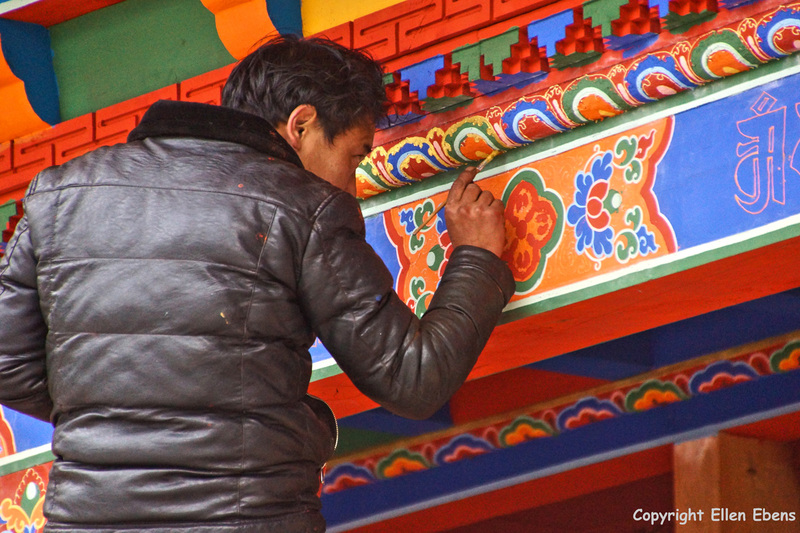 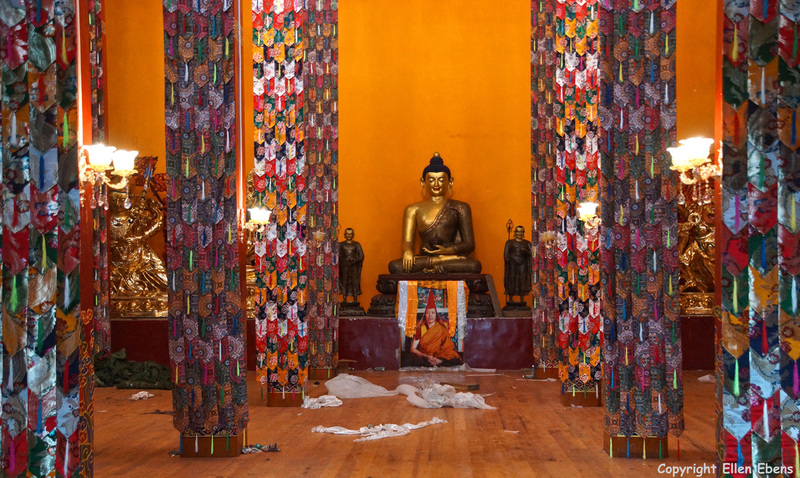 The gompa is being decorated. 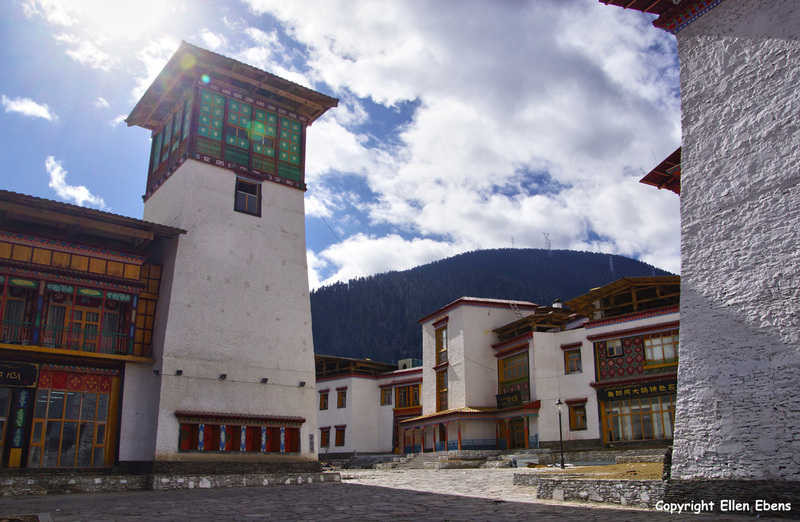 The newly constructed monastery at Bome (Pome). 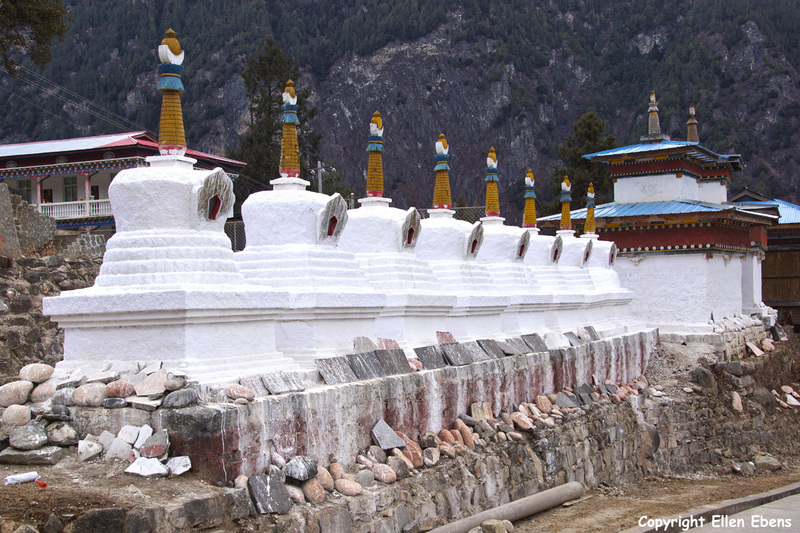 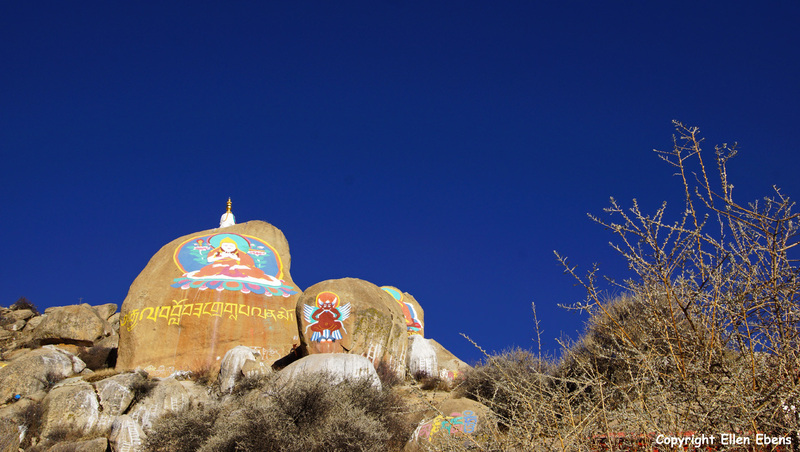 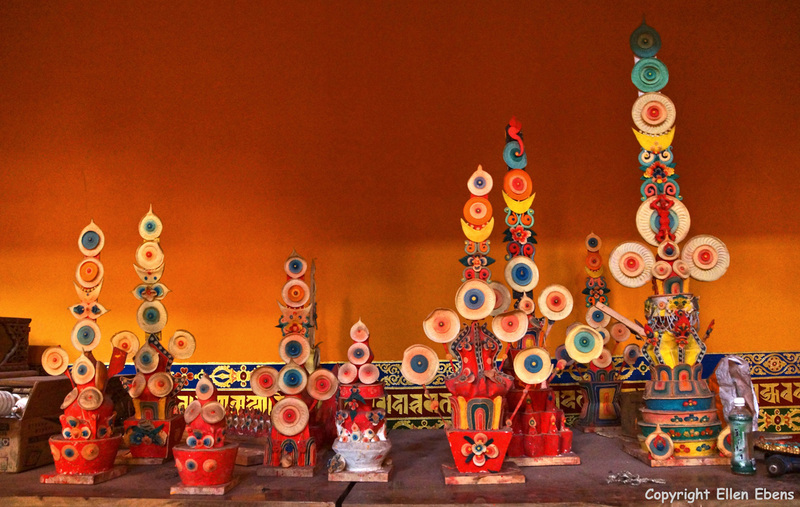 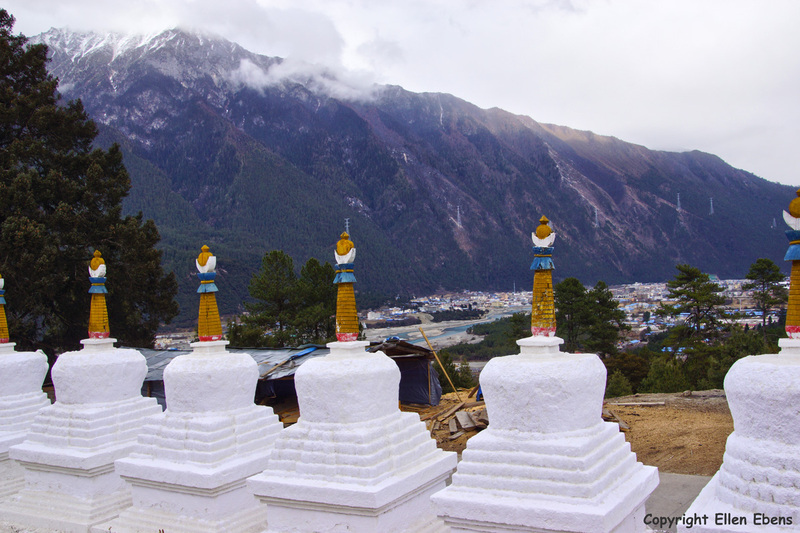 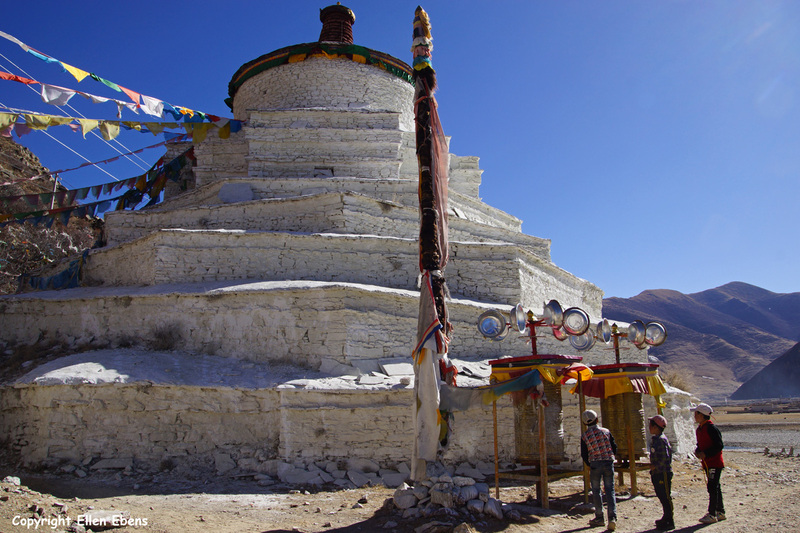 Stupas at the monastery at Bome (Pome). 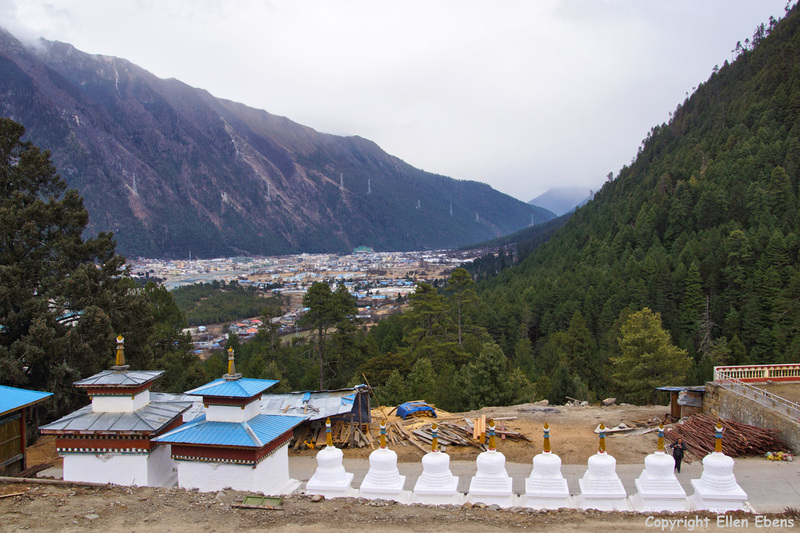 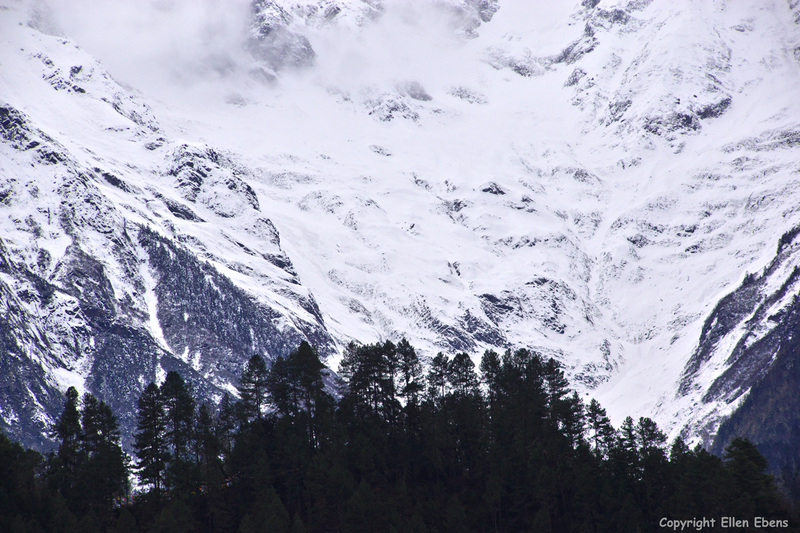 View from the monastery on the town of Bome (Pome).